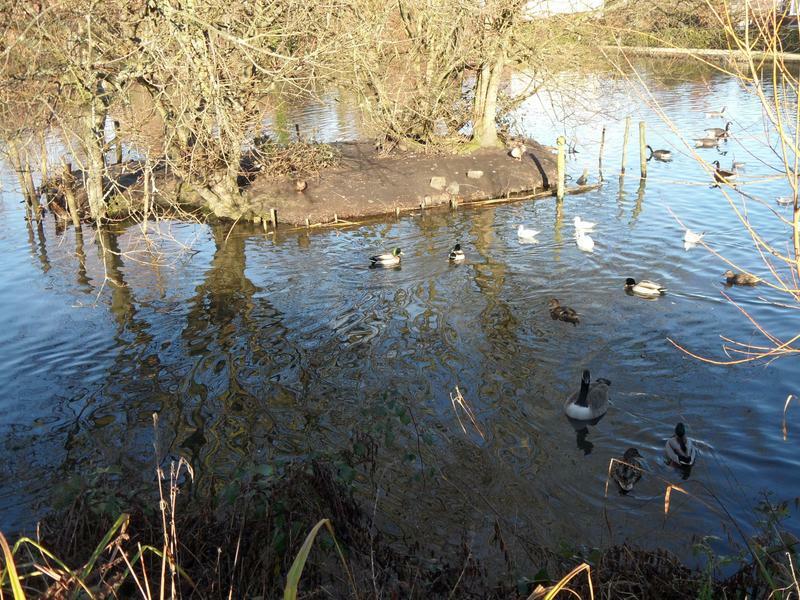 21st January 2014, a sunny day between storms, all the usual Mallards, Canada Geese and Coots are here. 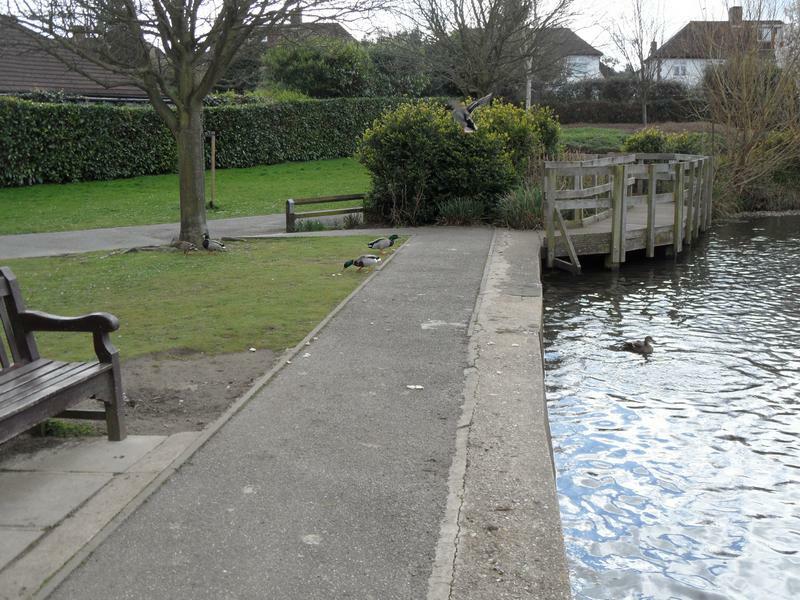 Behind the large island are some Mandarin Ducks, a boy and girl here. 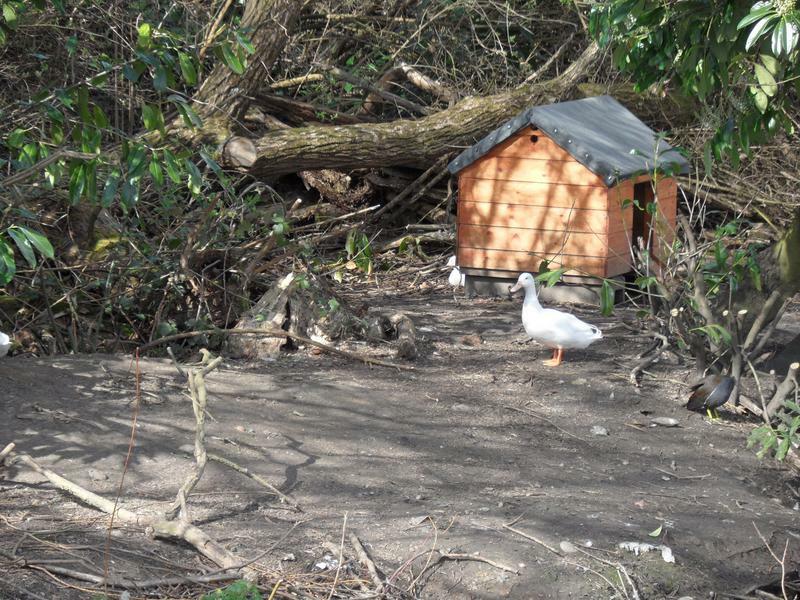 The White Duck family (with one dark duck) has remained together all winter, here start a little adventure on the large island. 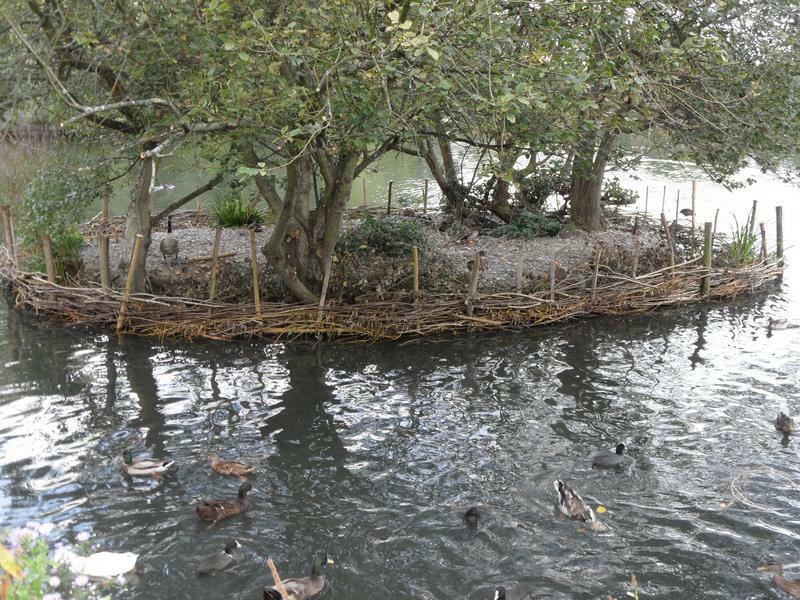 All four ducks are climbing a path up onto the island. 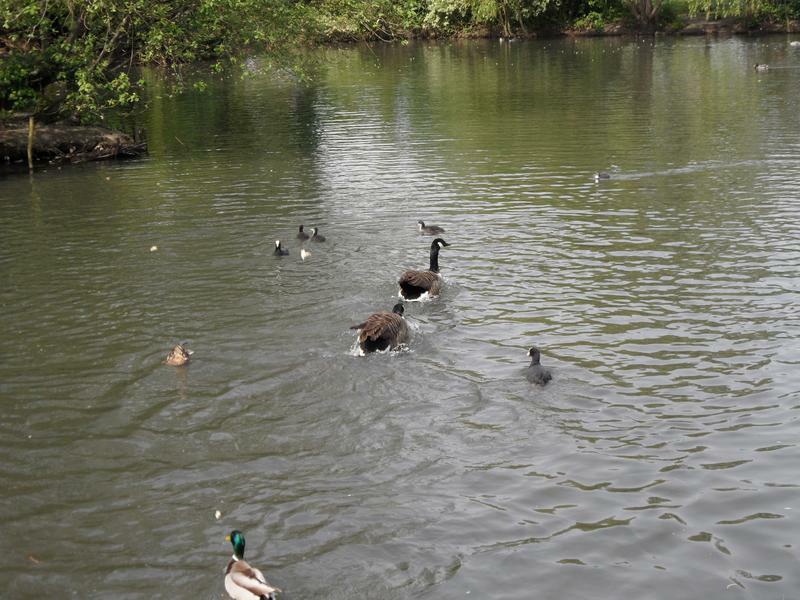 Follow the leader up the path, the Muscovy Duck tries to follow. 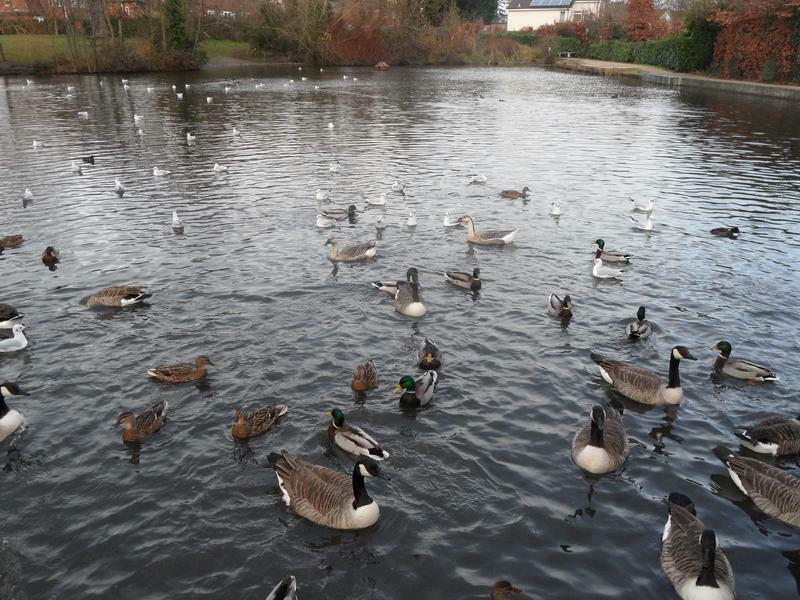 Various ducks, geese and sea birds on the pond. 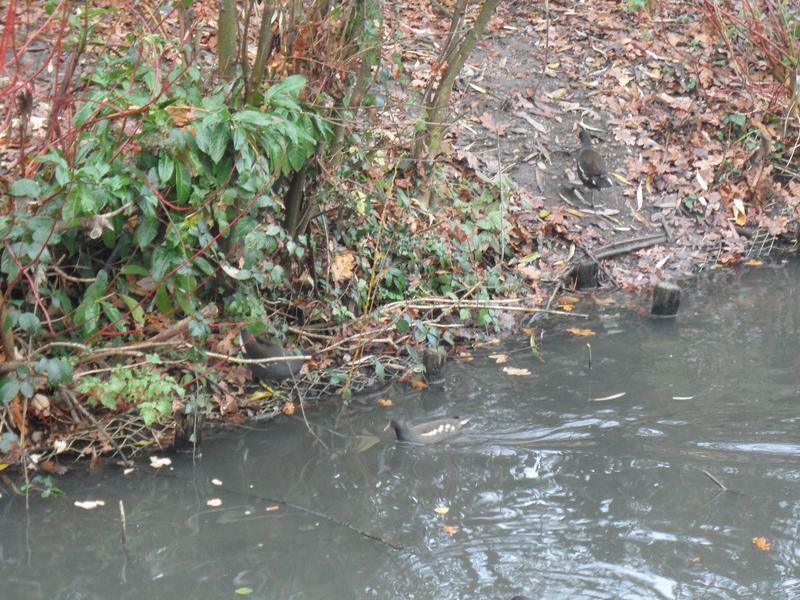 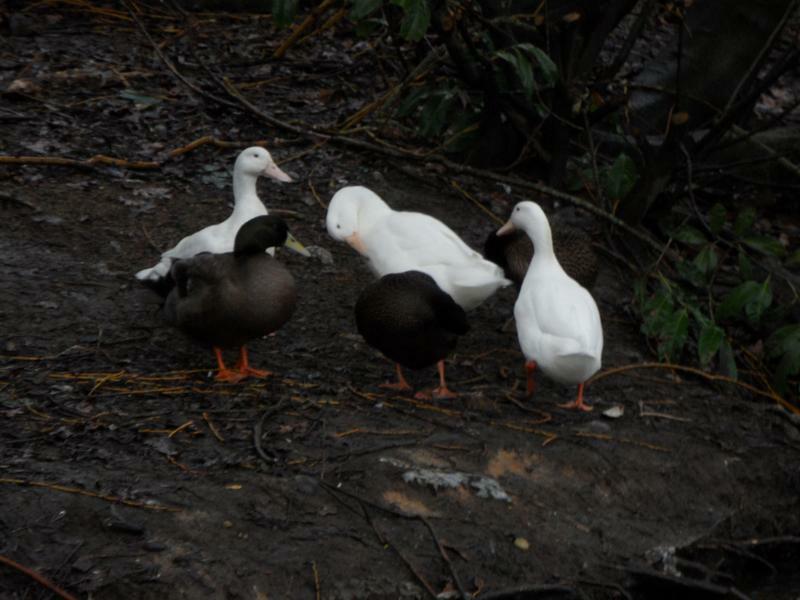 26th January 2014, a darker and wetter day, the White Ducks family heads our way for food. 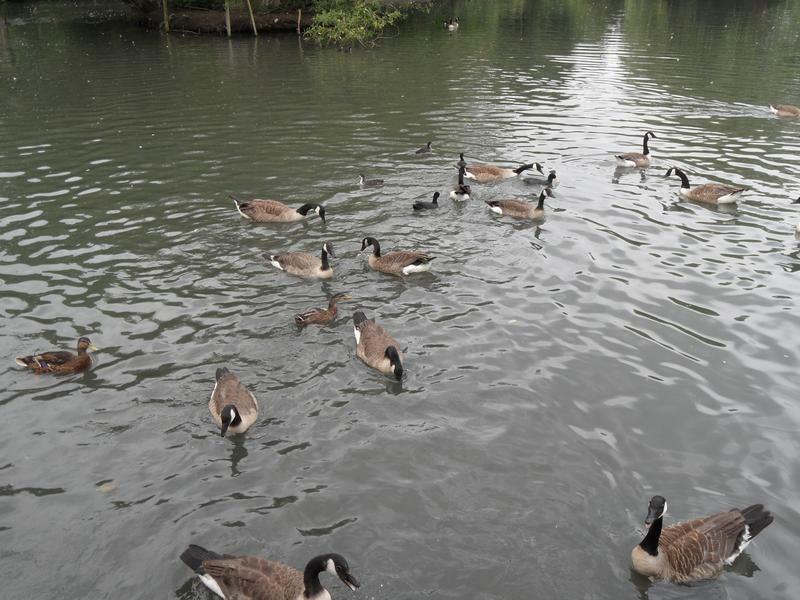 A lot of hungry Canada Geese, the rain means few park visitors visiting. 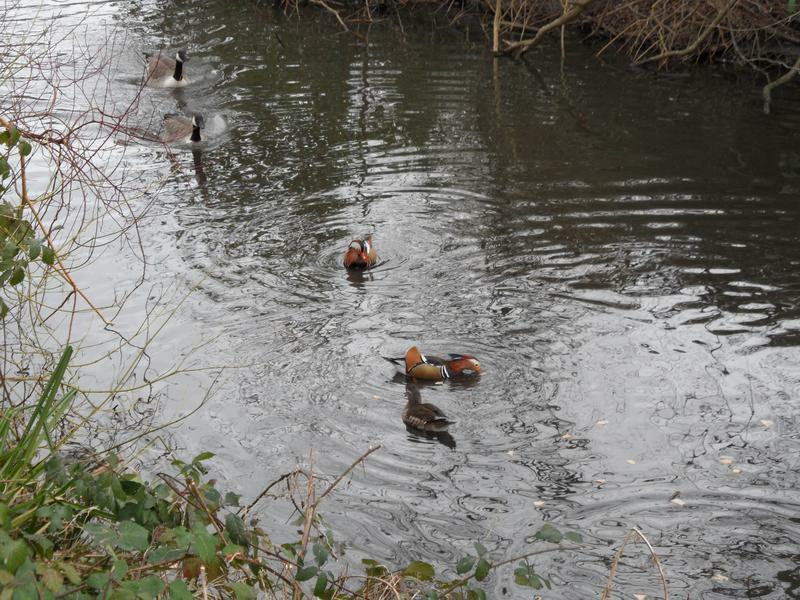 The Mandarin Ducks are still here. 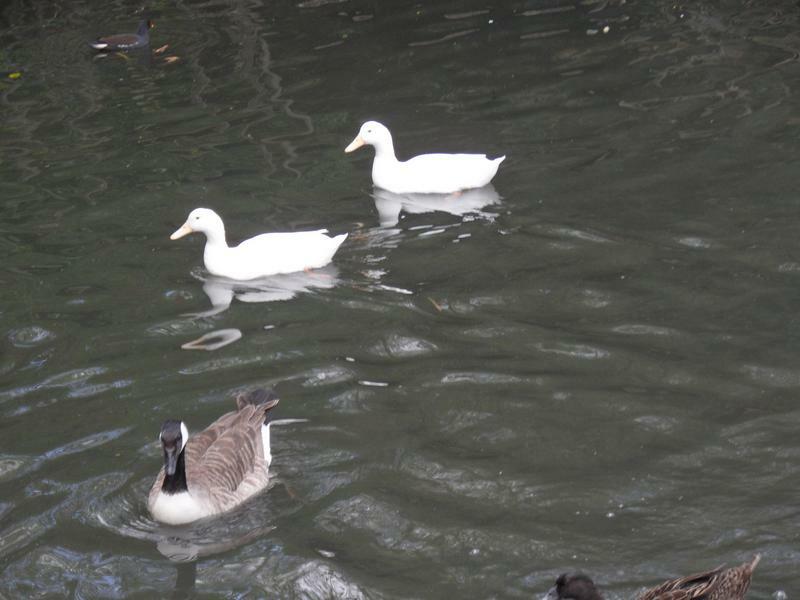 Having eaten, the White Duck Family heads back to the large island. 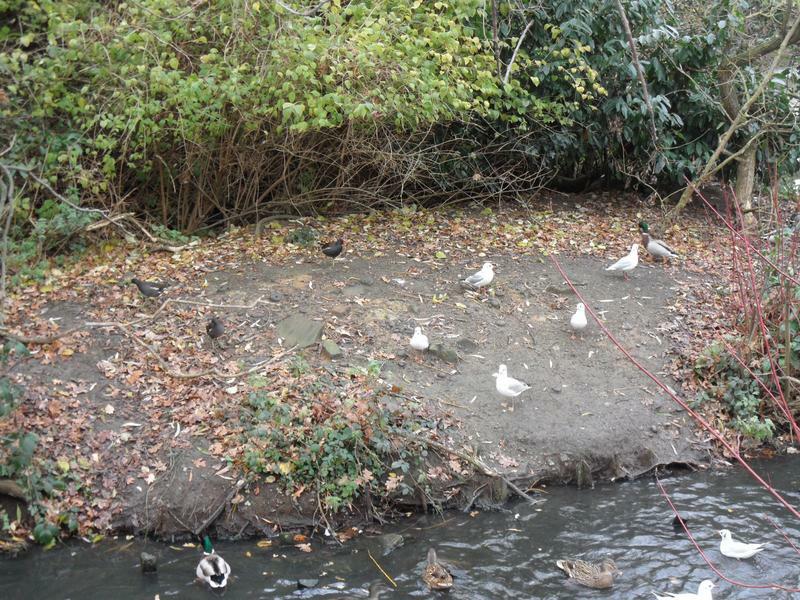 While the rest of the birds look for more food. 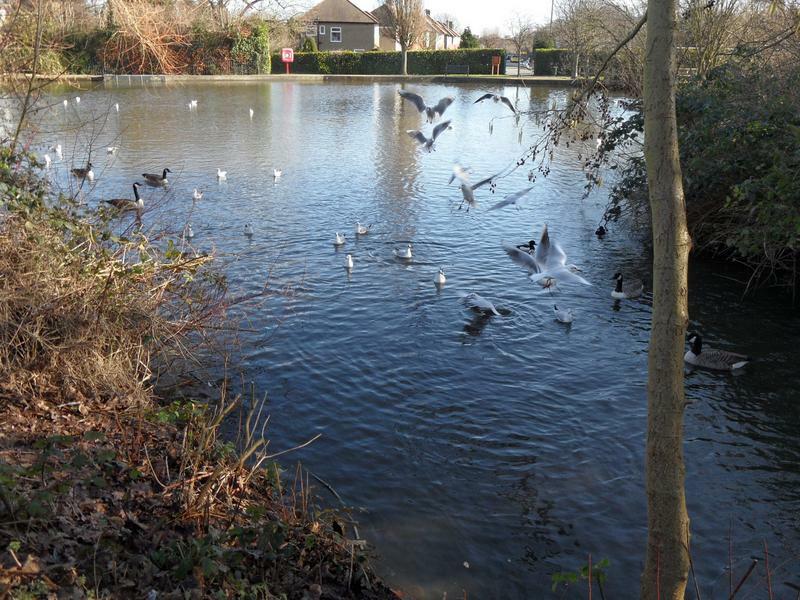 16th February 2014, a brighter day, still a lot of sea gulls here. 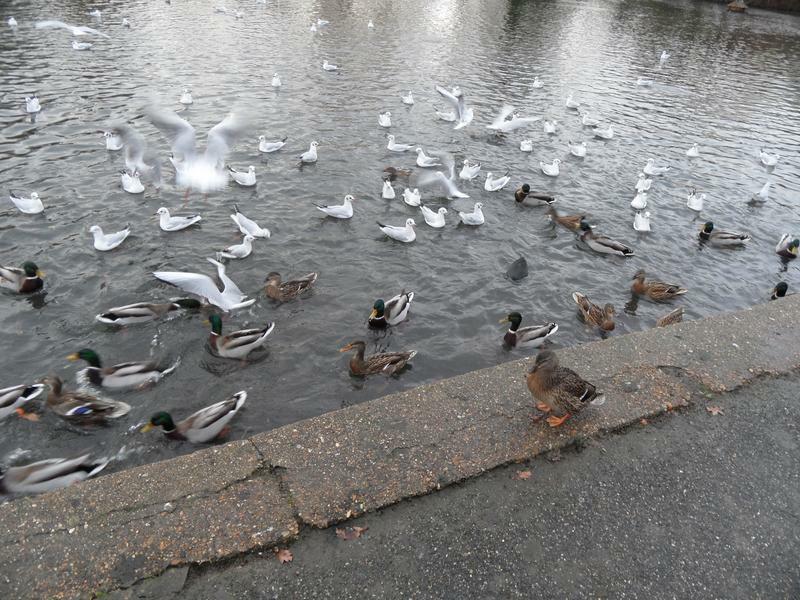 The sea gulls keep taking food for ducks and geese. 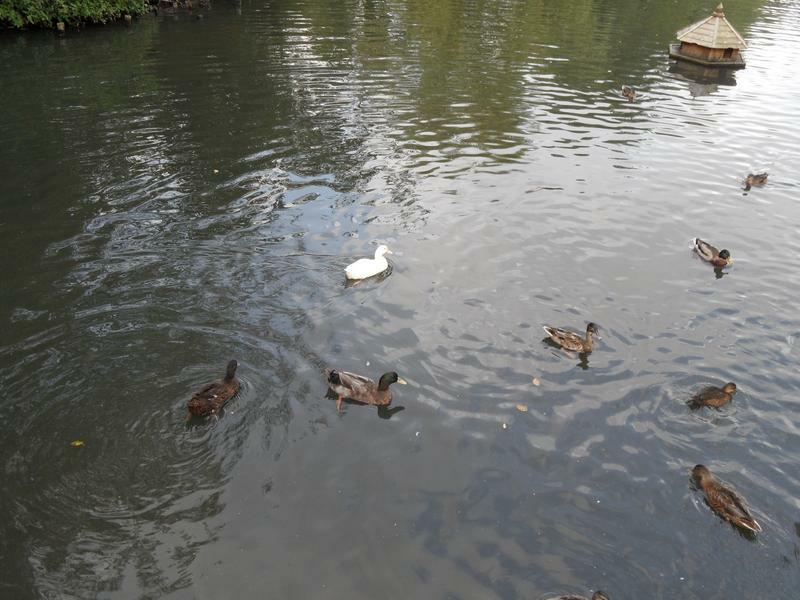 the White Duck family swimming behind the large island. 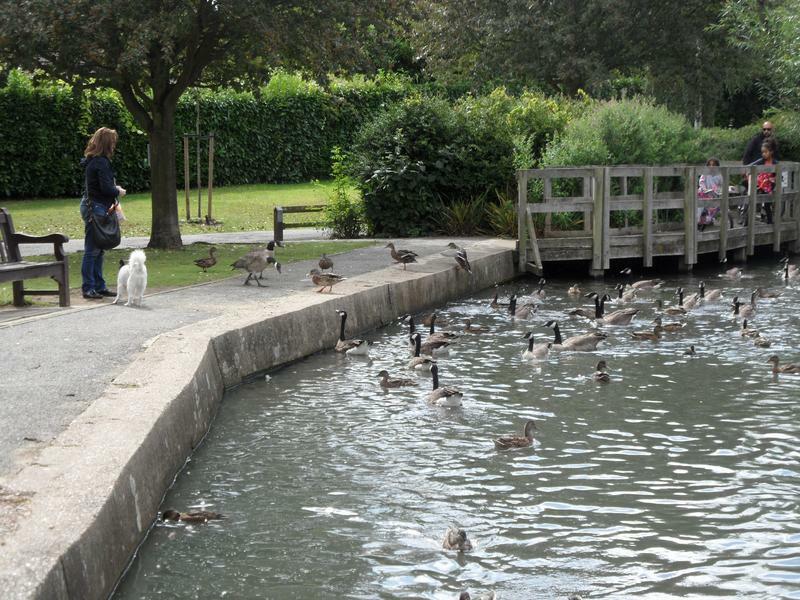 More people visiting the park so the birds are less hungry. 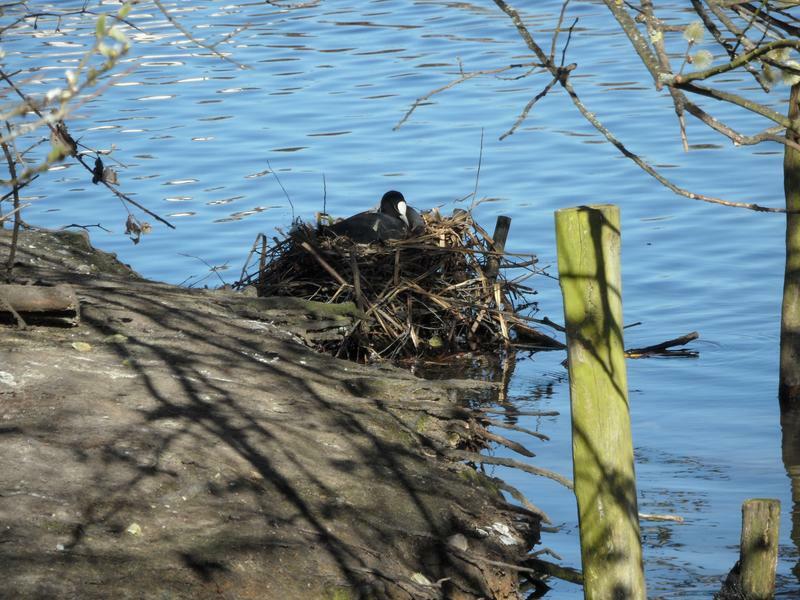 One of the nesting boxes seems to have several large eggs, although it's really too early for nesting and they seem abandoned. 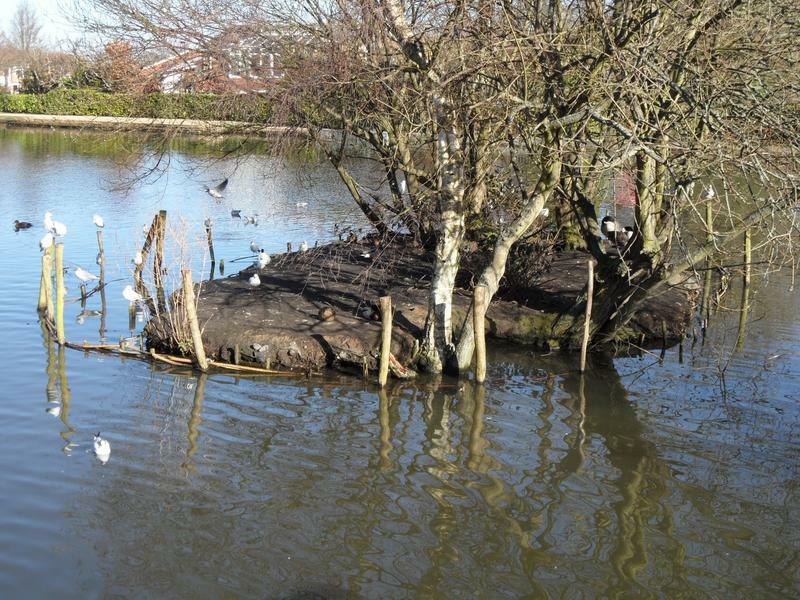 The small island still seems to be eroding despite the new surrounding fence. 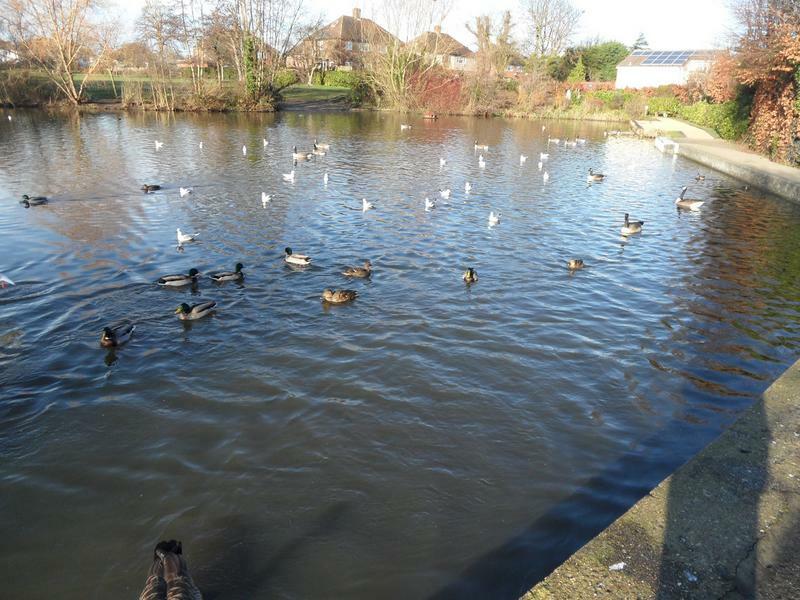 2nd March 2014, all the usual Mallards, Canada Geese, Coots, Tufted Ducks and Moorhens. 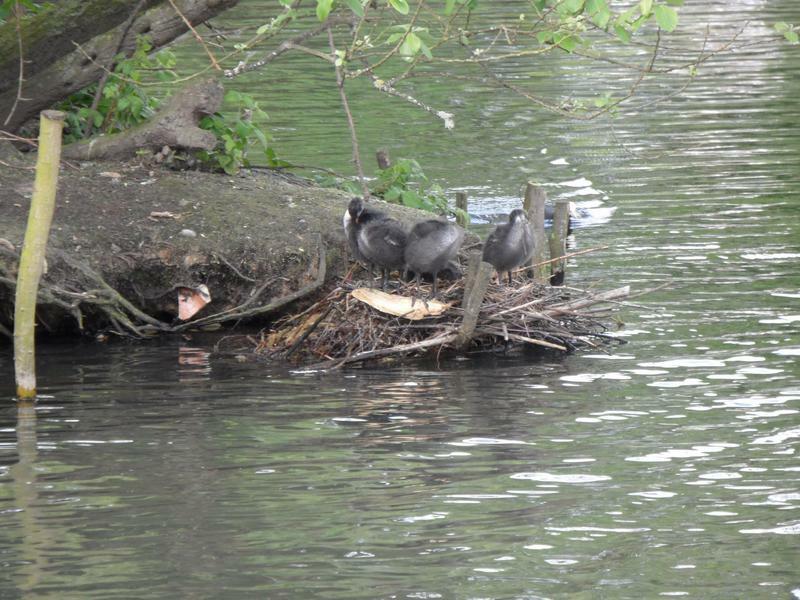 One of the Coots has built herself a nest on the small island, and is hopefully incubating eggs. 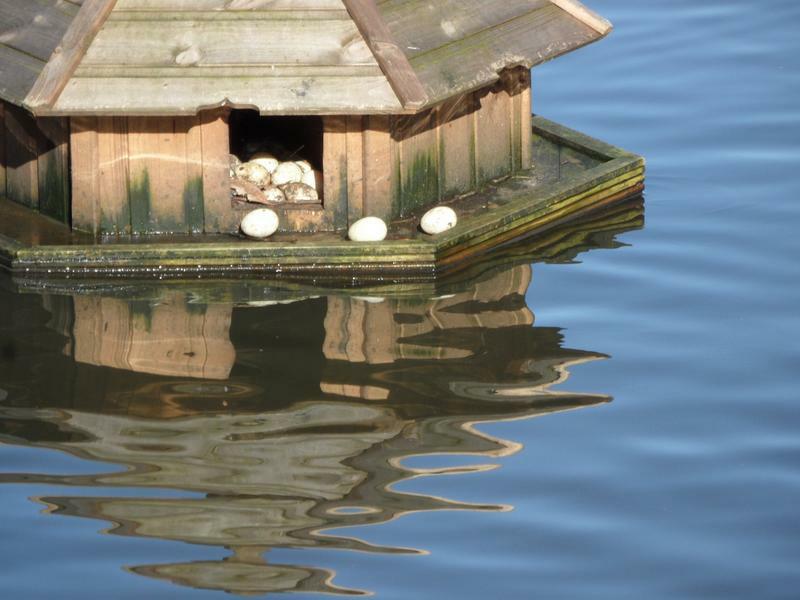 Still seem to be abandoned eggs in the nesting box. 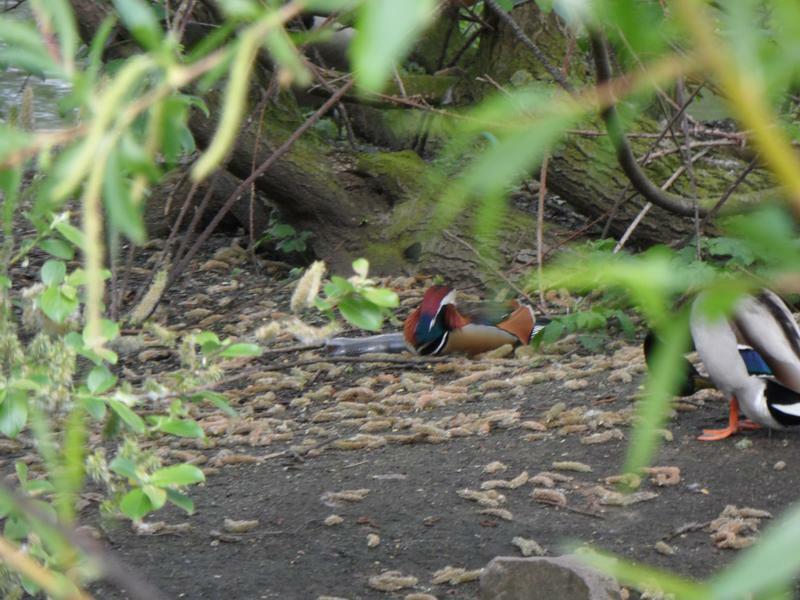 Two pairs of Mandarin Ducks on the large island, hopefully they will nest. 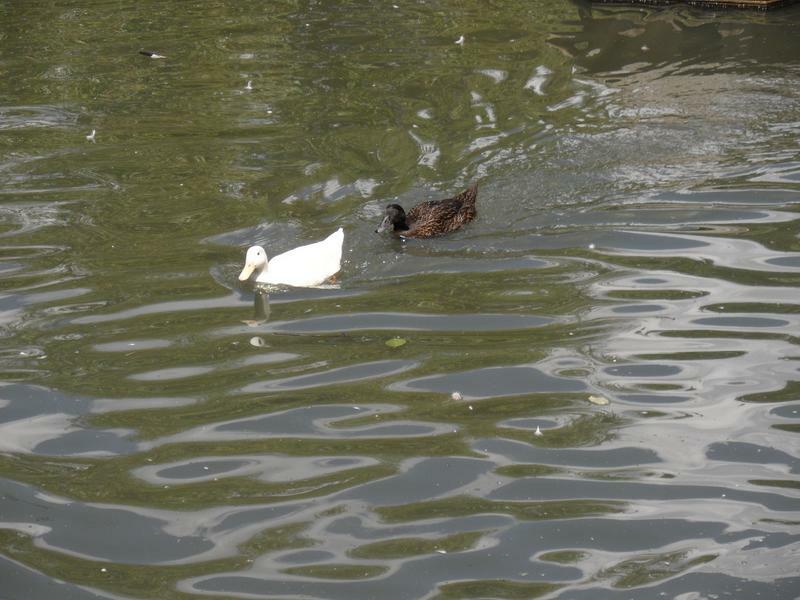 And hungry, come out for food. 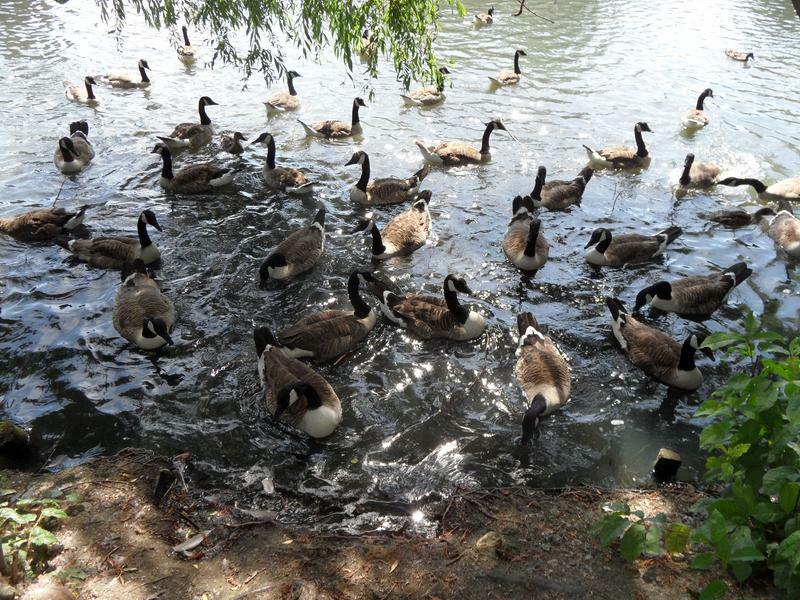 It's breeding time for the geese as well, so very noisy as they chase each other around the pond. 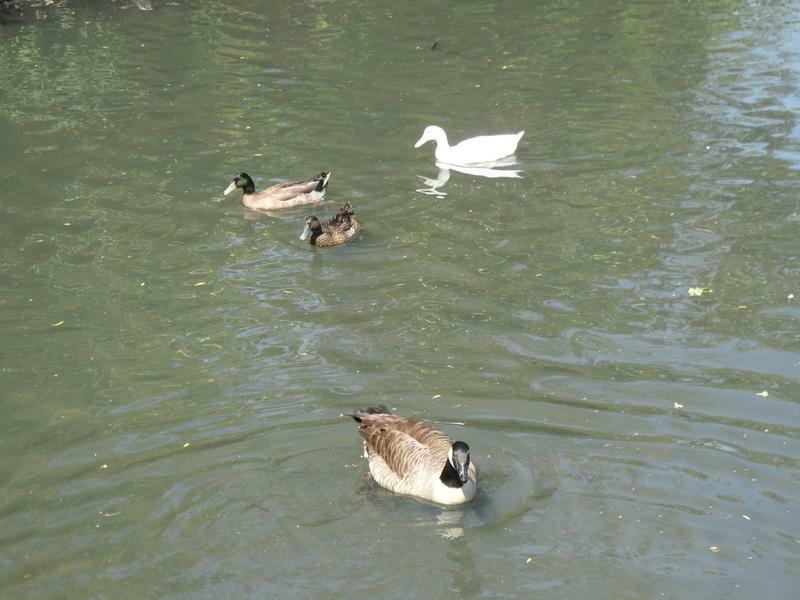 The White Duck family ignore the rest of the birds on the pond. 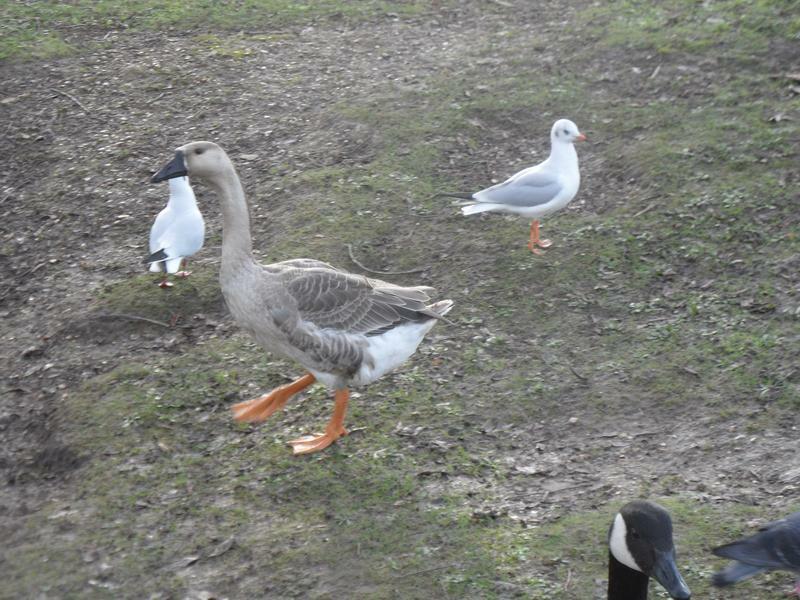 16th March 2014, warmer and drier weather, all the sea gulls seem to have left, and not many geese here either. 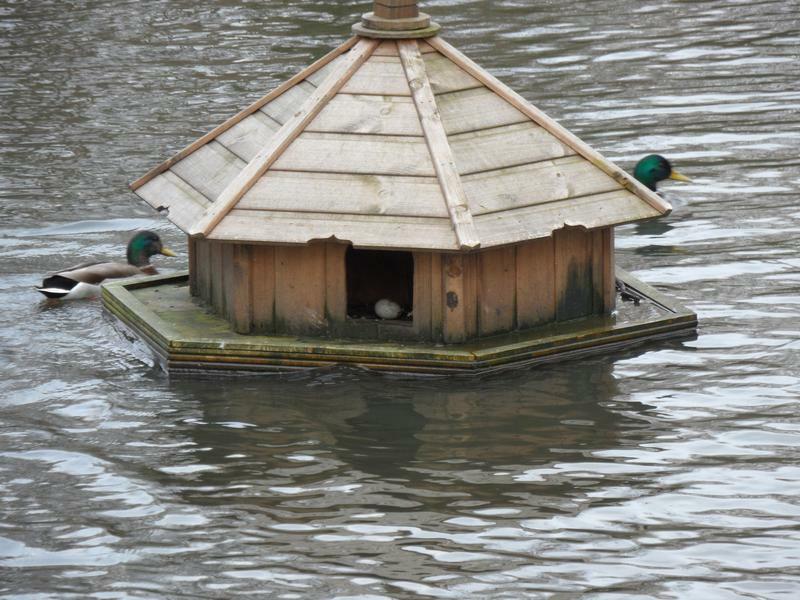 The new nesting box on the large island. 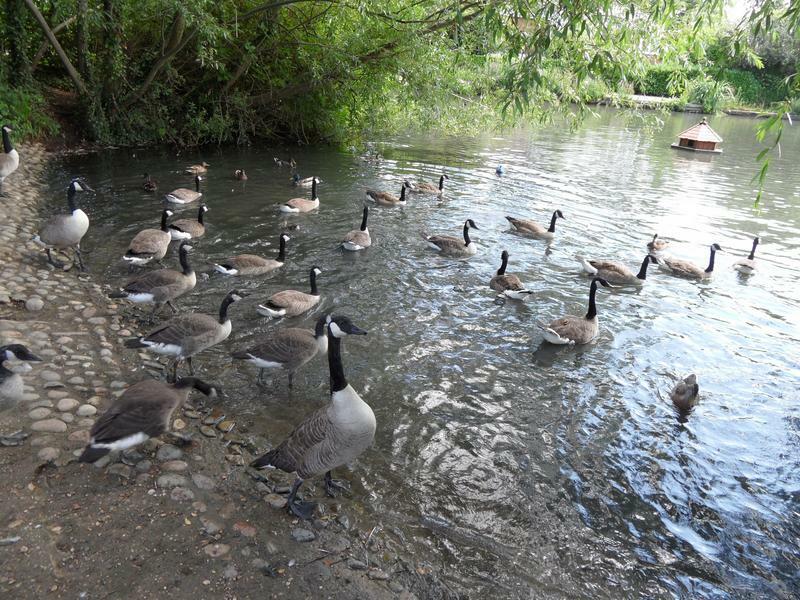 A few quiet geese, don't seem very hungry. 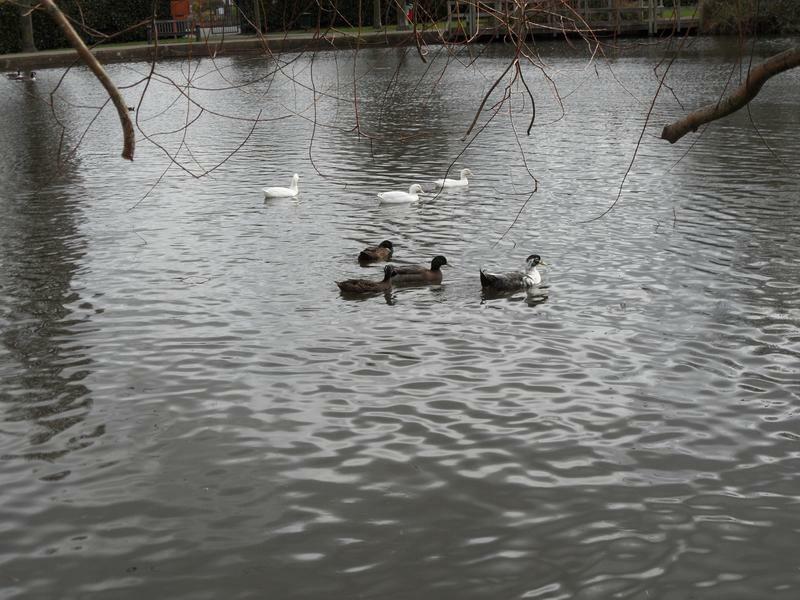 The White Duck family in the distance, but they don't seem hungry either. 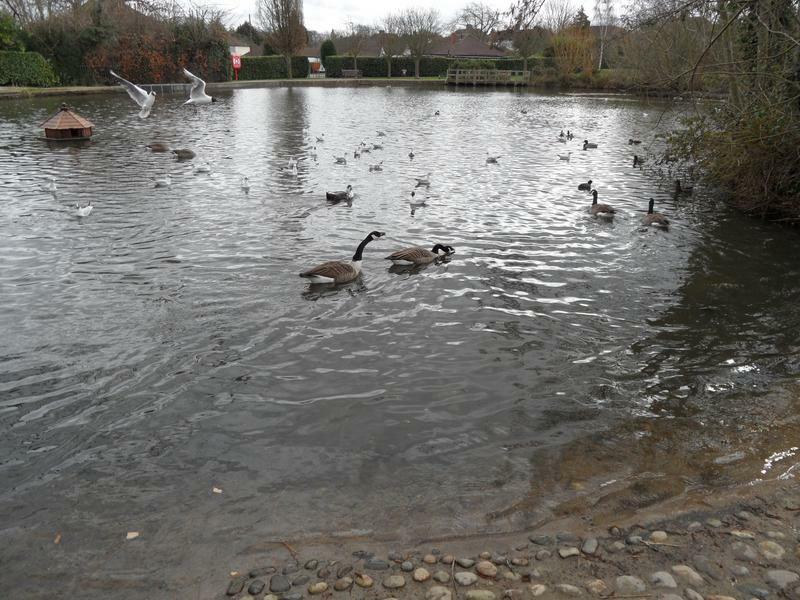 Some of the geese are thinking about nests on the large island. 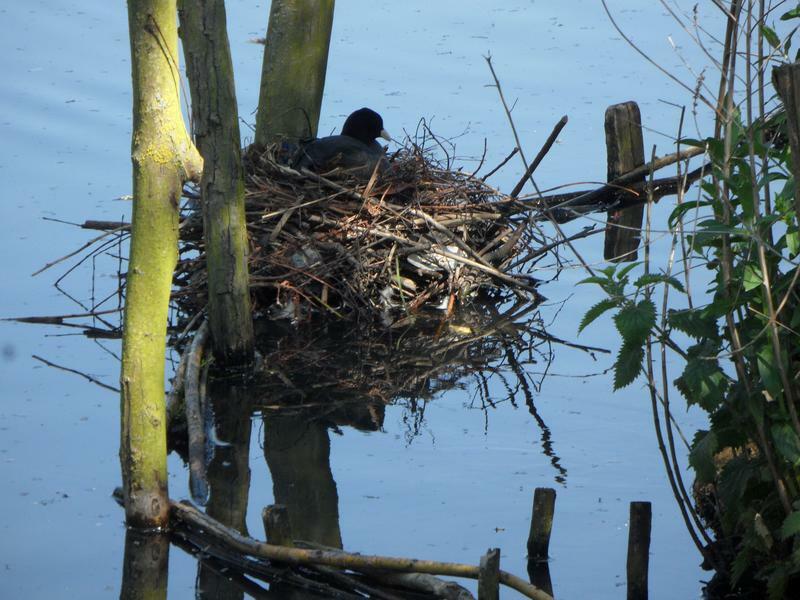 The Coot is still sitting on her nest. 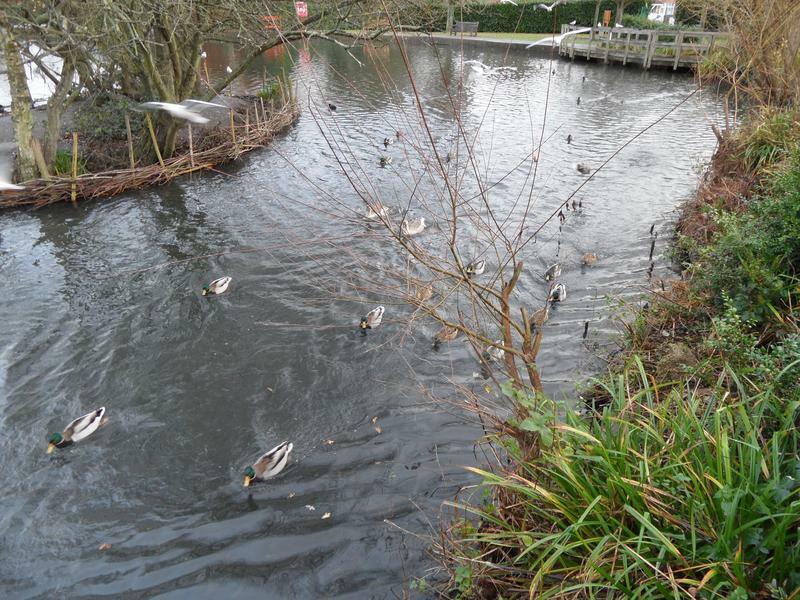 23rd March 2014, the ducks seem more hungry this week, getting out of the water looking for food. 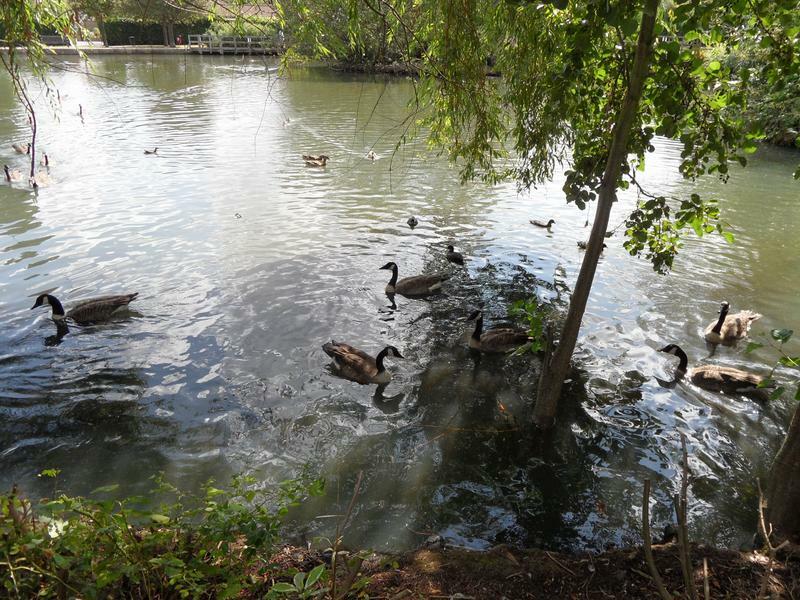 While a lot of geese have returned to the pond, and follow us around looking for more food. 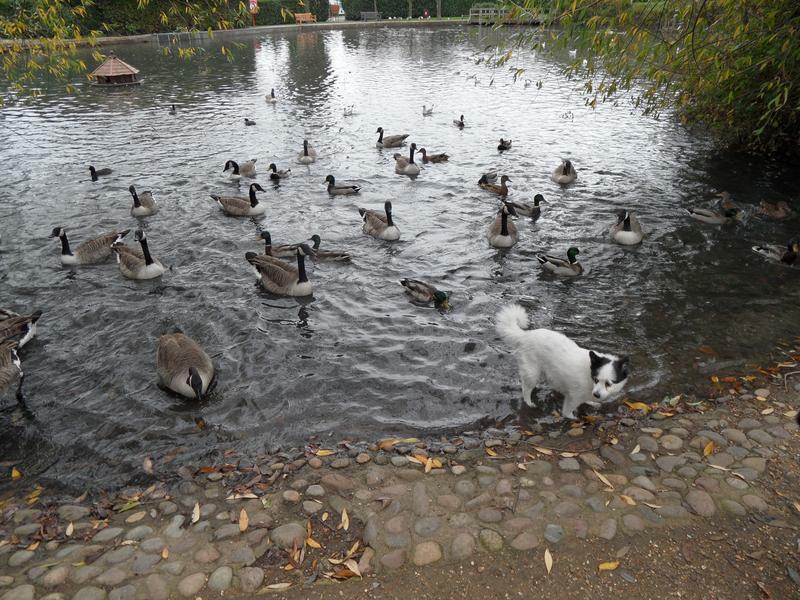 Lucy the dog gets a drink from the pond. 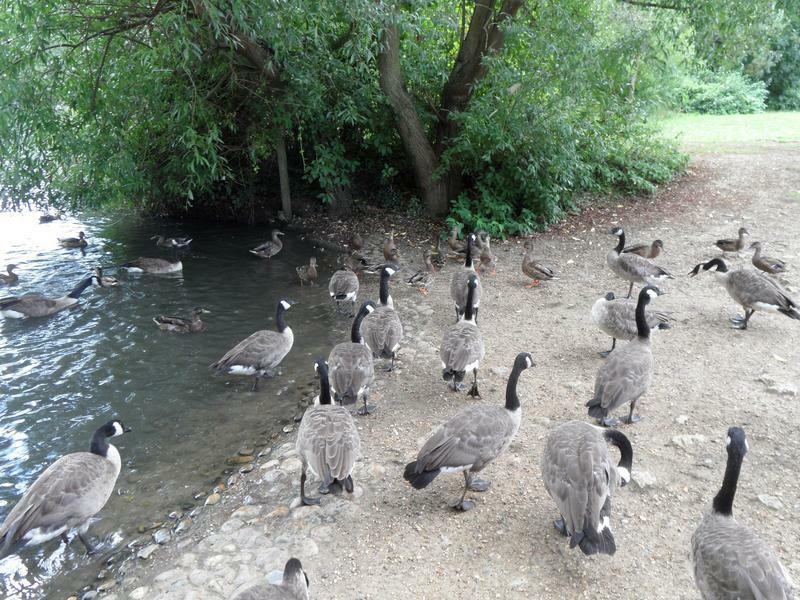 More geese waiting for food. 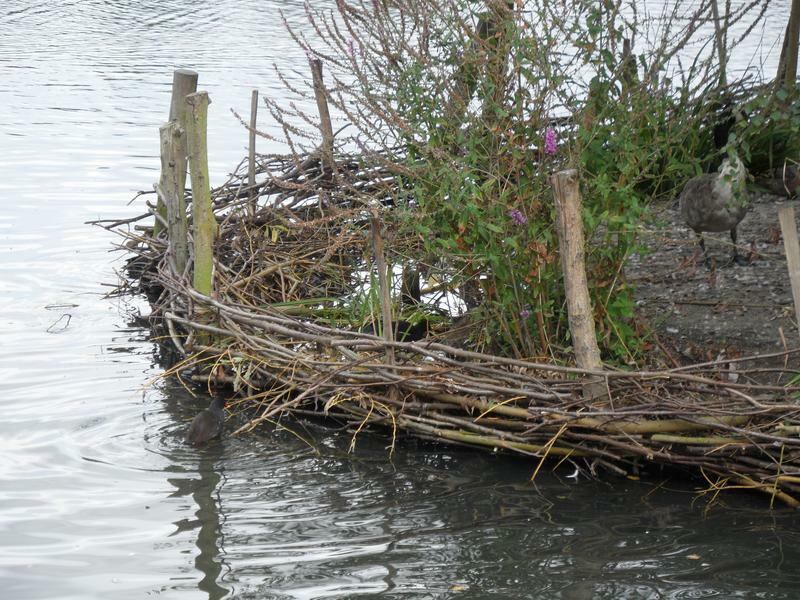 The massive nest the Coot has built. 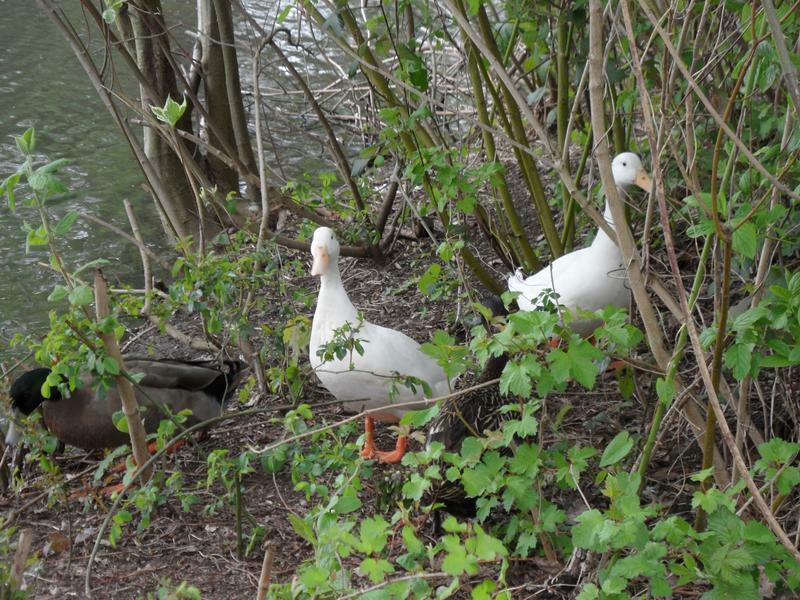 The White Duck family are variously wandering around the island, no idea why. 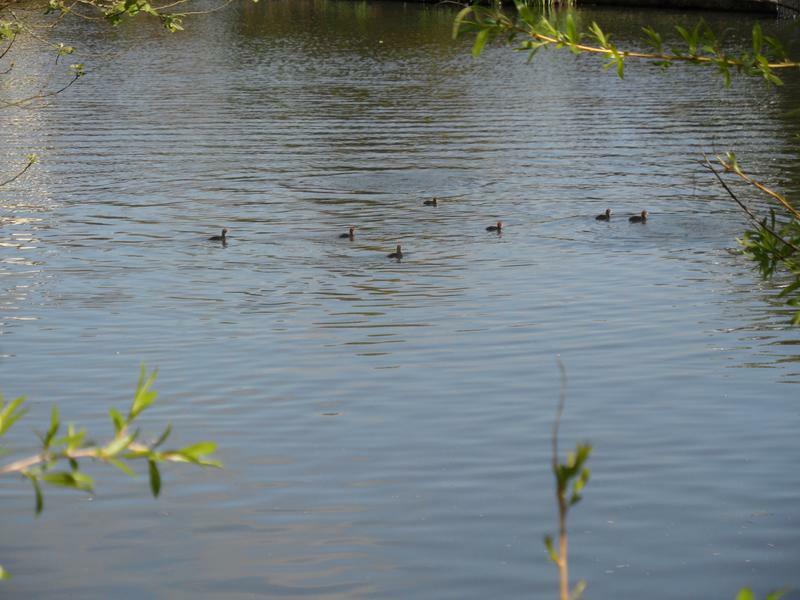 13th April 2014, the first ducklings at Millers Pond, a Coot family of seven chicks. 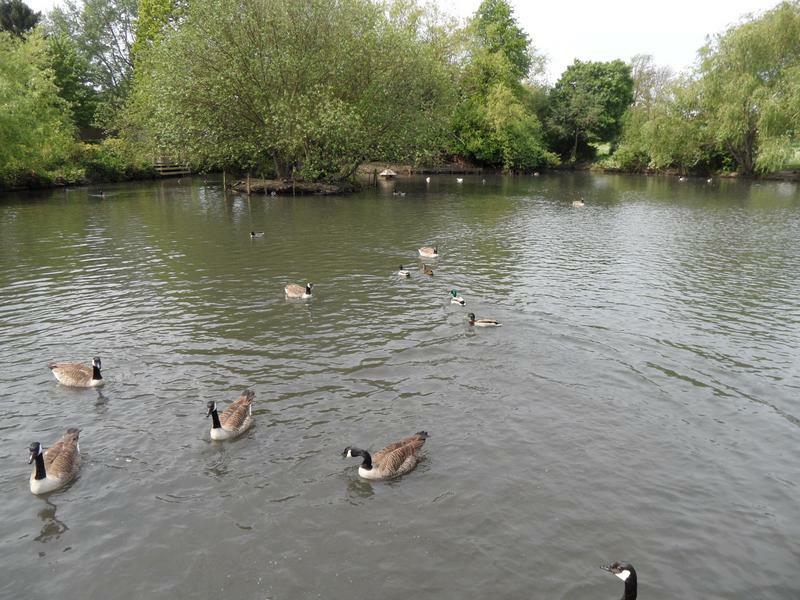 The pond is reasonably quiet today. 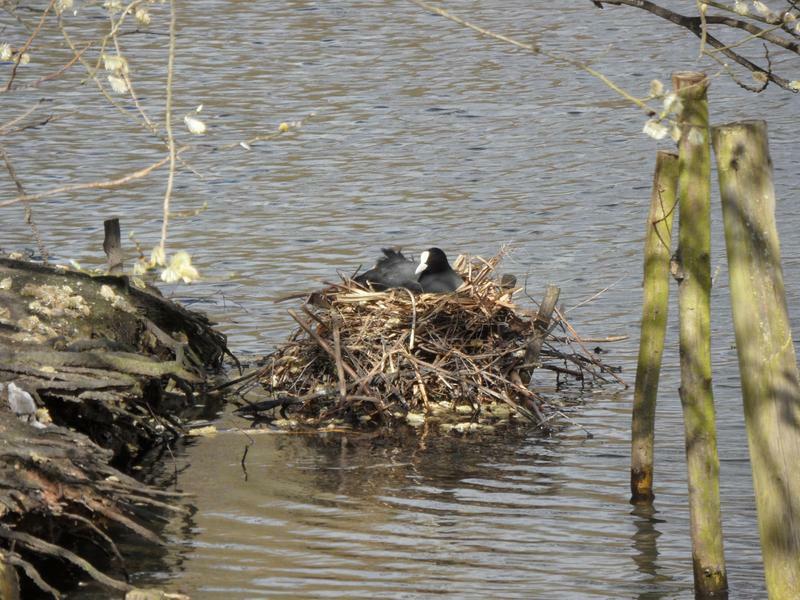 The Coot family is back on the island near their nest. 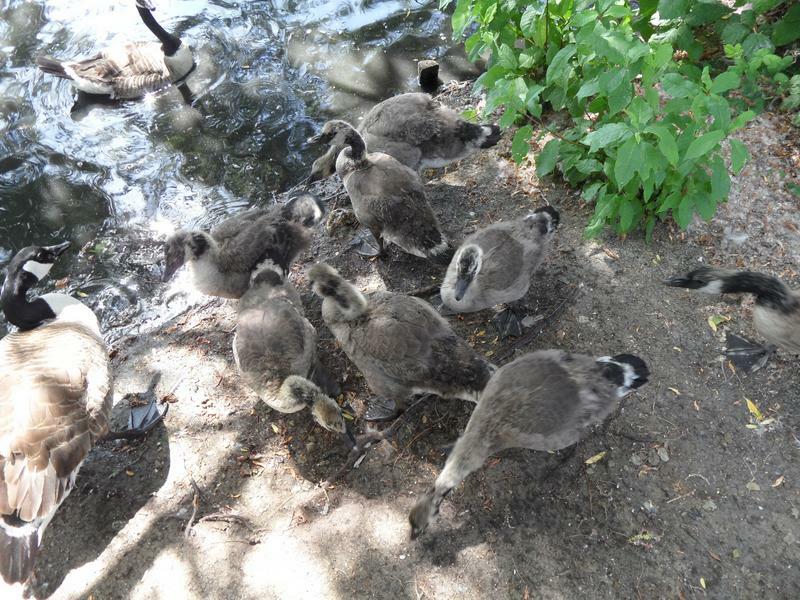 And now most of them have climbed onto the nest. 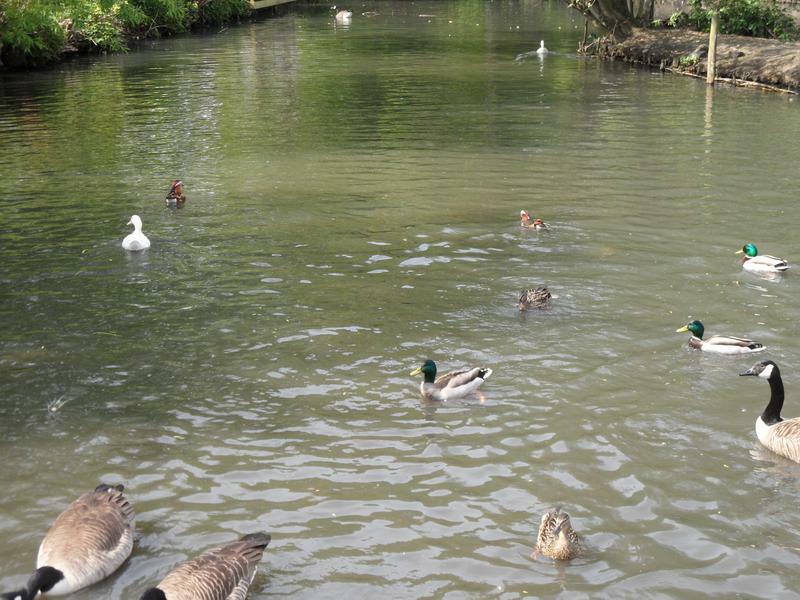 But not for long, now swimming across the pond again. 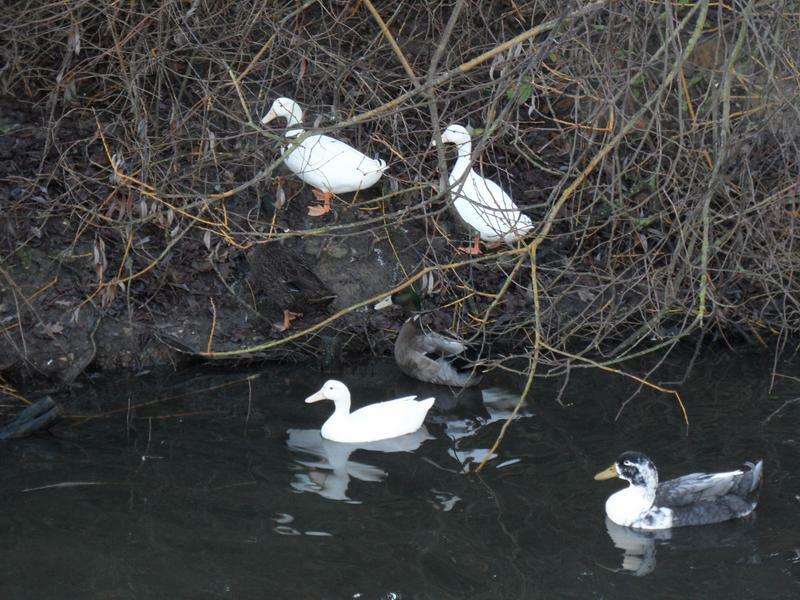 Still only two White Mallards here. 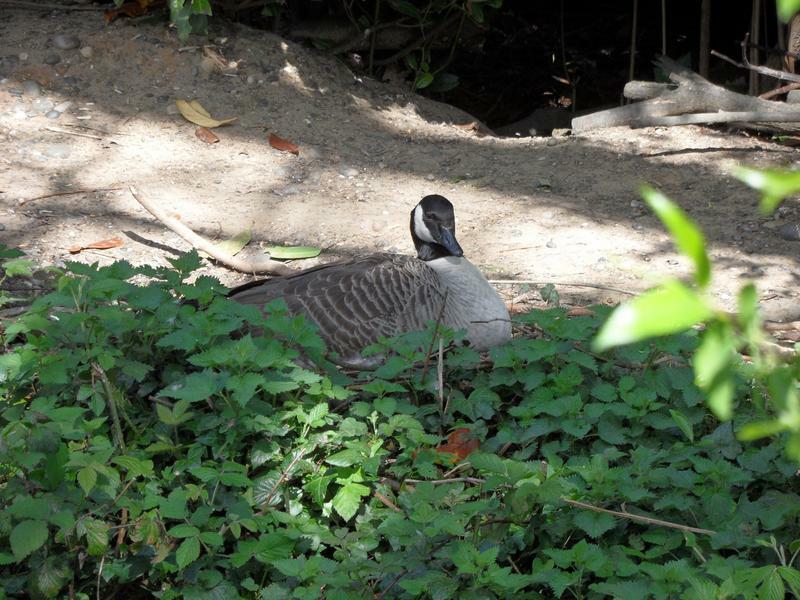 A Canada Goose sitting on her nest on the large island. 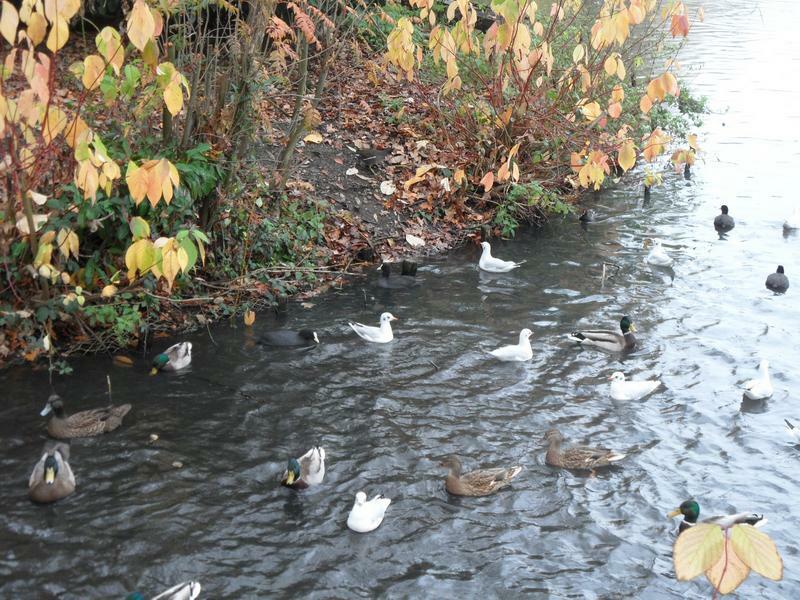 The White Mallards are now behind the island. 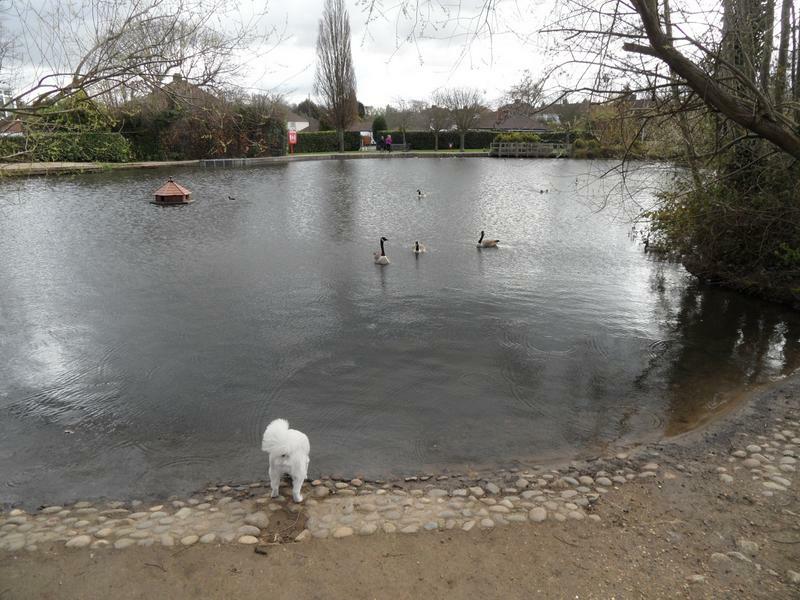 19th April 2014, still quiet here. 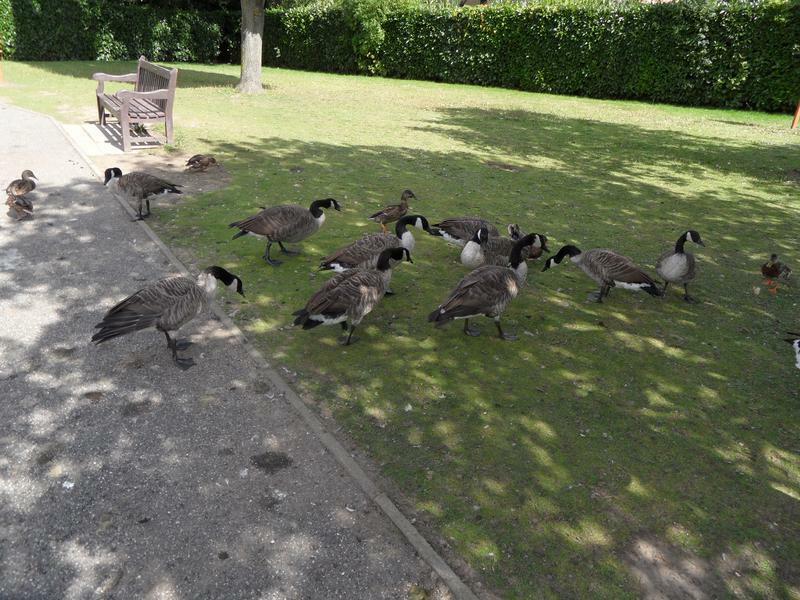 no-one rushing for food. 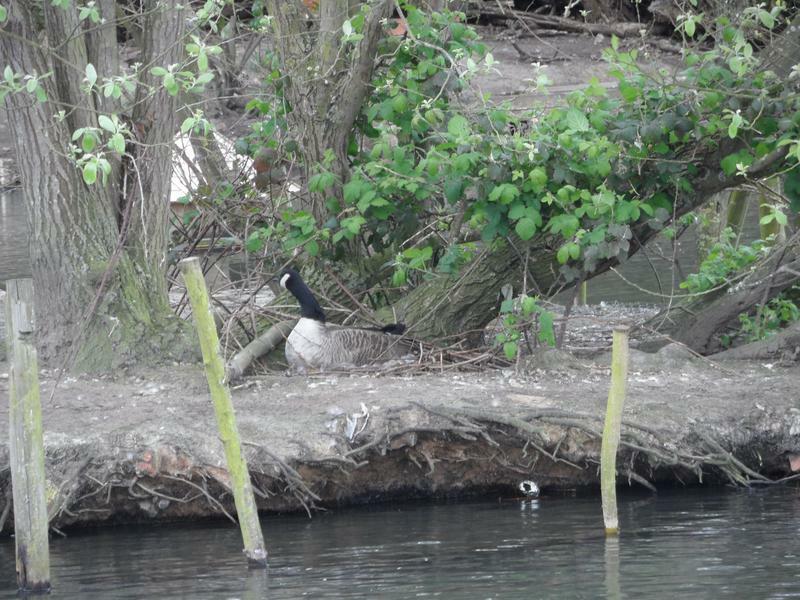 A Canada Goose sitting on the small island, not sure if this is a nest, not much to it. 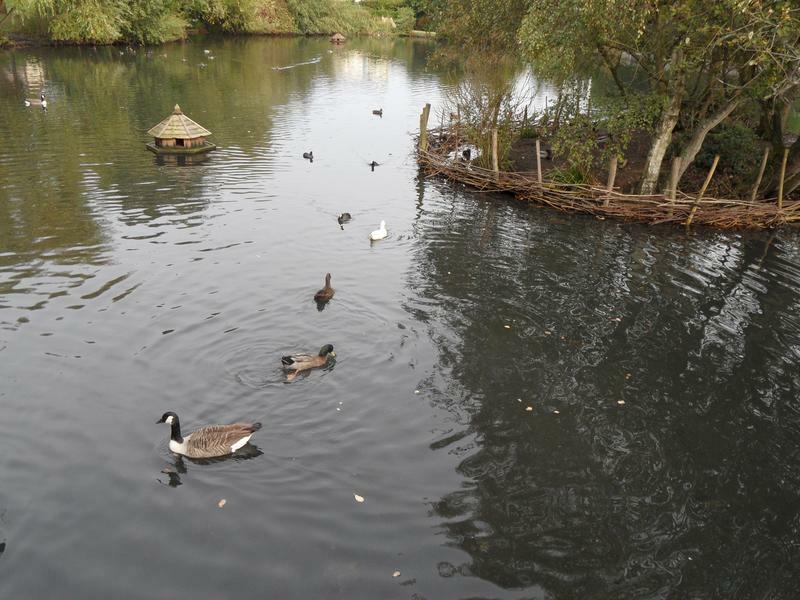 the nest straight towards me, but then landing on the water below, and eating some bread. 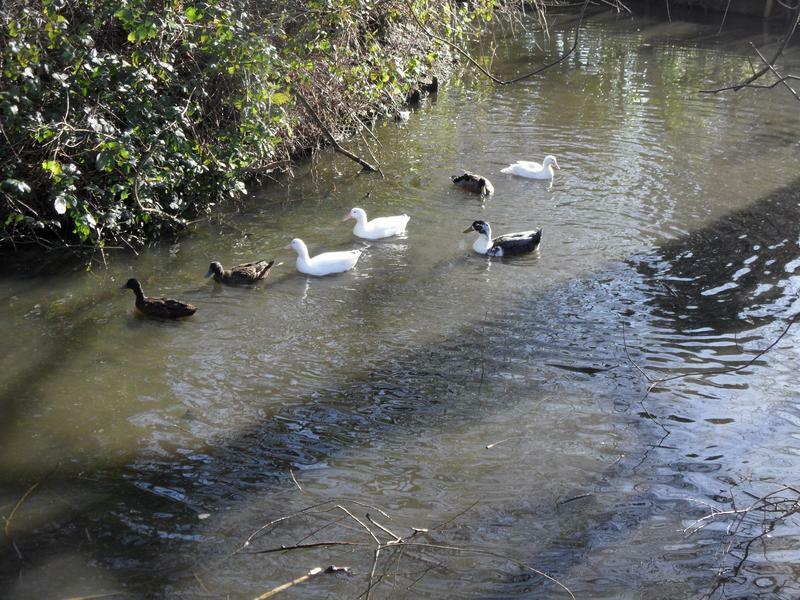 The White Mallard family on the island. 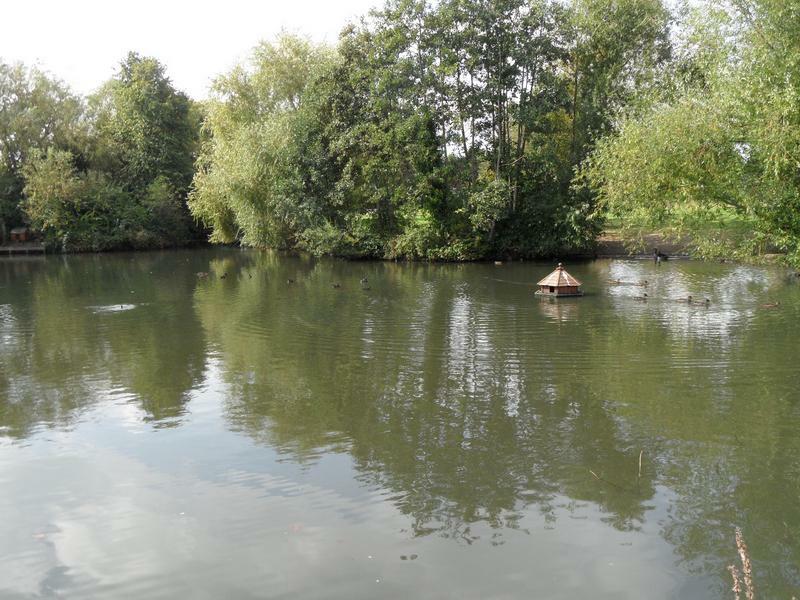 And immediately back on the water. 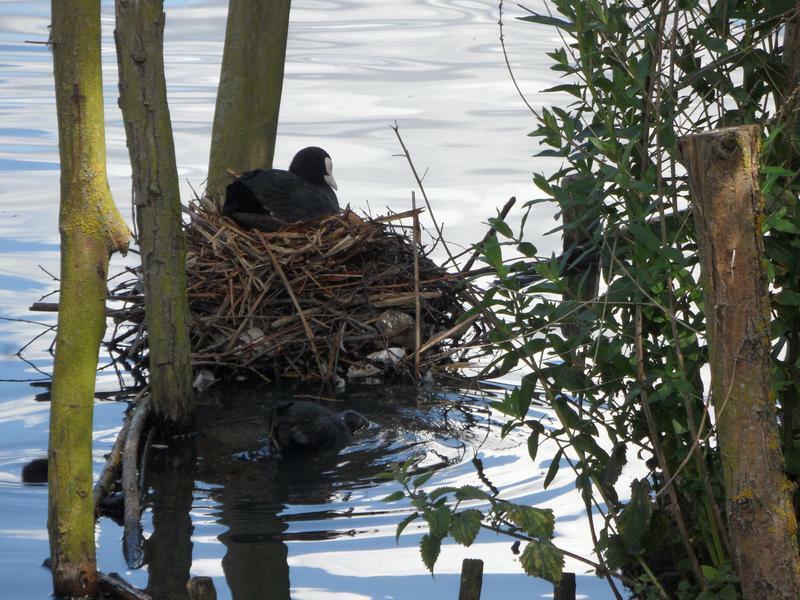 the Coot family has moved under overhanging branches next to the beach area. 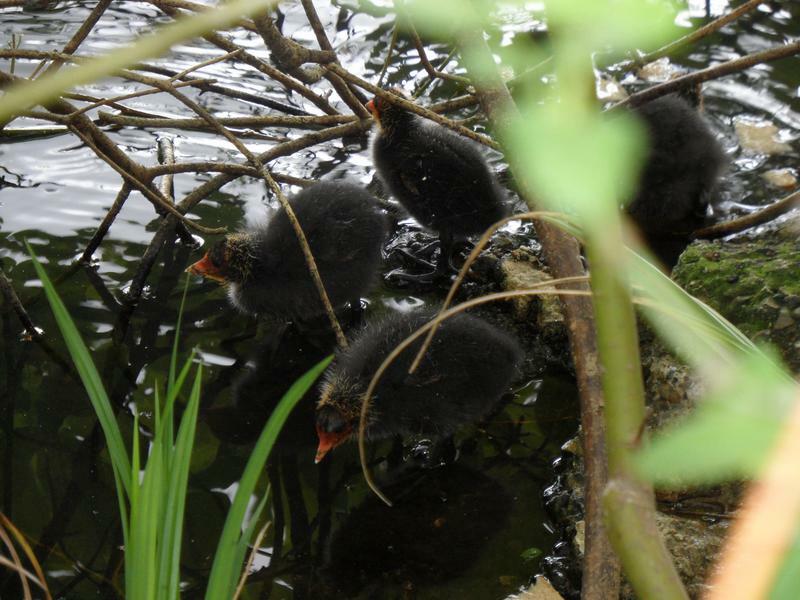 From where I can get close up photos of the Coot chicks, still with red beaks. 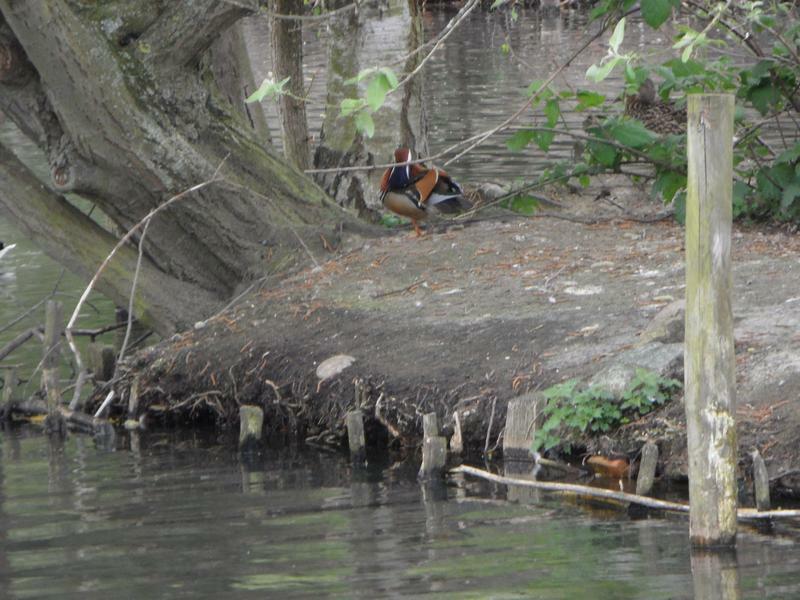 One Mandarin Duck on the small island, wonder if the female we saw in the winter is nesting here somewhere. 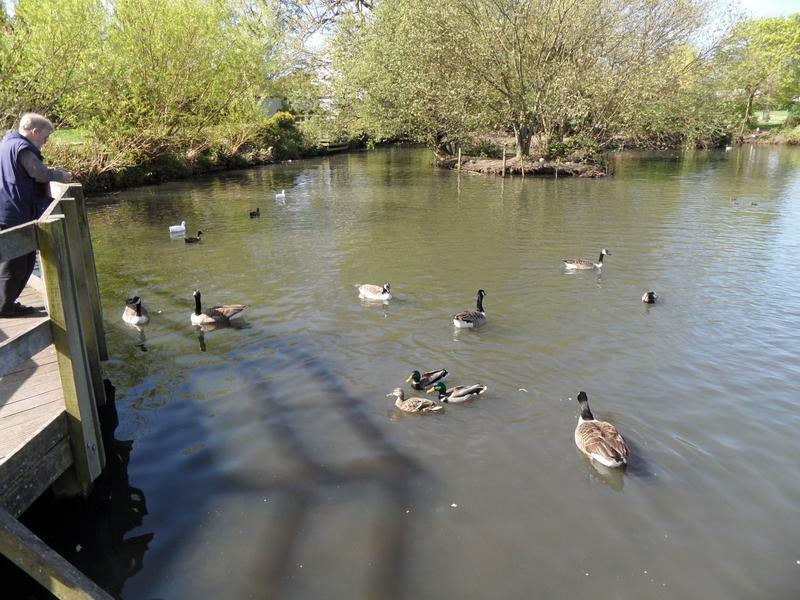 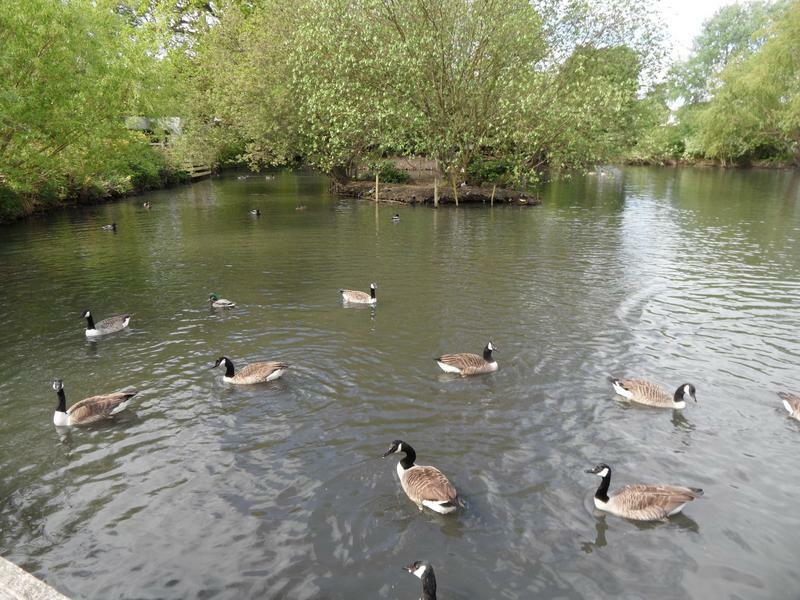 27th April 2014, more geese than the last visit, fewer ducks. 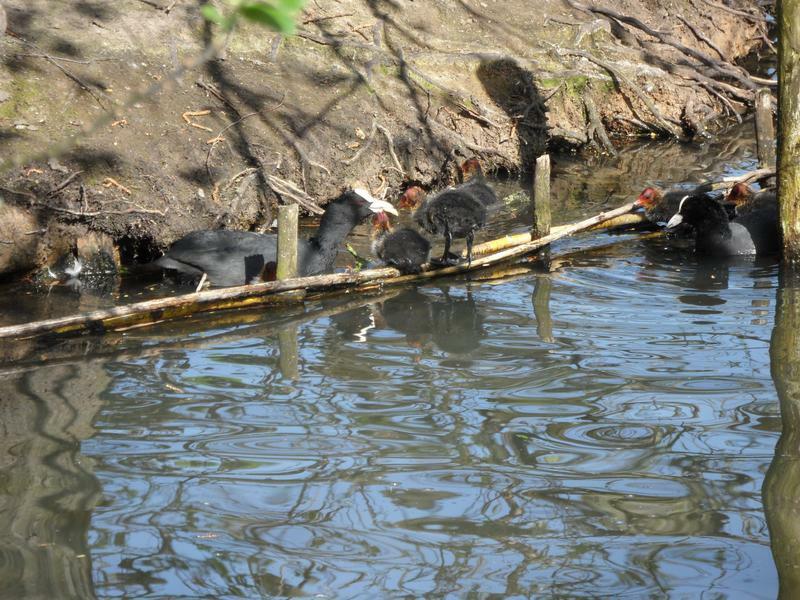 The Coot family is growing ever larger, will longer fit into the nest. 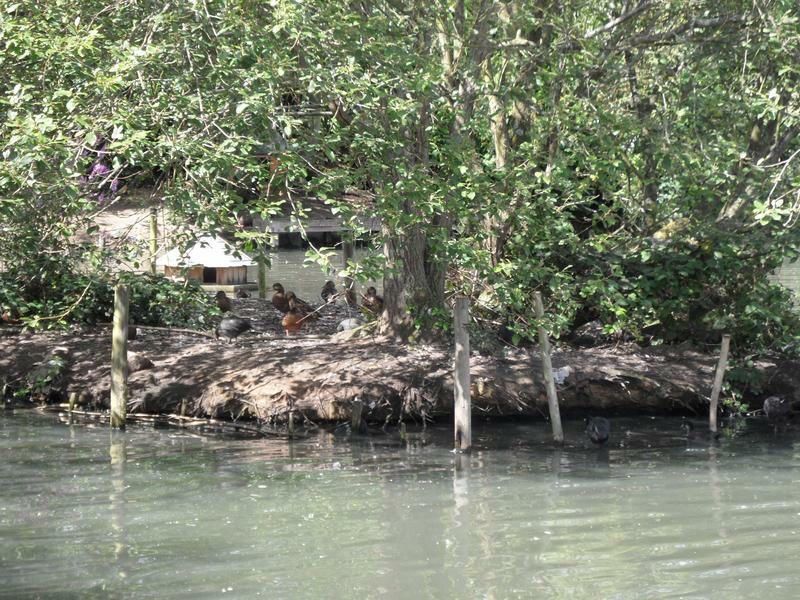 Always seem to see one or two Mandarin Ducks sleeping on the small island. 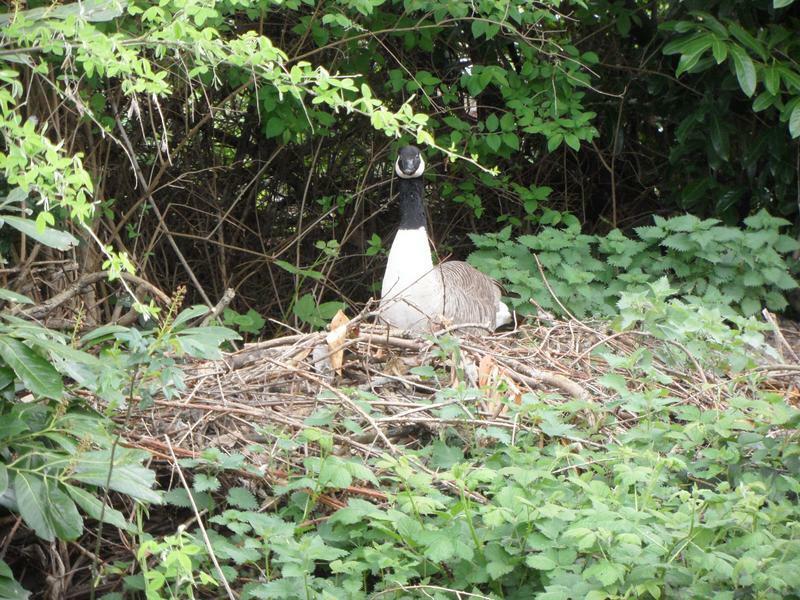 The Canada Goose is still on her nest, at least four weeks. 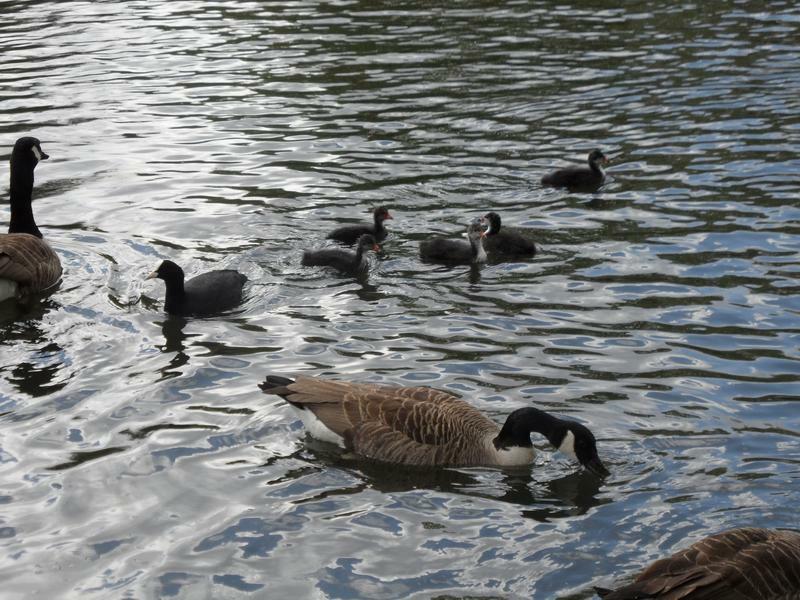 The Coot family is out on the water. 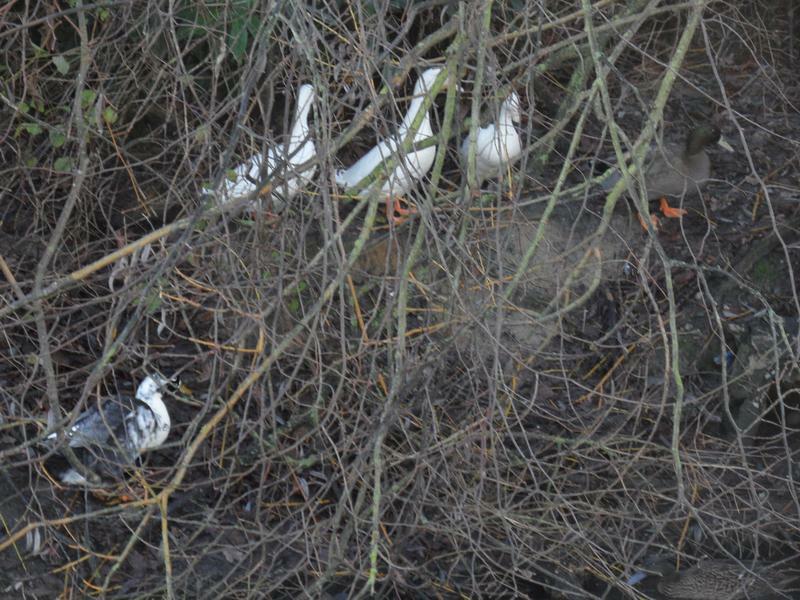 And now heading to the shelter of the overhanging branches. 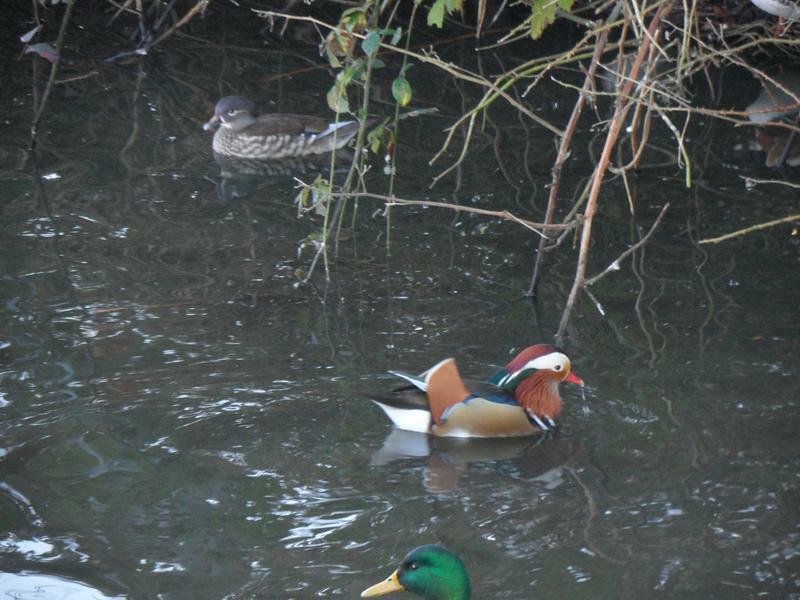 A rare visit to the water for one of the Mandarins. 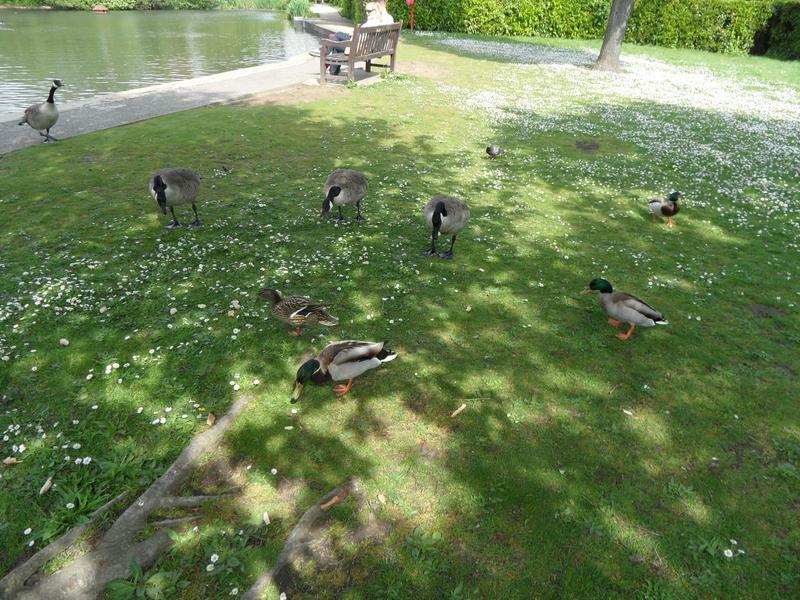 5th May 2014, the Mallards and Canada Geese are hungry today, so waiting on the lawn to be fed. 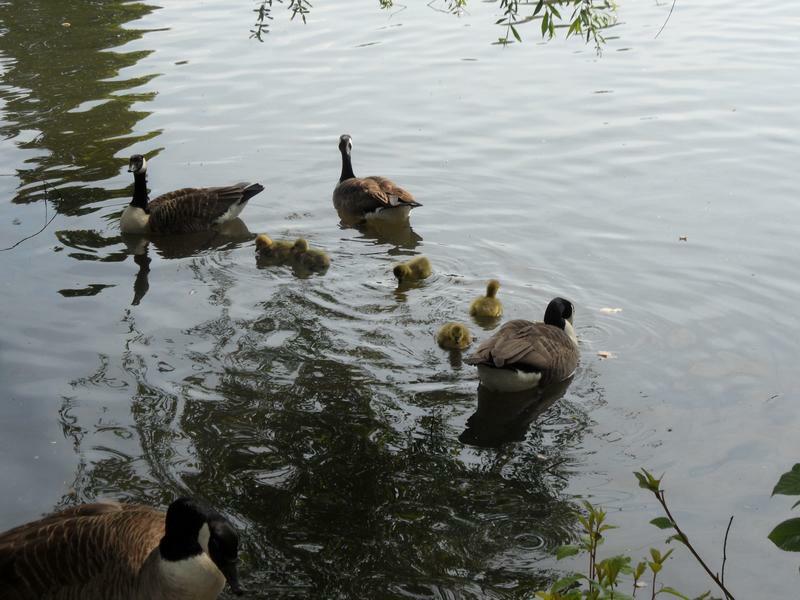 On the pond, the first goslings we've seen this season, six in this family. 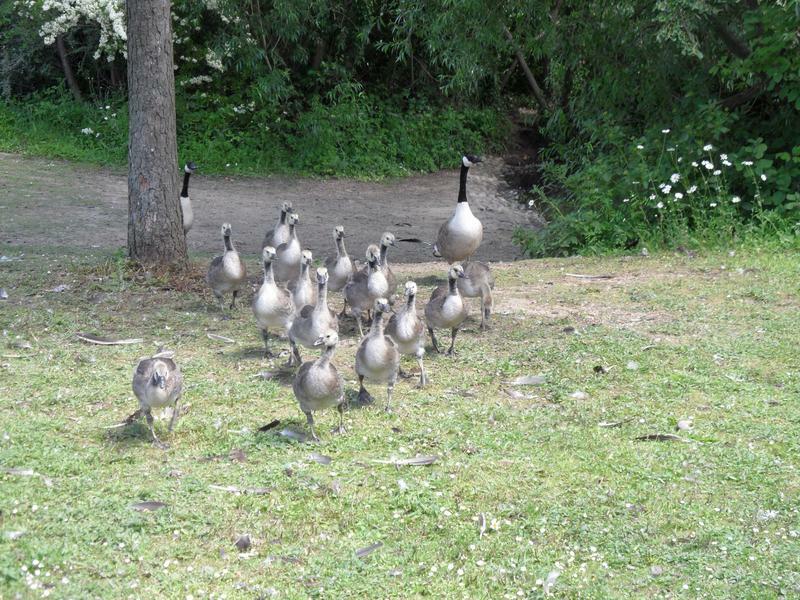 With families around, the geese get quite aggressive, here one chasing another away. 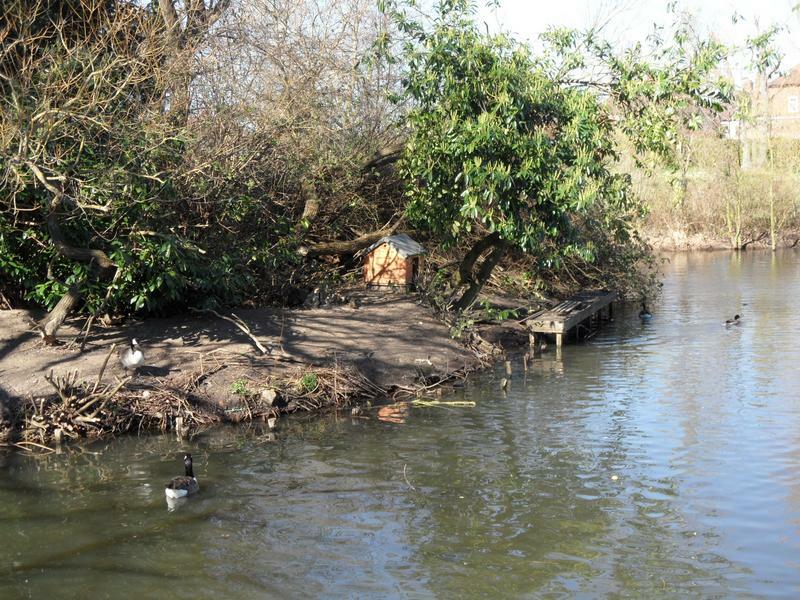 The White Malllards near the large island. 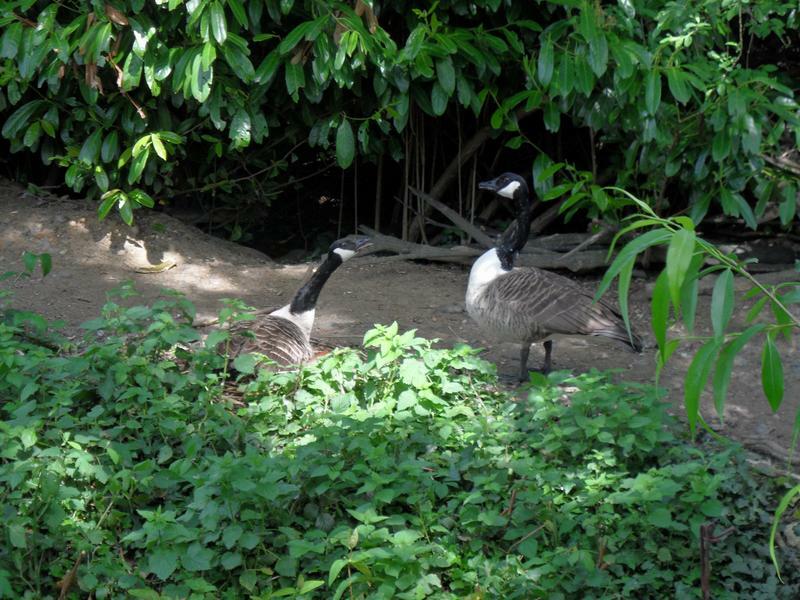 The goose on her nest is not pleased another goose has come close. 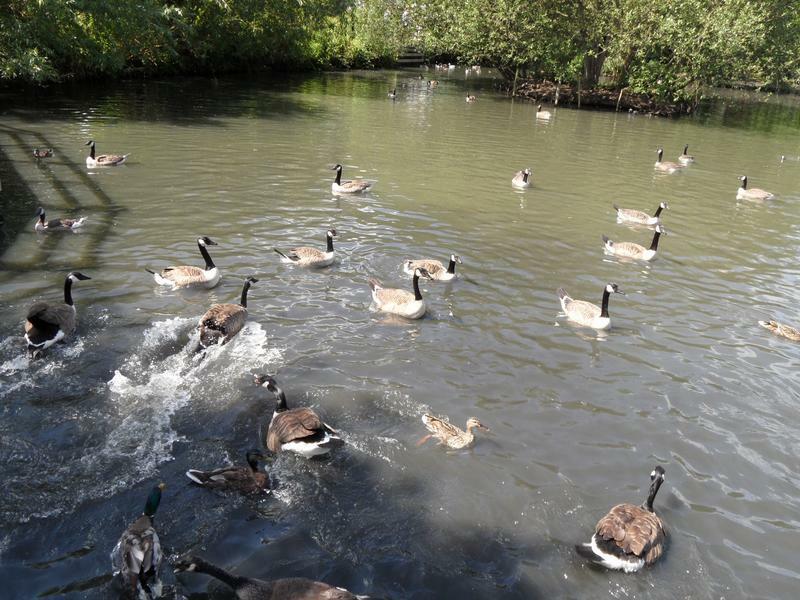 The first Canada Goose family is now on the far side of the pond. 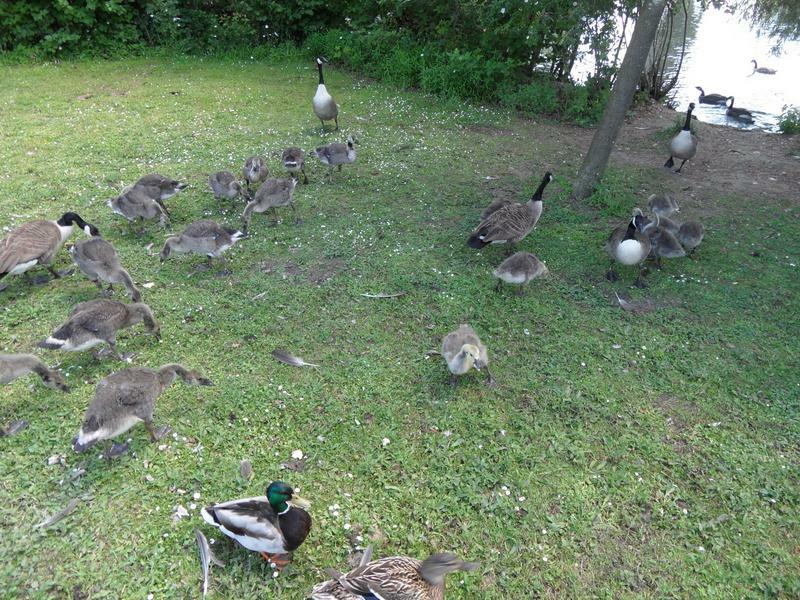 Meanwhile, a second Canada Goose family with 12 Goslings sees us feeding other ducks and heads our way. 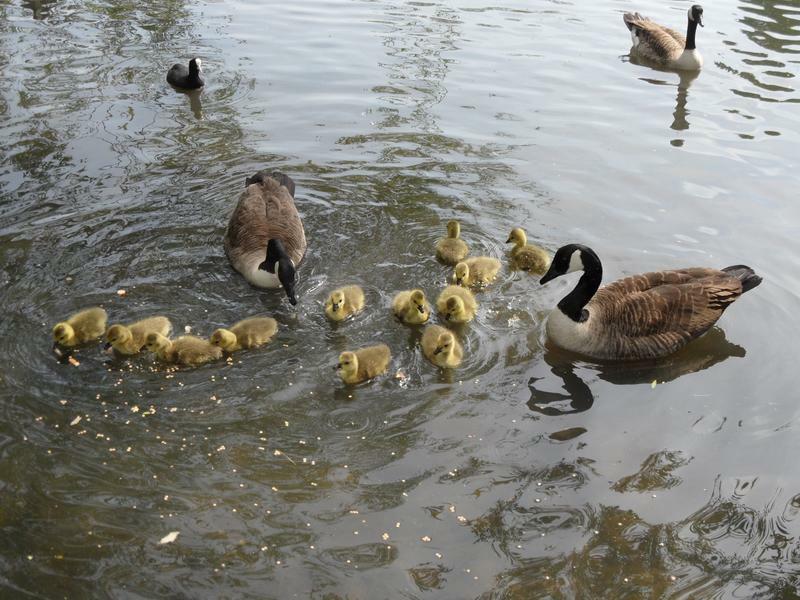 A very successful family, they usually lay this many eggs but rarely do this many survive. 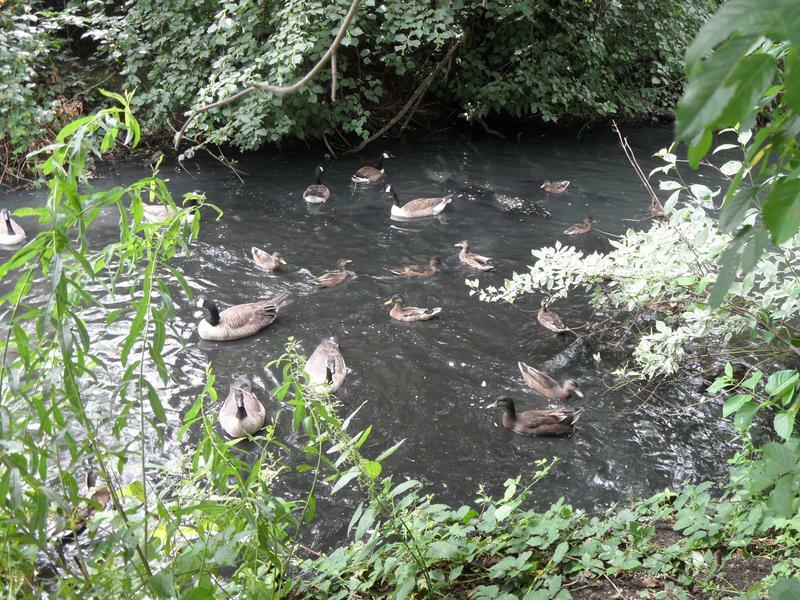 All the goslings eating duck pellets. 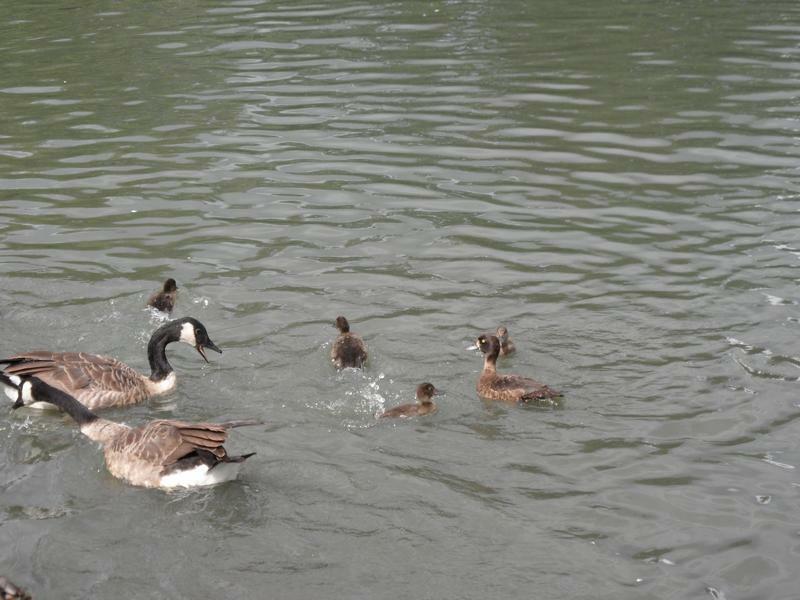 And finally the goose family swims away. 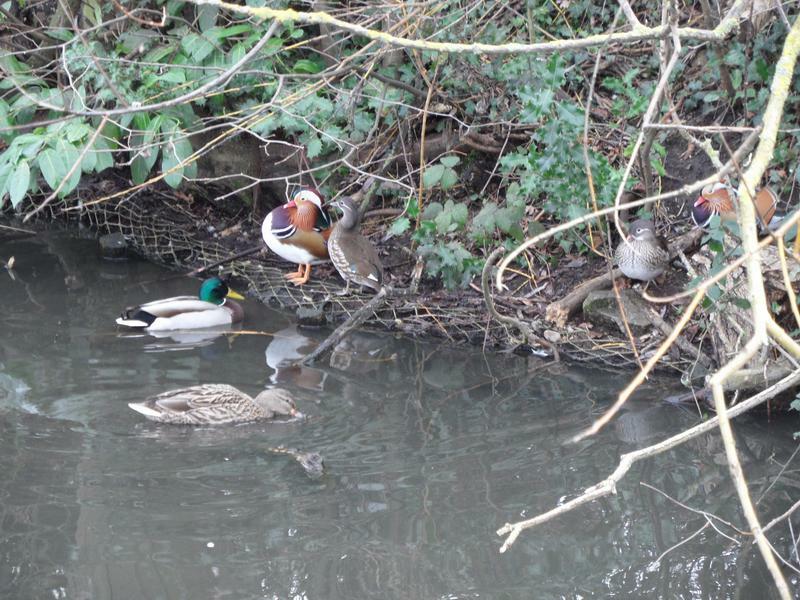 Not many Mallards around today. 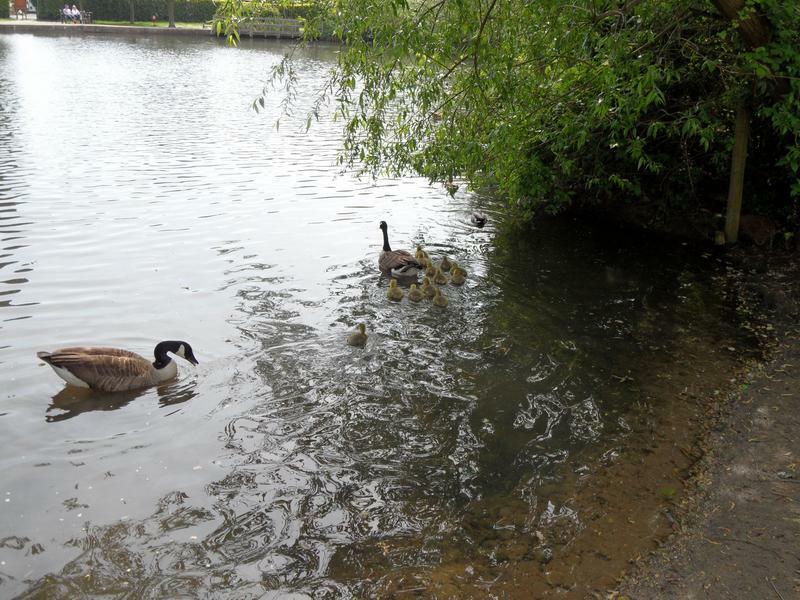 18th May 2014, still six Goslings in this family. 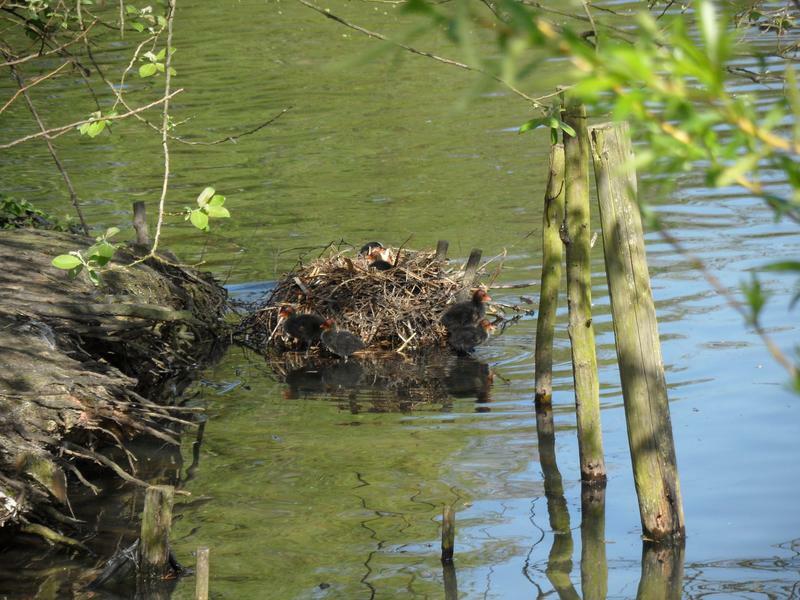 The Coots have been busy, a second nest has been built on the other end of the small island from the first. 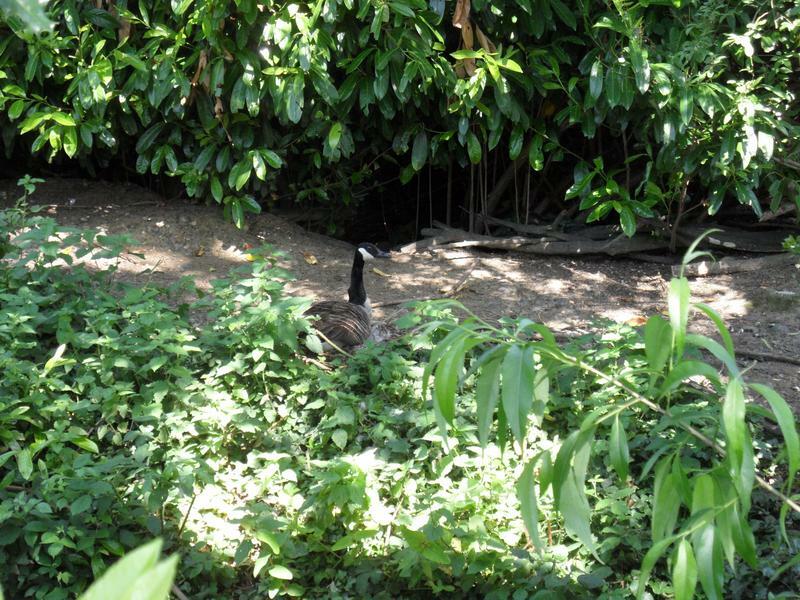 The goose still seems to be sitting on her nest. 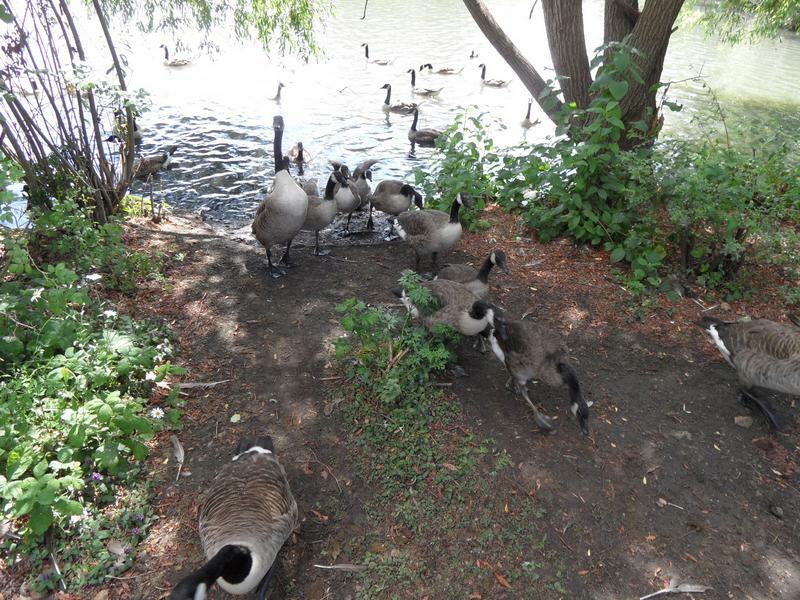 And they are hungry, running around my legs looking for food. 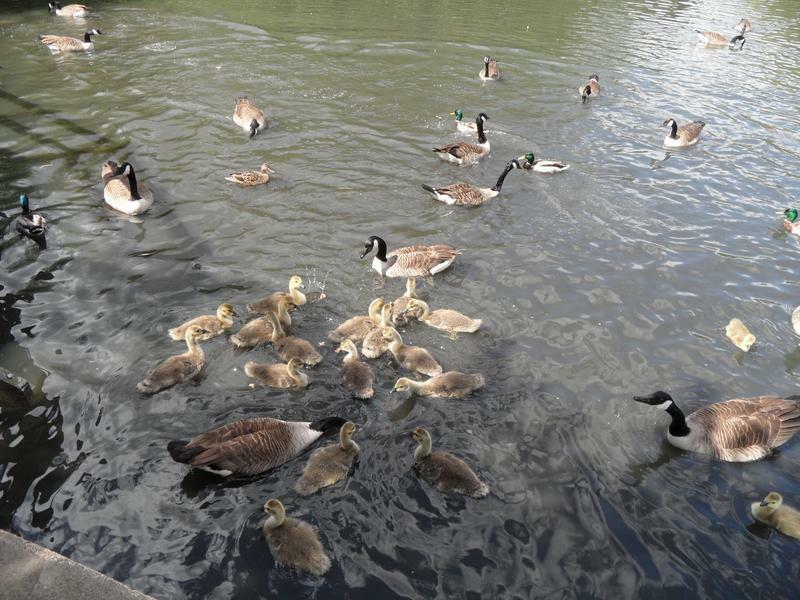 The younger family has arrived as well, by the water edge. 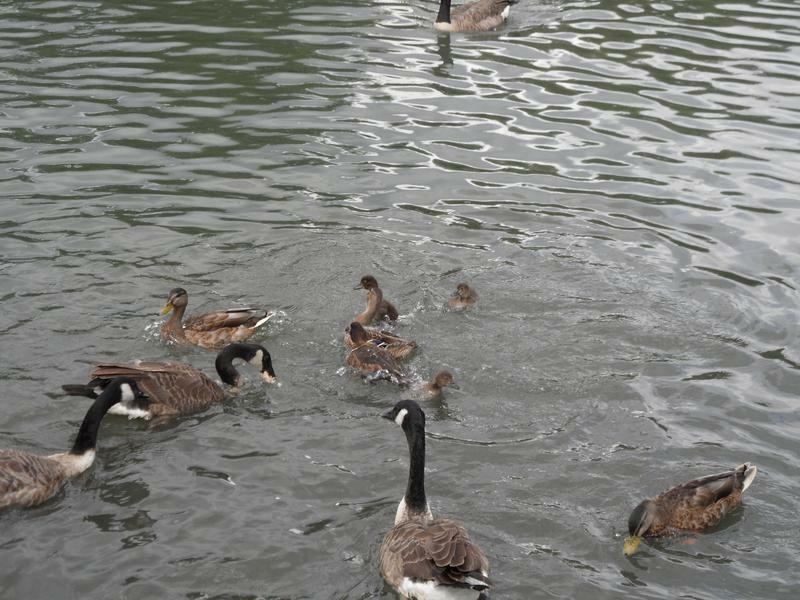 One family swims off, the other is still eating. 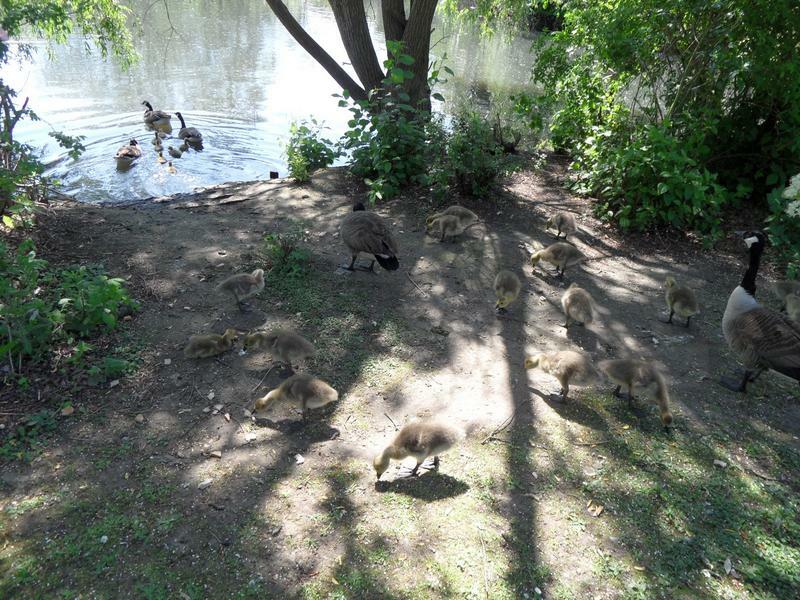 One of the goslings seem to have a broken leg, left foreground, and can only hop around, but still manages to eat. 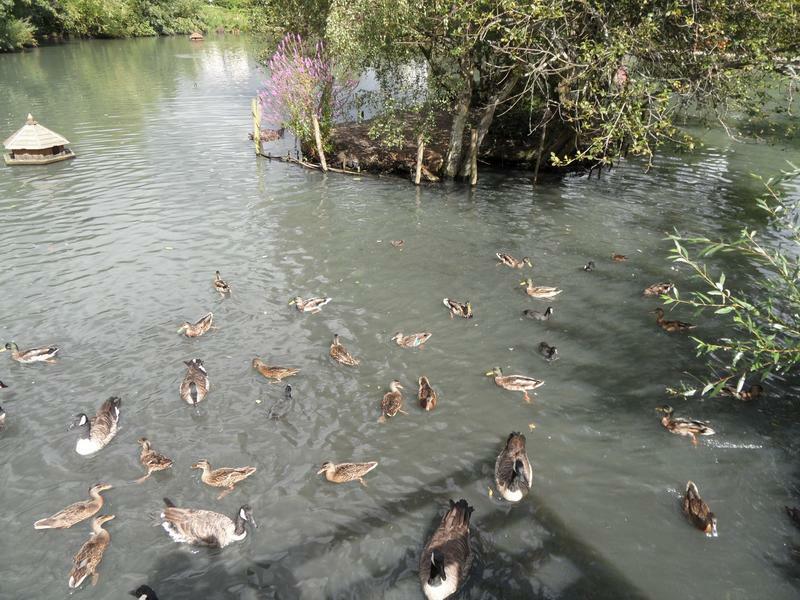 And they are all back in the water. 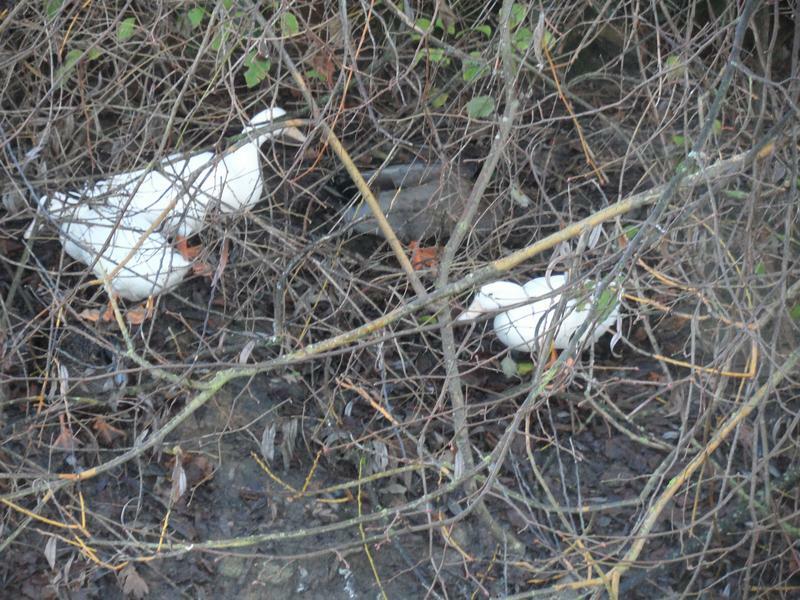 Apparently, a local fox is responsible for the loss of two of the three white Mallards. 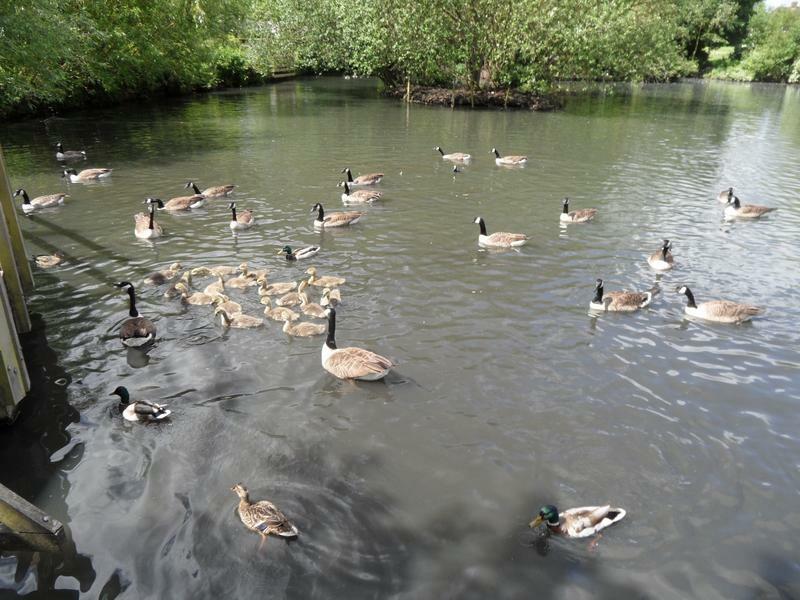 25th May 2014, the two Goose families arrive separately for food. 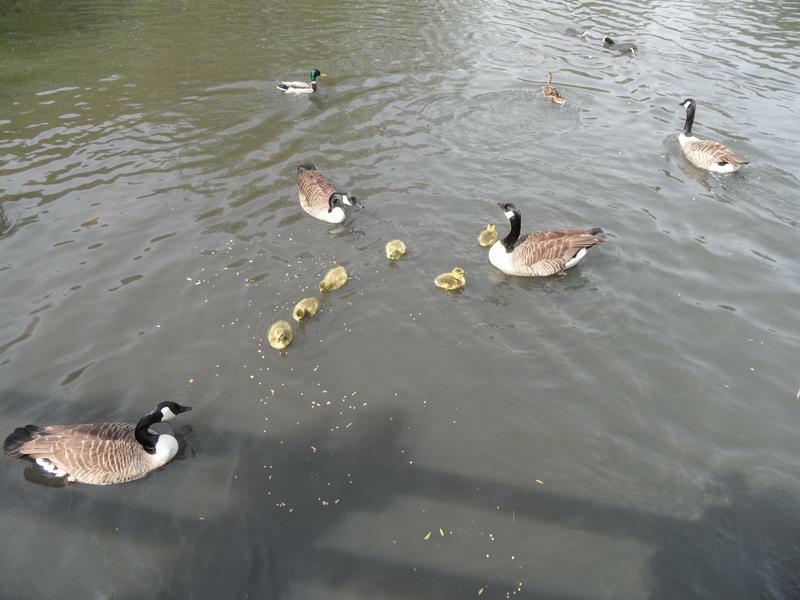 Look like still 17 goslings in one family, six in the other. . 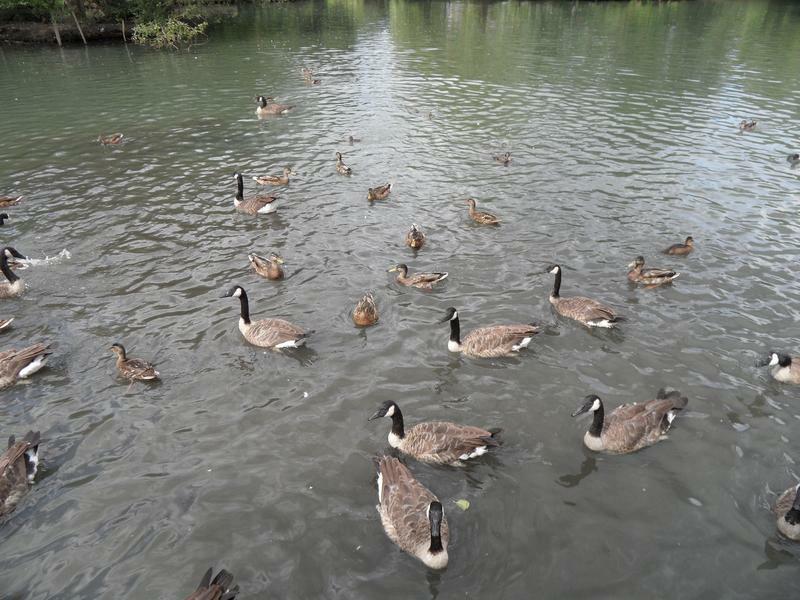 Seem to be a lot of geese here this week. 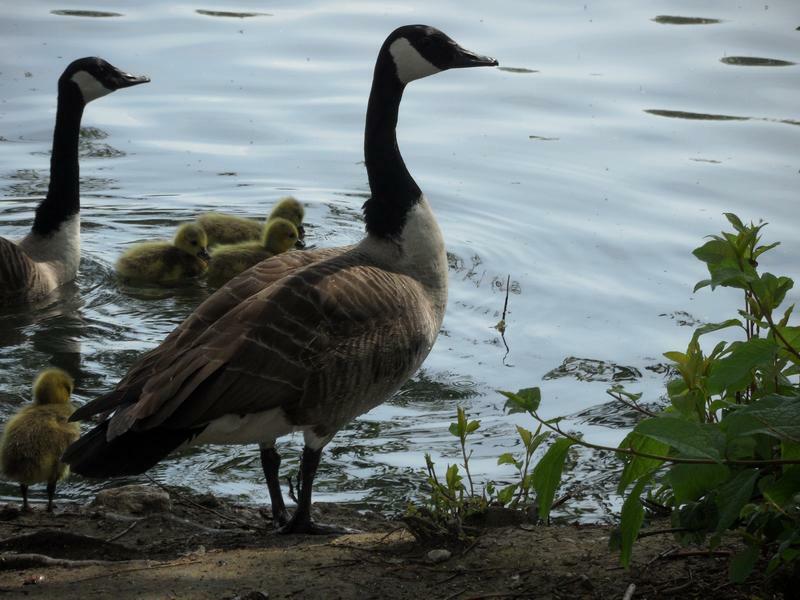 Still hungry, following us around the pond. 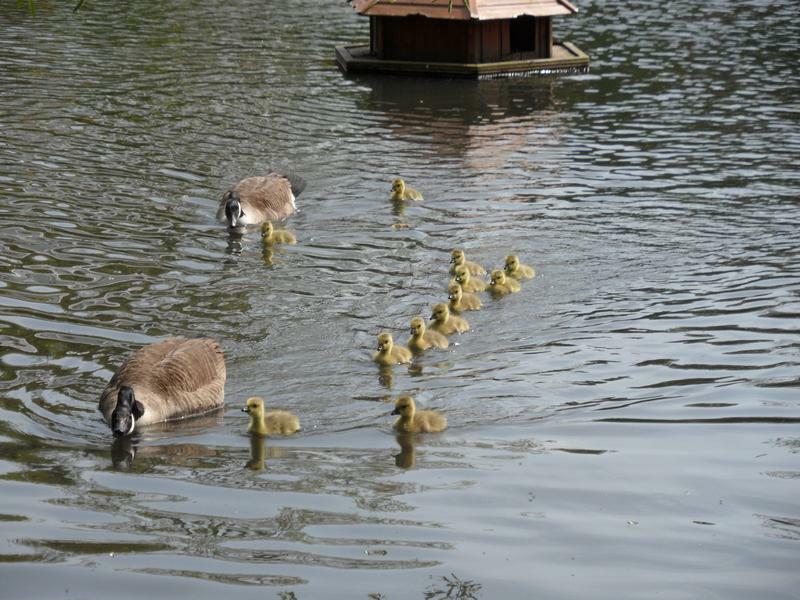 The smaller family is following as well. 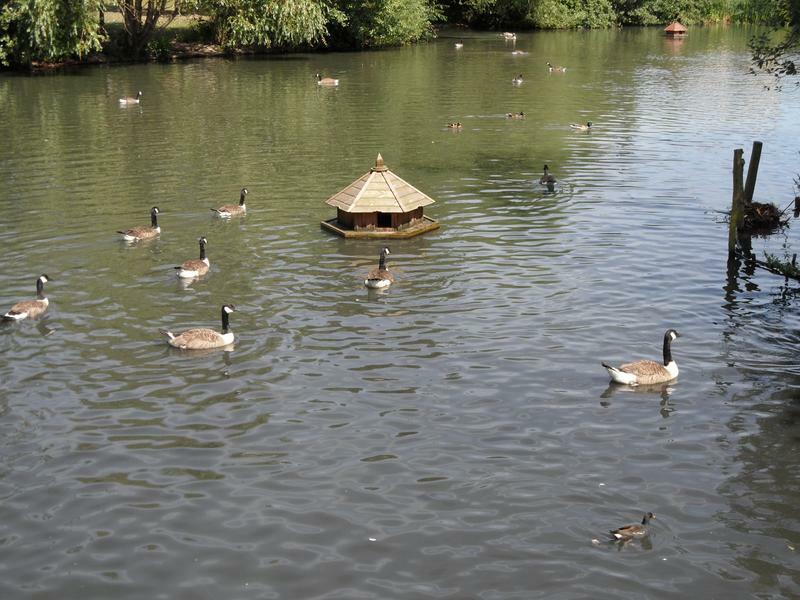 Not sure if there is a third family from the goose that was sitting high on the island. 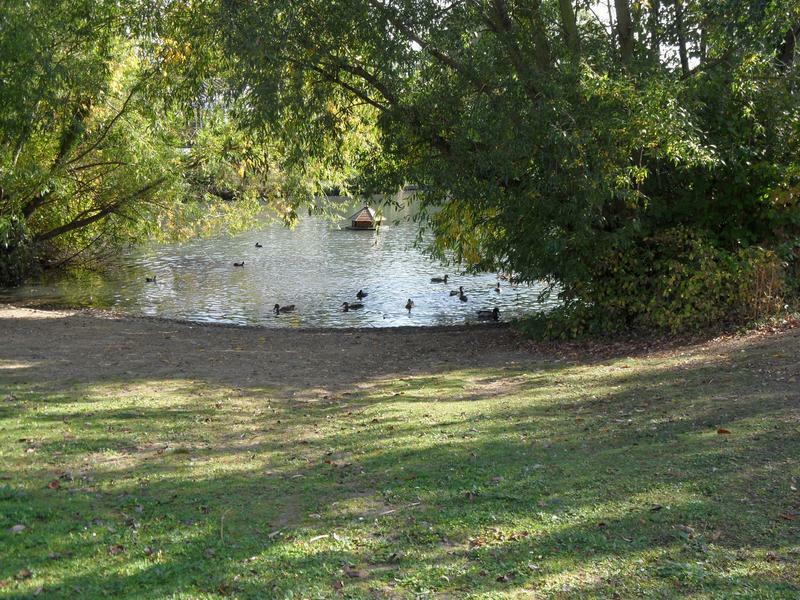 The pond looks peaceful now. 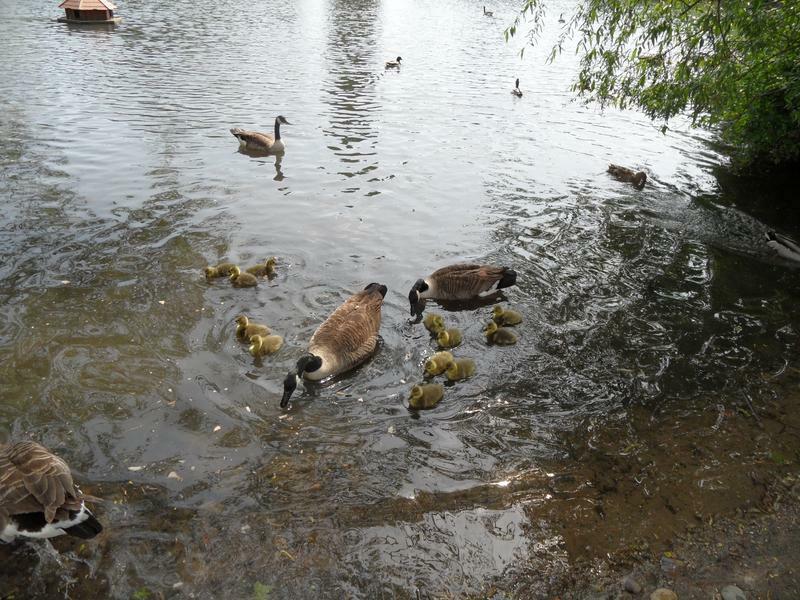 8th June 2014, the goslings are growing rapidly, one family is almost adult size already. 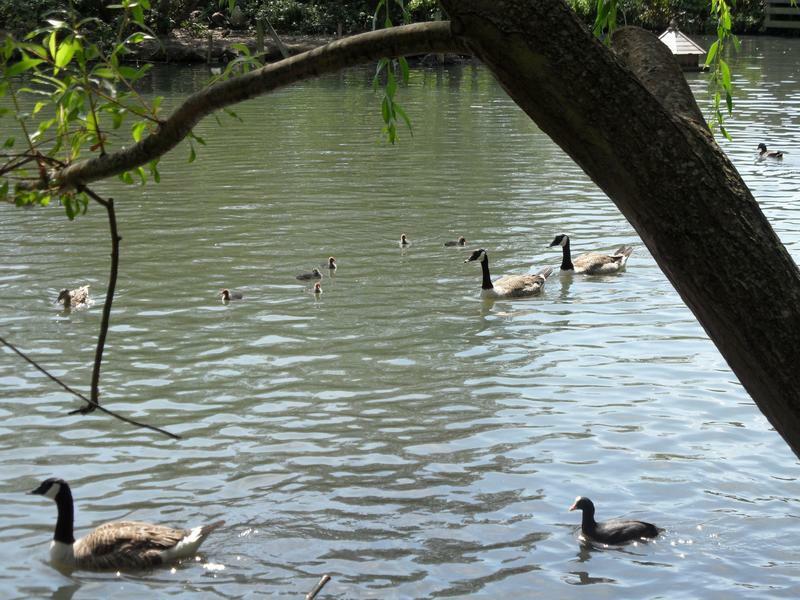 One of the geese families swims away. 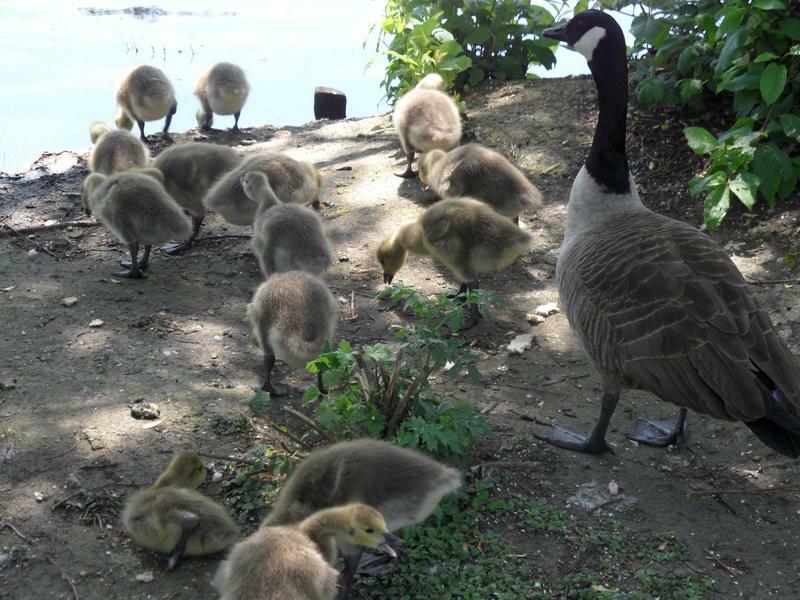 The goslings are now on the far side of the pond, and heading my way for more food, looks like 14 left in the first family. 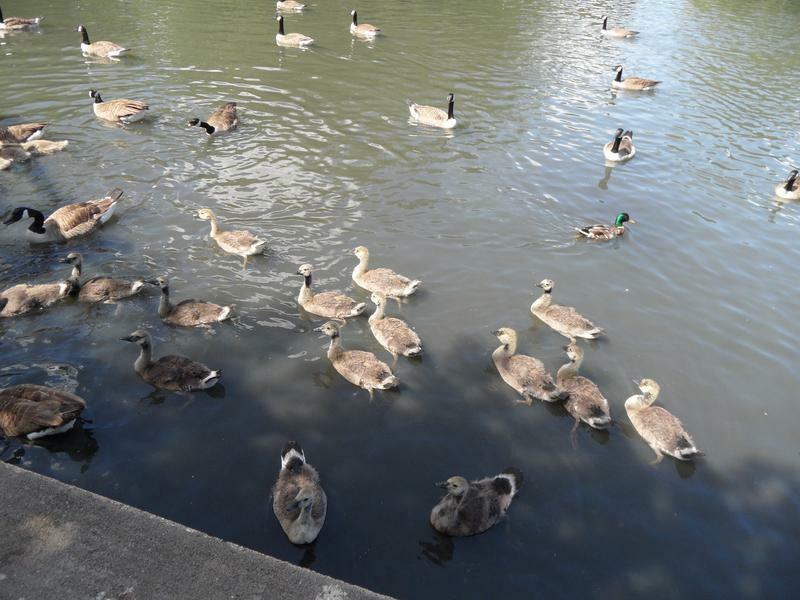 The second younger goose family joins them, with a couple of Mallards. 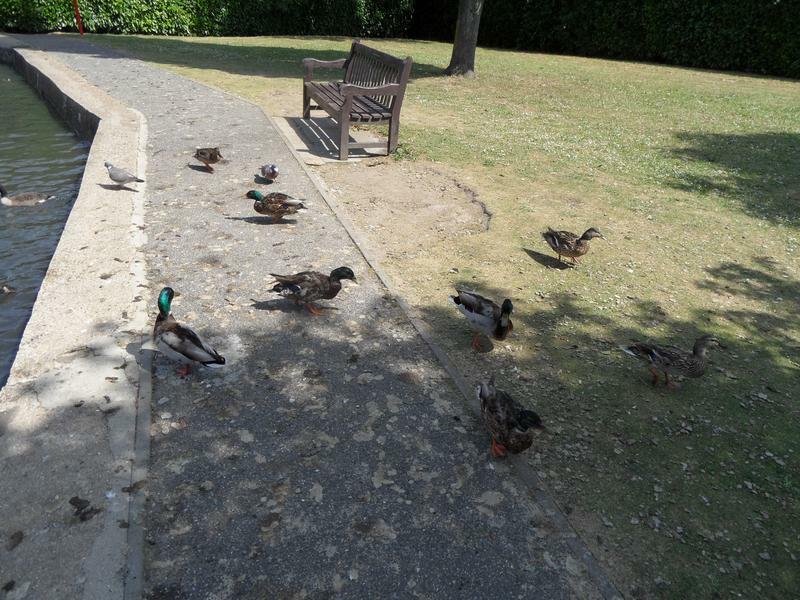 They are eating three loaves of bread on each visit now. 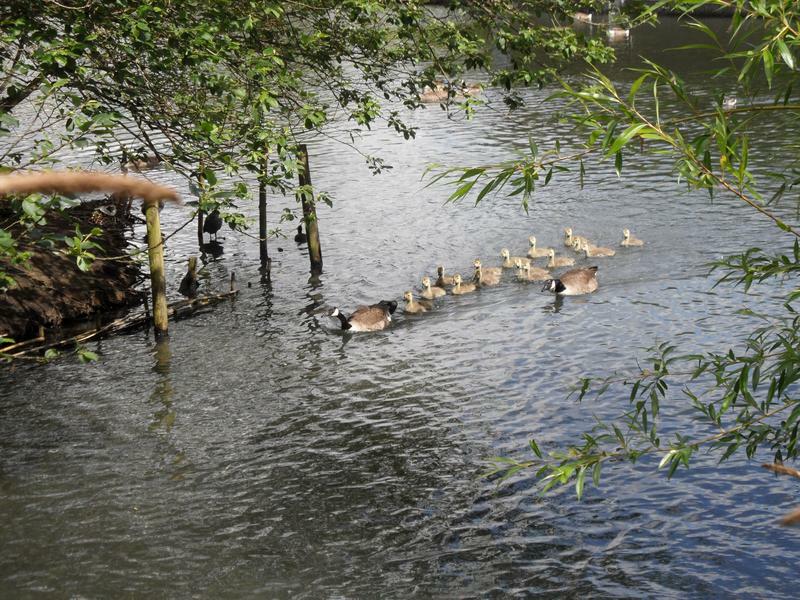 Both families head back into the water, still six in the younger family. 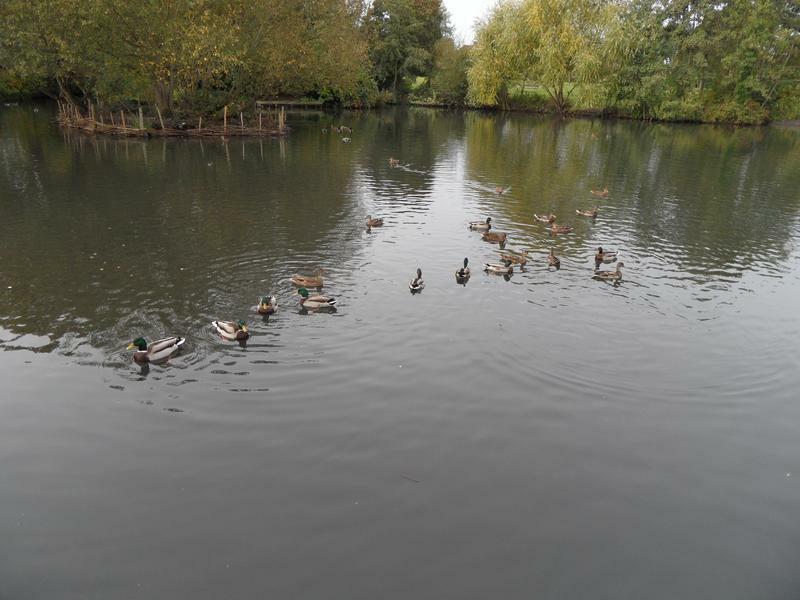 All safely back on the water. 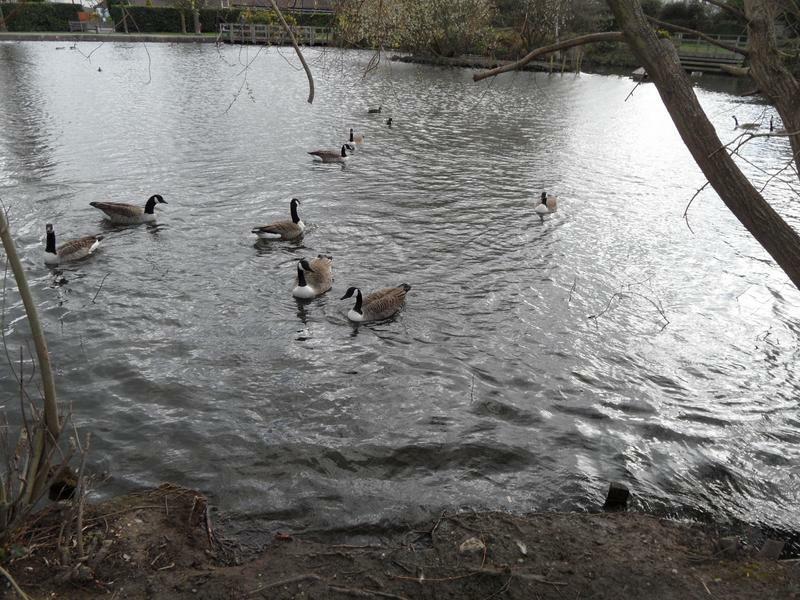 There seem to be more Canada Geese here than nearby Kelsey Park, perhaps not persecuted as much. 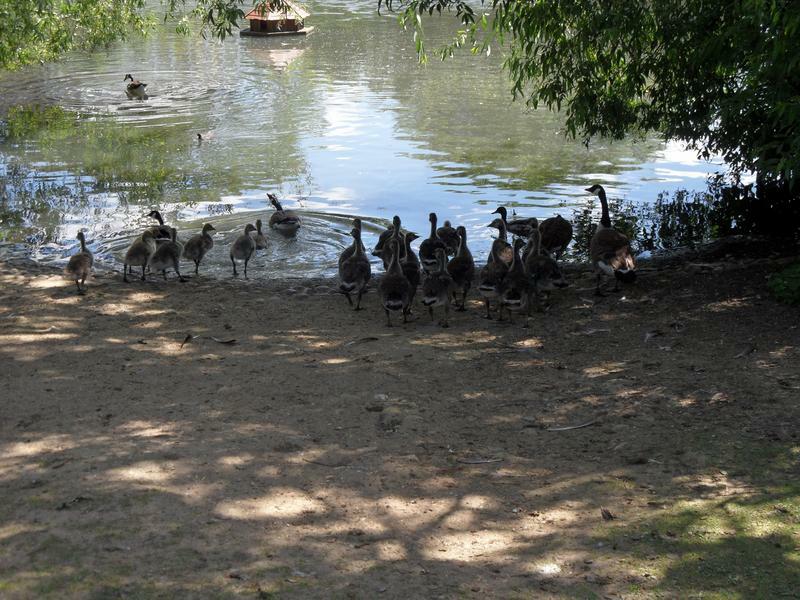 family of goslings near the camera. 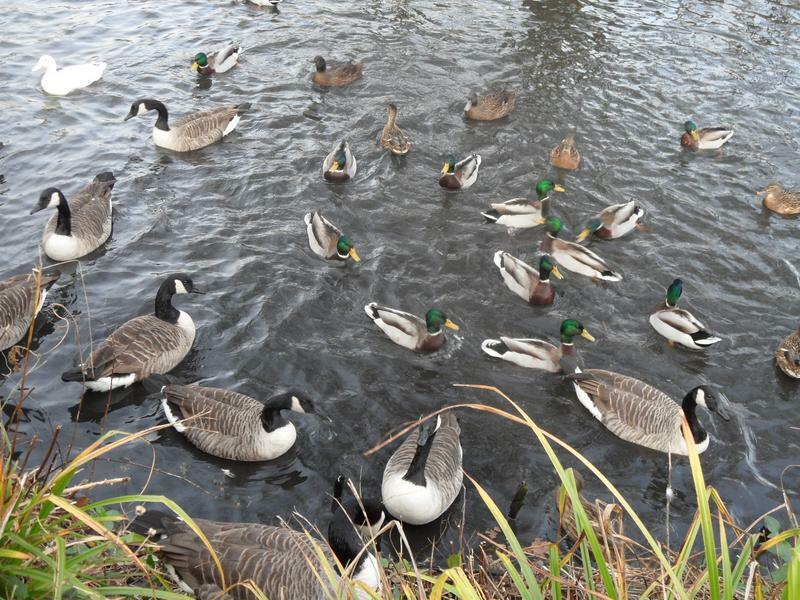 Less competition for food on the grass for the Mallards. 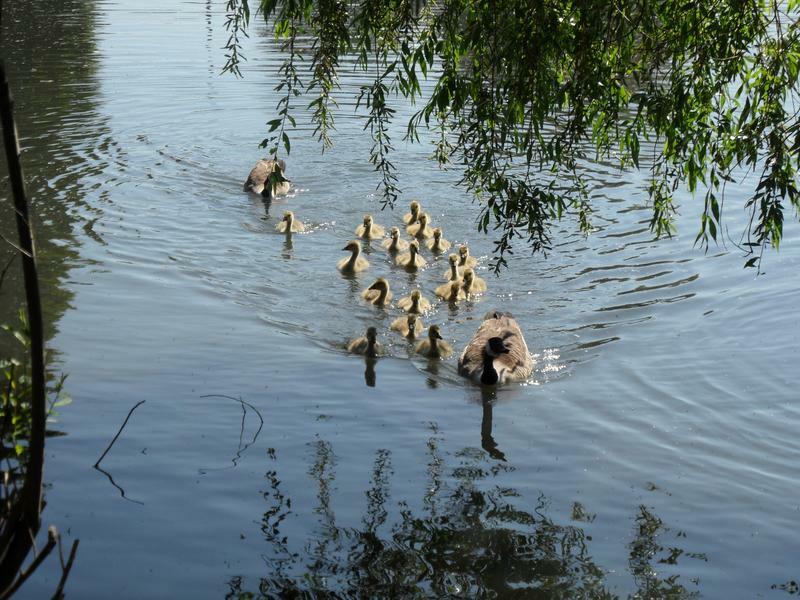 Not seen any Mallard ducklings here yet this year. 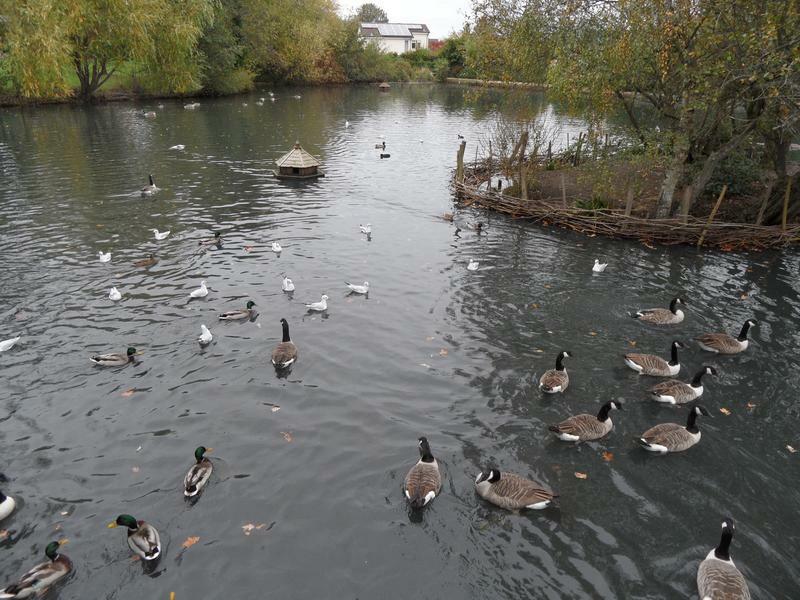 The Coot family is returning to their island. 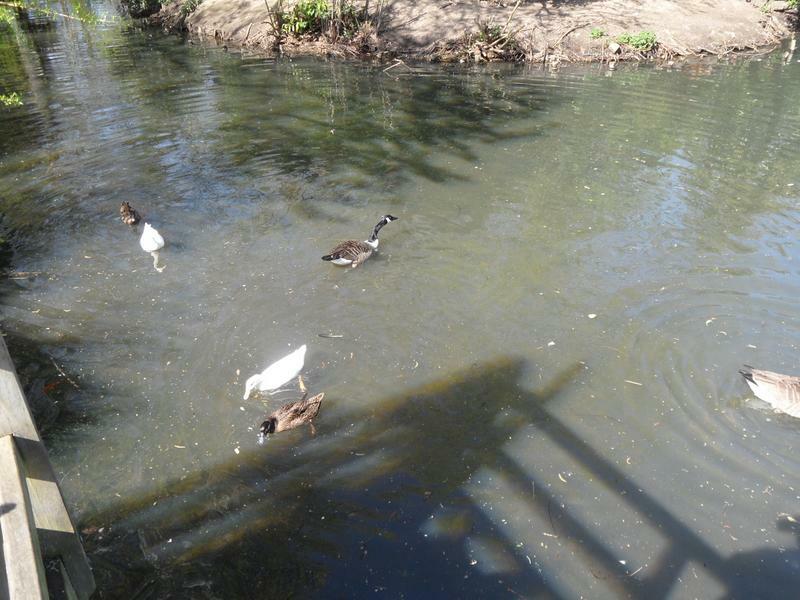 suggested they sit on the pond bottom and catch ducklings swimming above them. 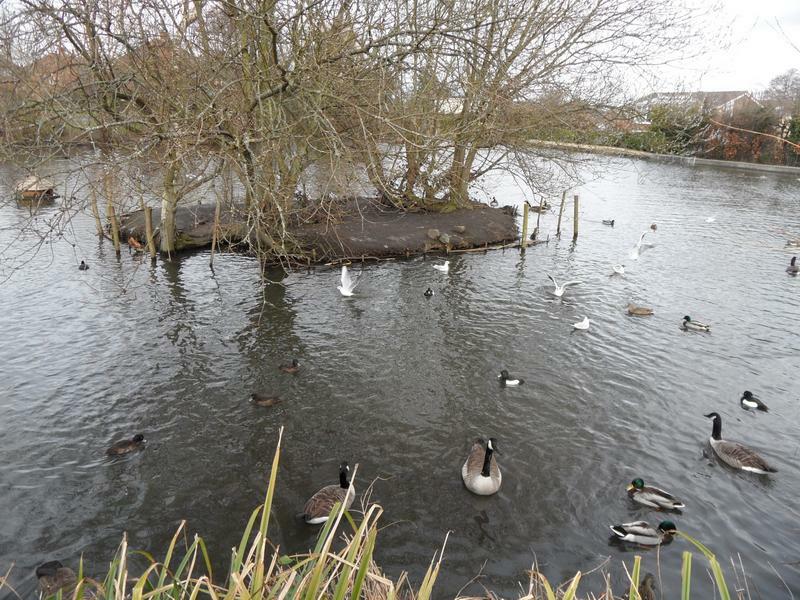 The wider pond, does not seem much activity in any of the ducks houses. 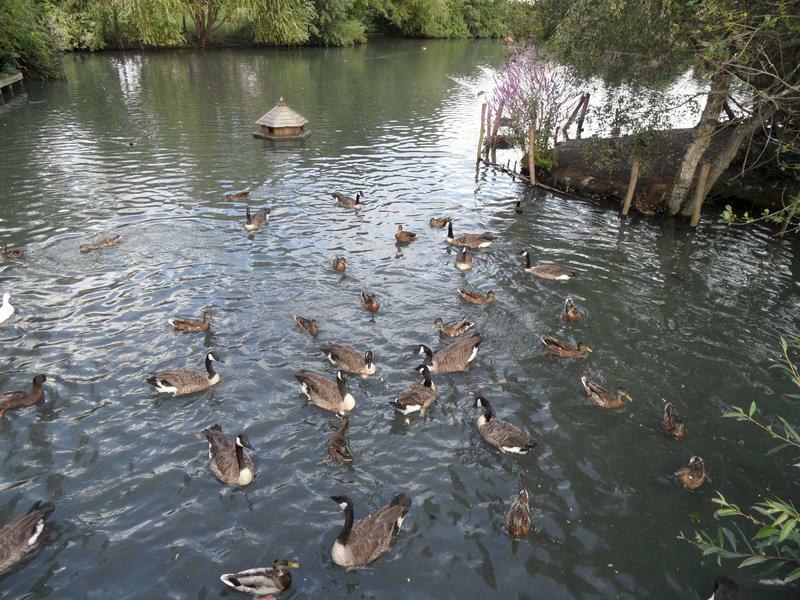 All the goslings are now on the far side of the pond, looking for food. 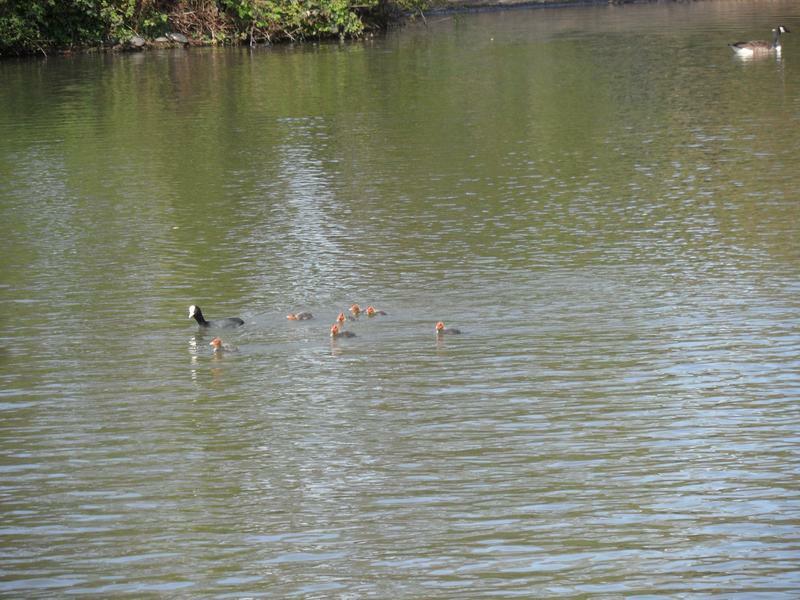 And here comes the Coot family as well. 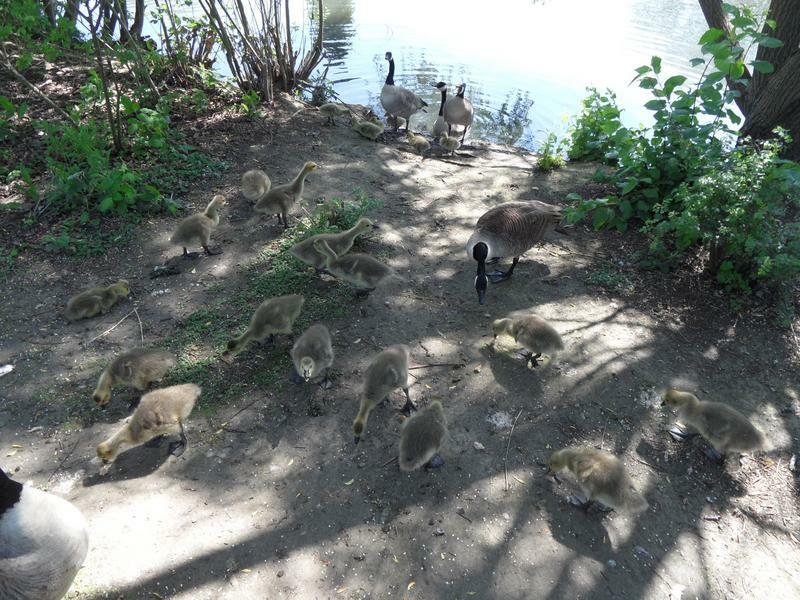 The goslings are crowding around my feet. 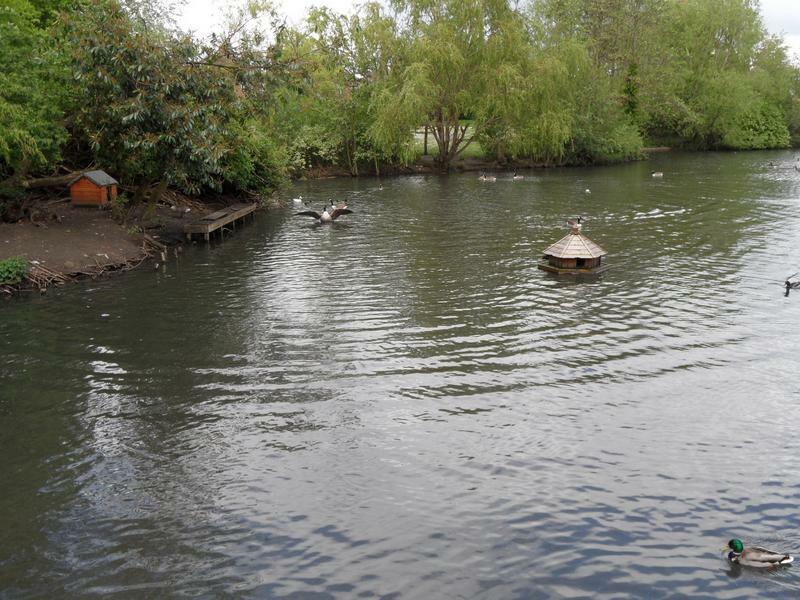 And finally all head back into the water. 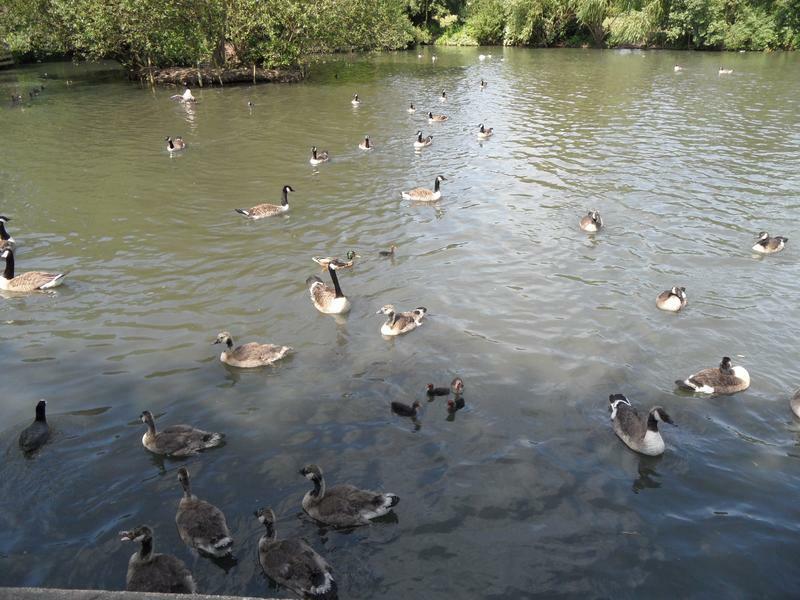 29th June 2014, lots of hungry geese, chasing each other. 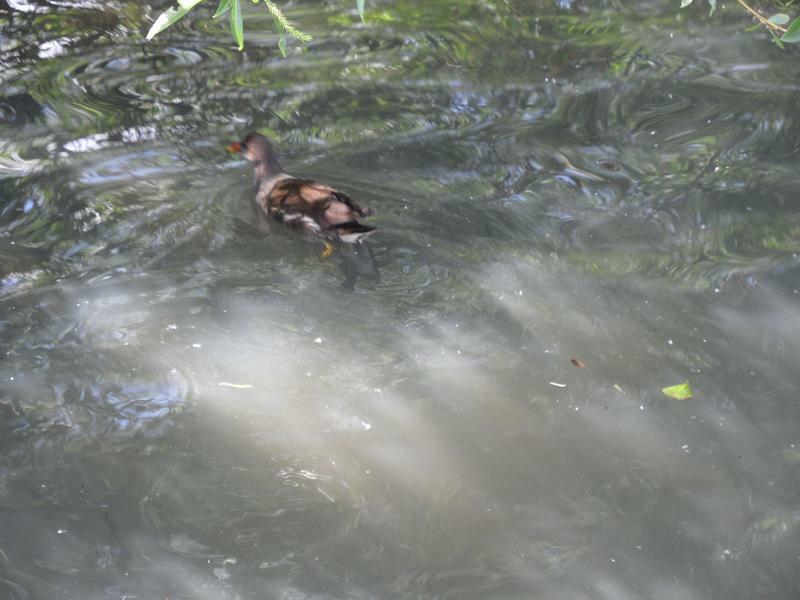 Unusual colouring for a duck, possibly a Tufted duckling. 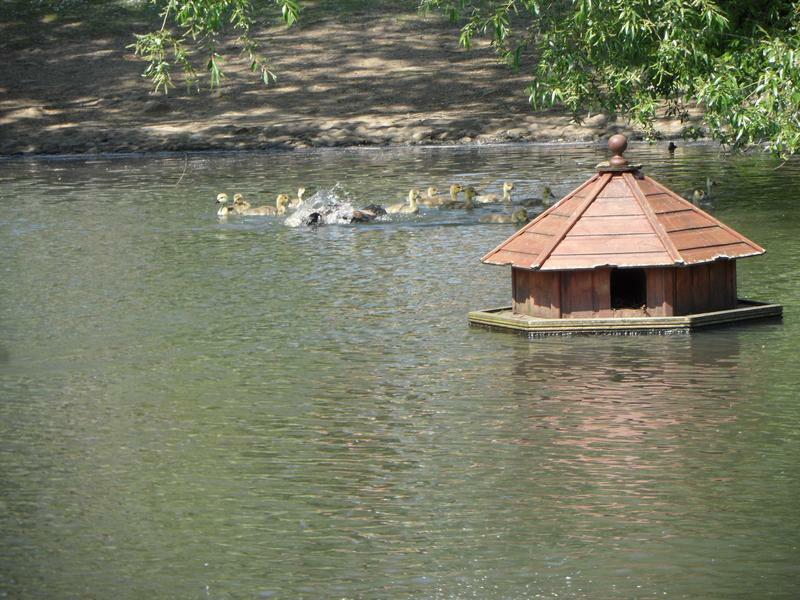 The duckling heading towards to the island. 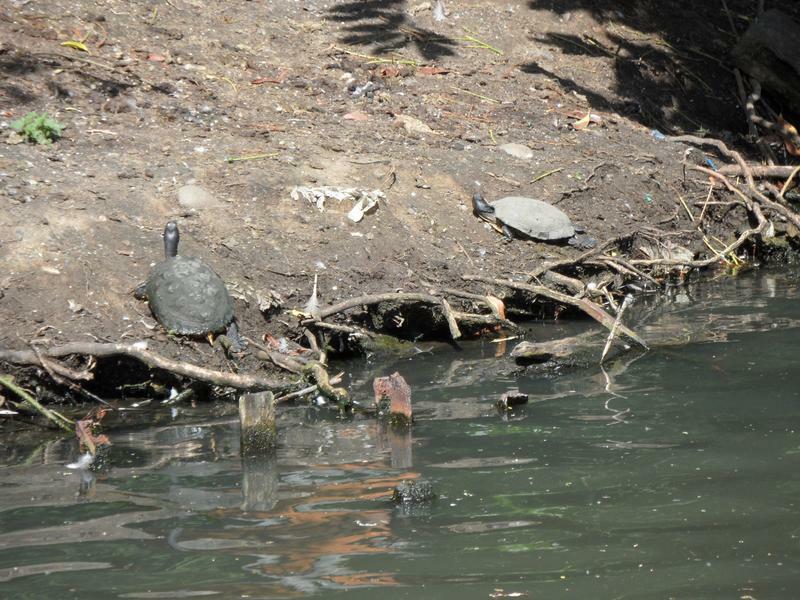 The two terrapin or turtle are still here, sunbathing again. 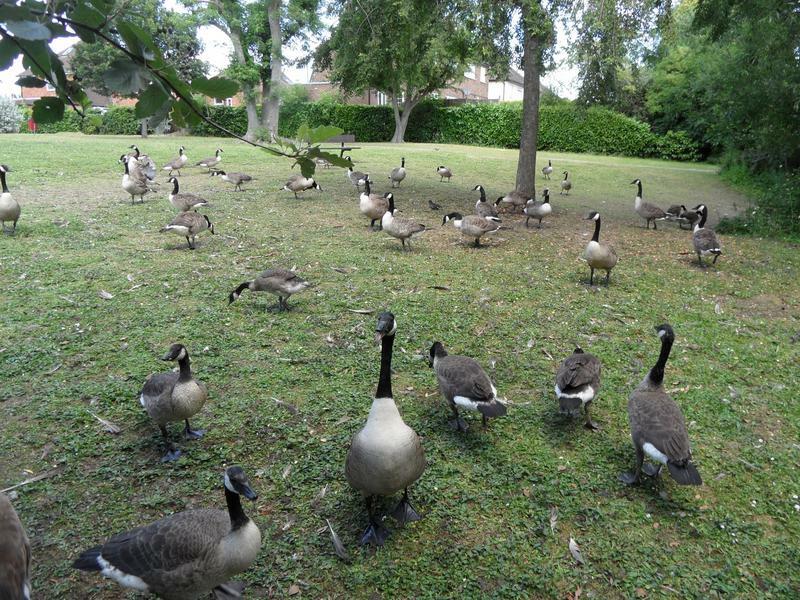 The geese have already been fed on the other side of the pond, but head out onto the grass for more food. 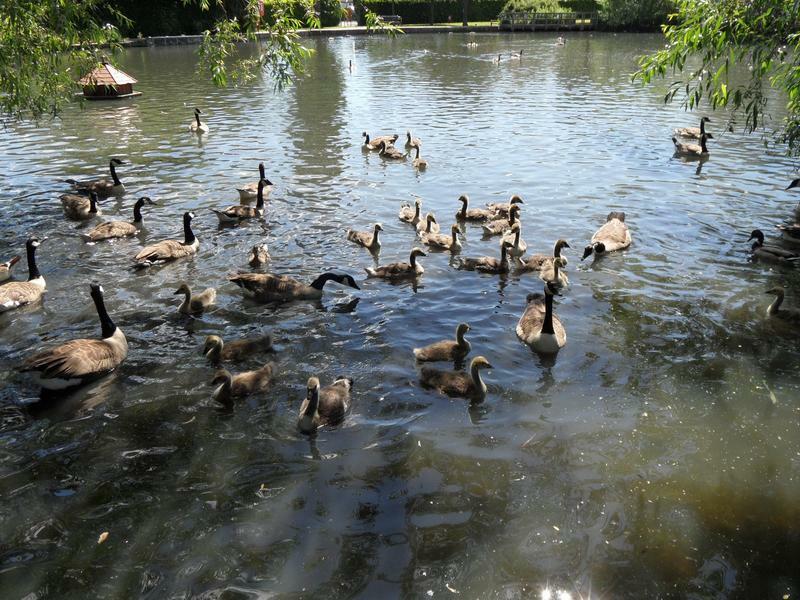 Dozens of geese, many of them born this year. 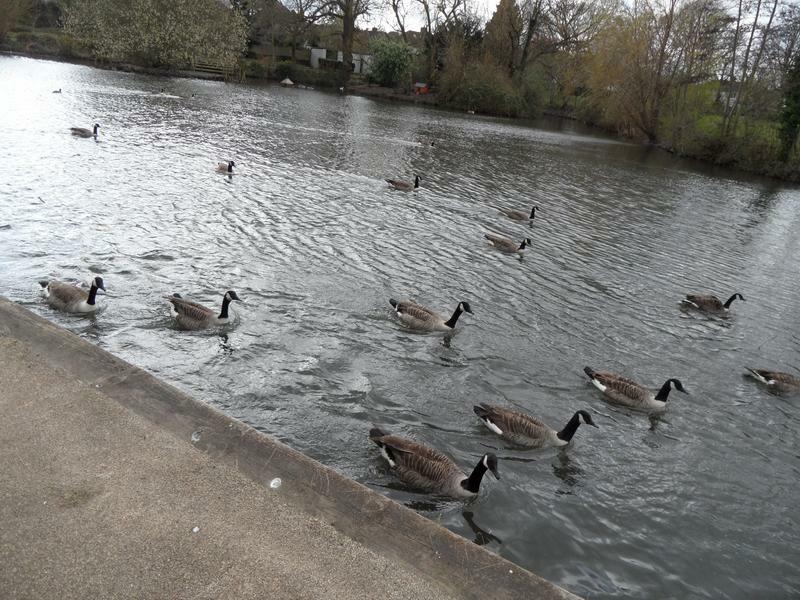 Finally they return to the water. 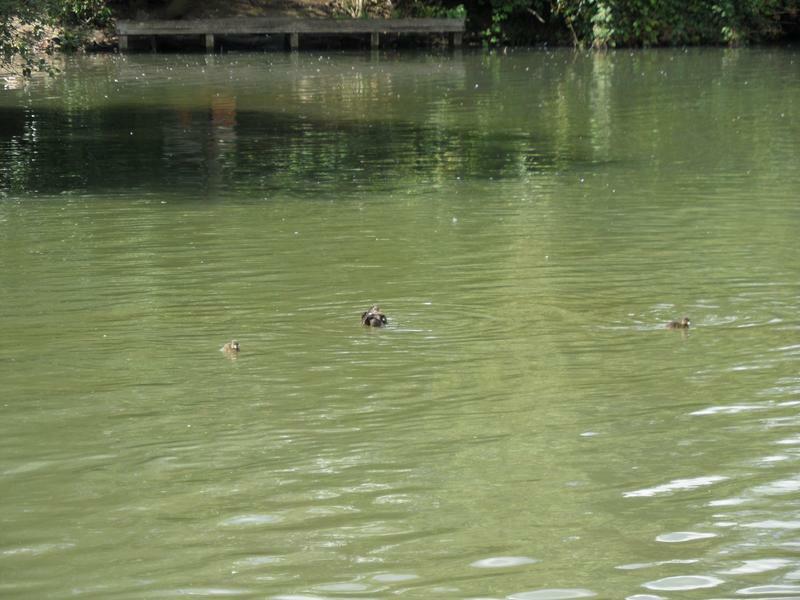 A Mallard duckling and mother, two or three weeks old, there should be many more. 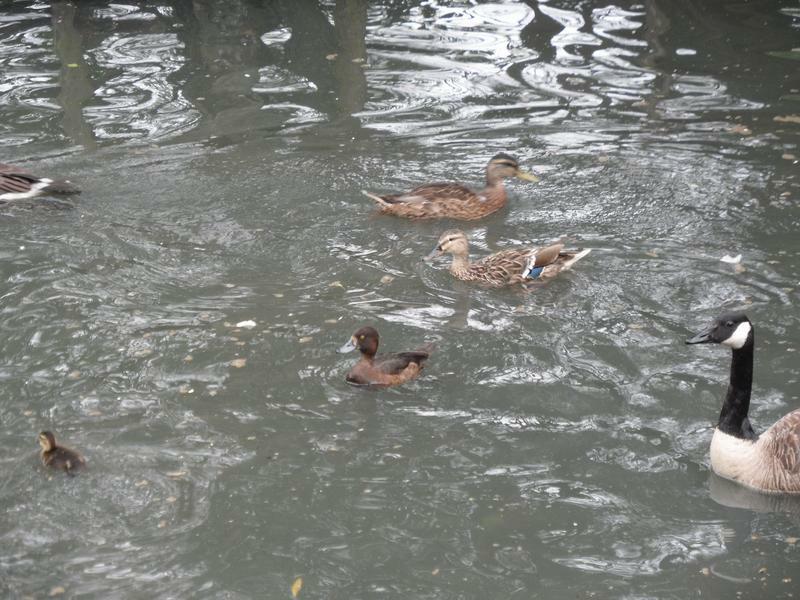 More ducklings, unfortunately they don't come close enough for better photos, and keep diving. 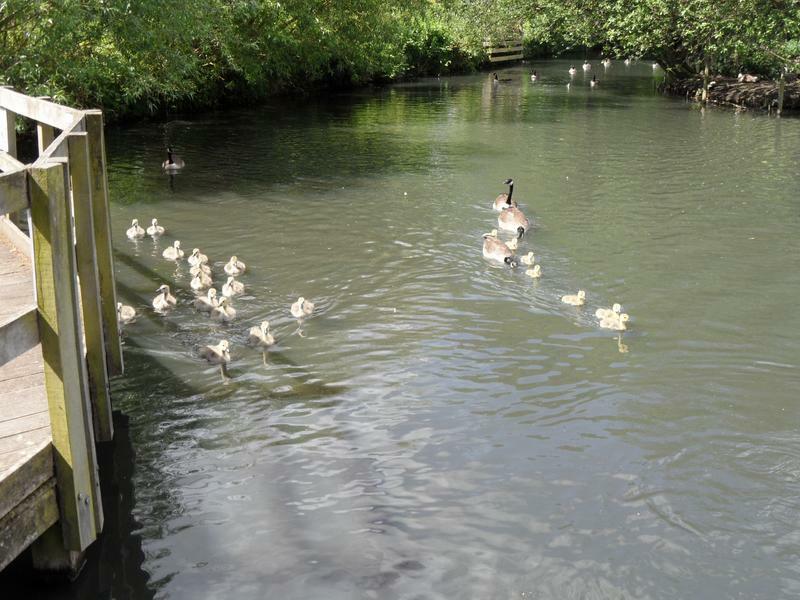 20th July 2014, some Coot chicks keeping away from the geese. 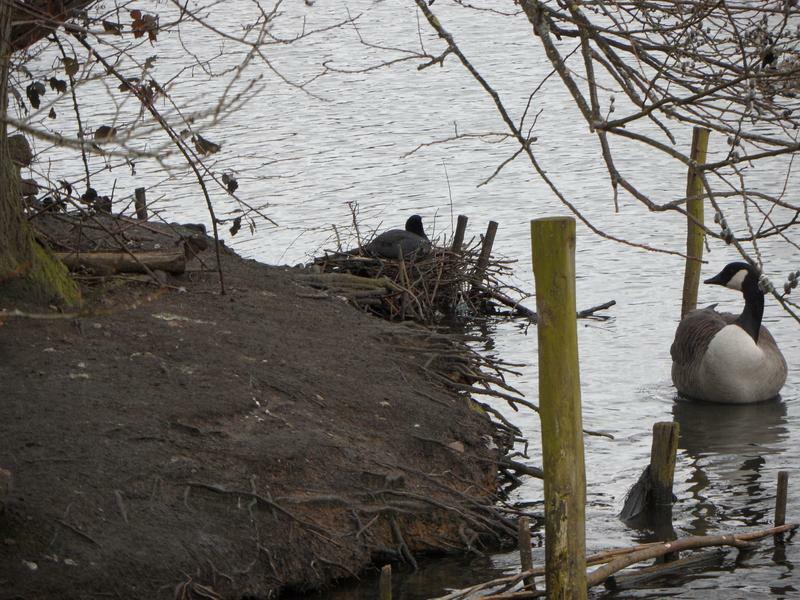 Coots on their nest on the small island. 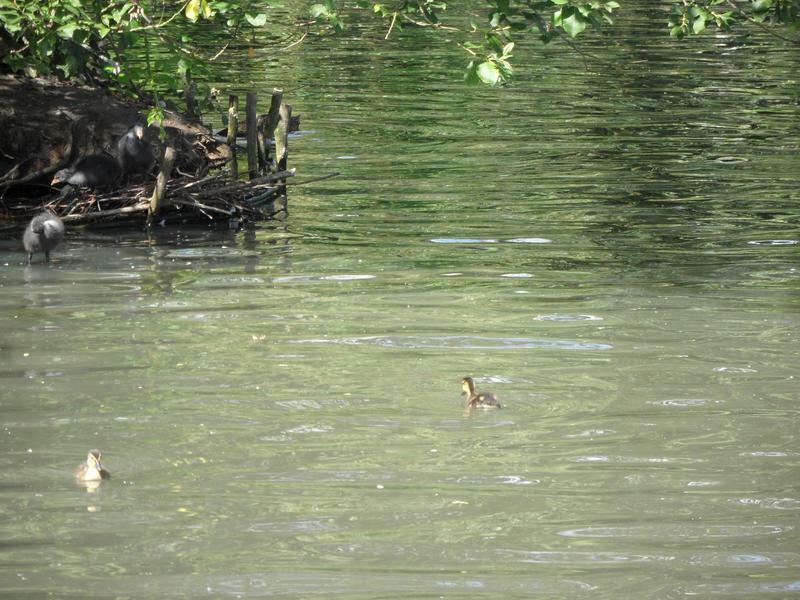 A Tufted Duck with her duckling, probably one or two weeks old. 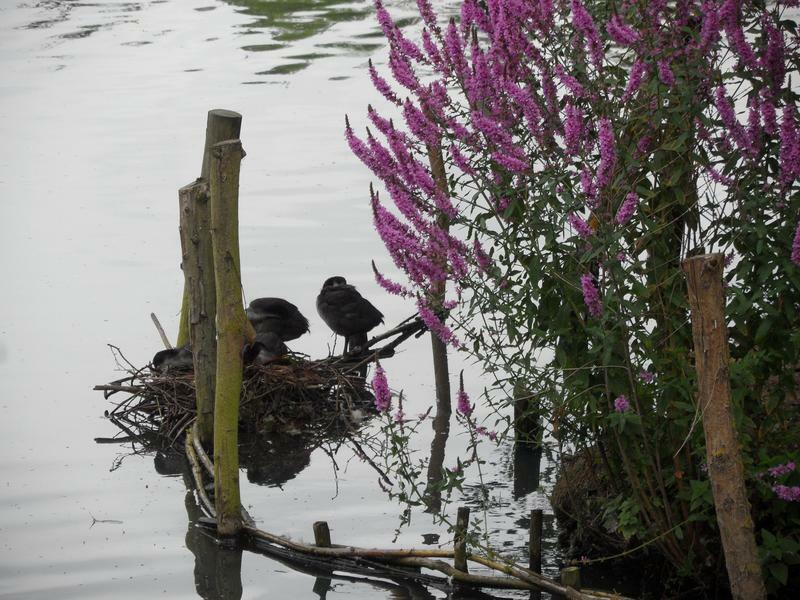 Rare to see Tufted Duck families. 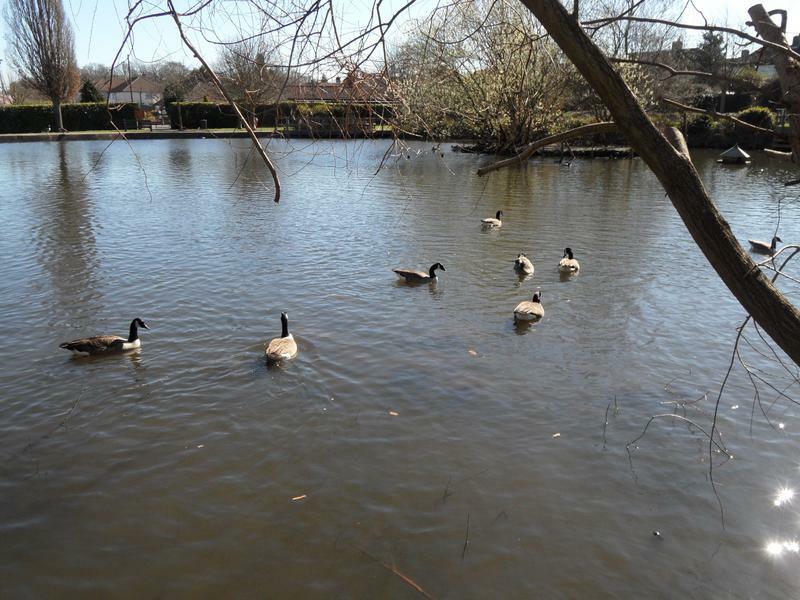 The ducks and geese are following us around the pond again. 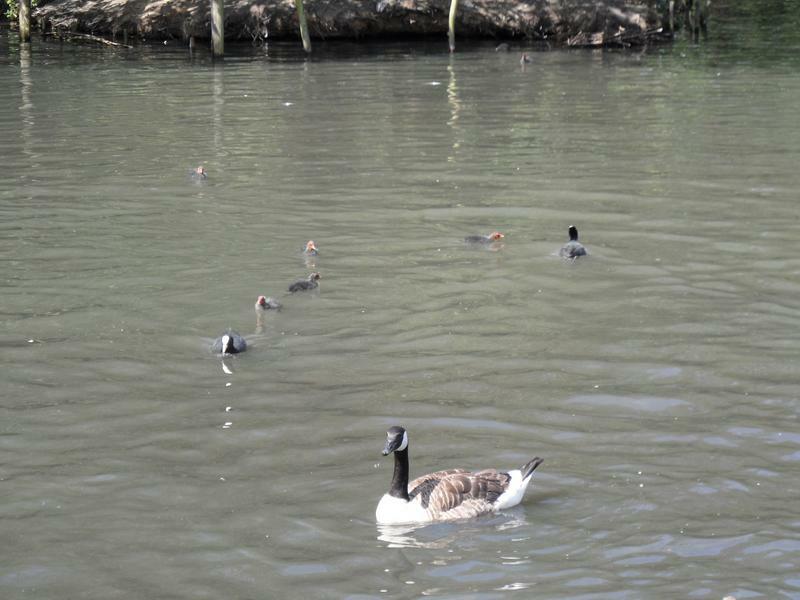 7th August 2014, the Coot chicks are still keeping away from the geese. 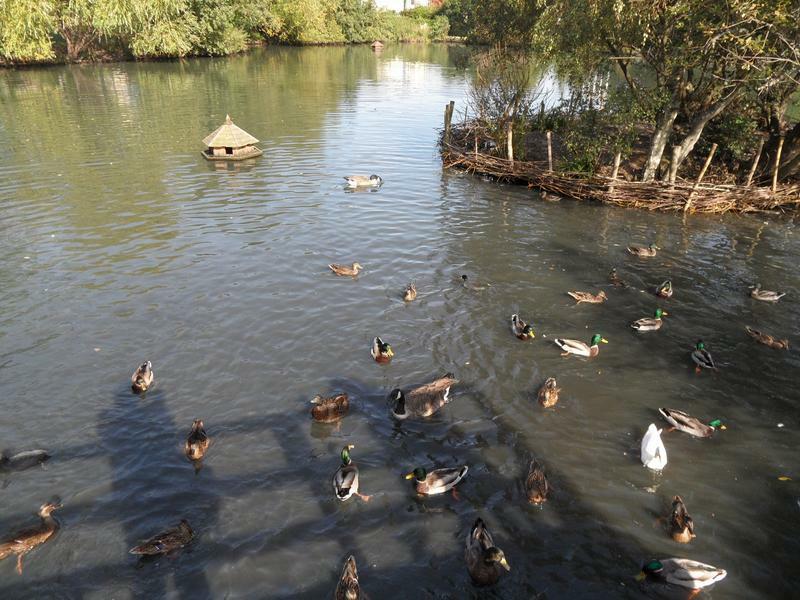 The small island is busy with ducks sleeping. 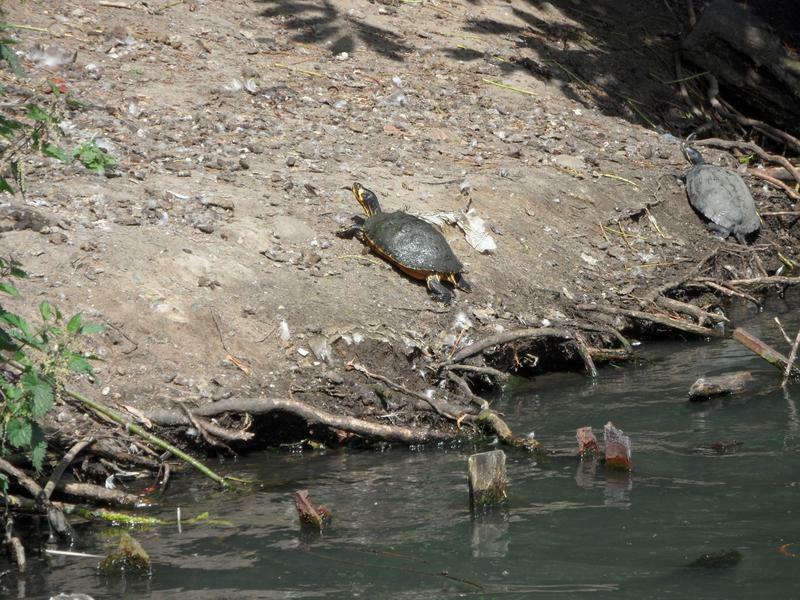 Only one turtle on the island this week, seems to heading back into the water. 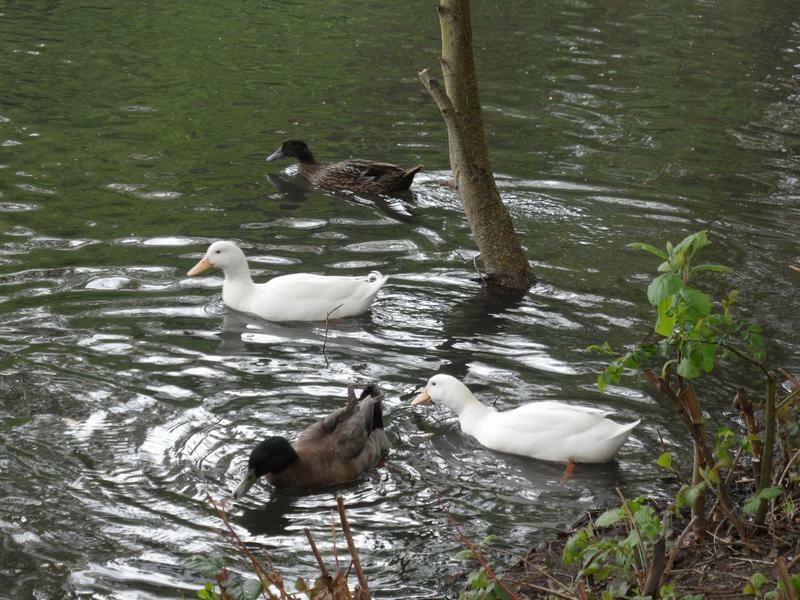 The reduced White Ducks family, used to be four. 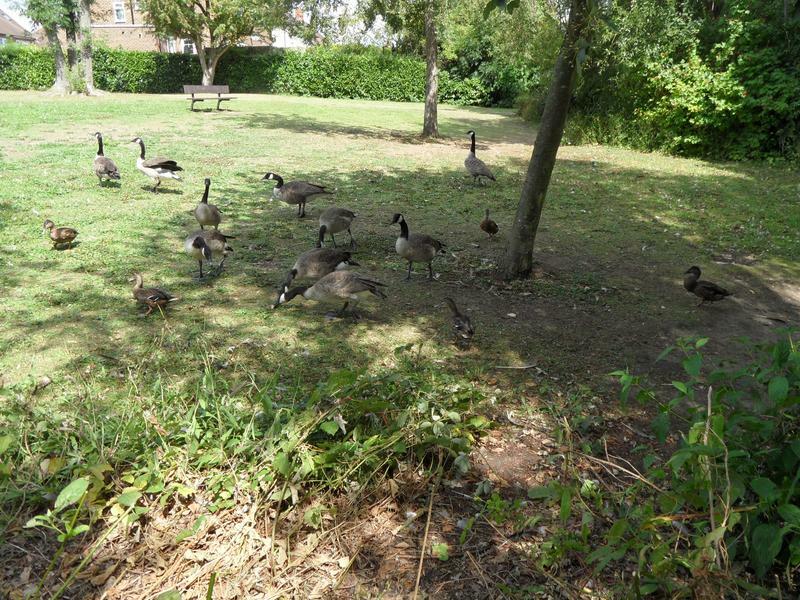 Seems to be fewer geese than normal. 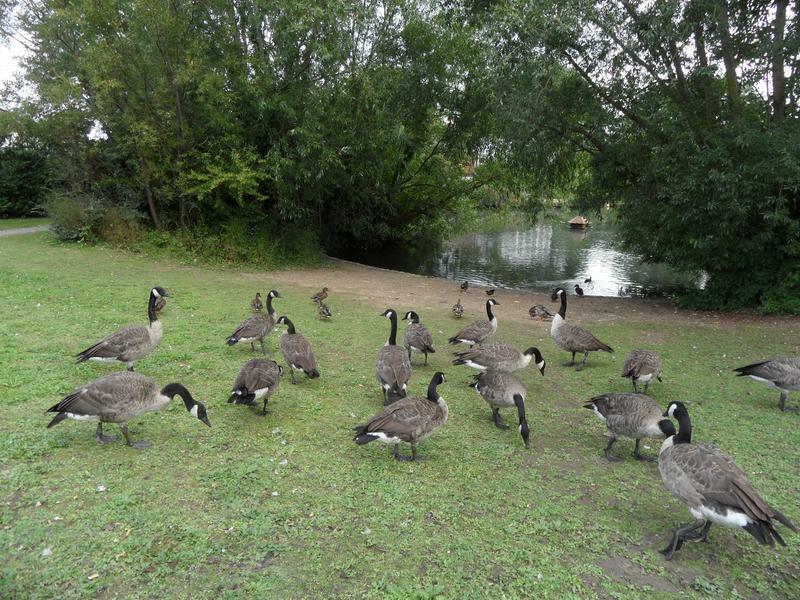 Geese and ducks on the grass. 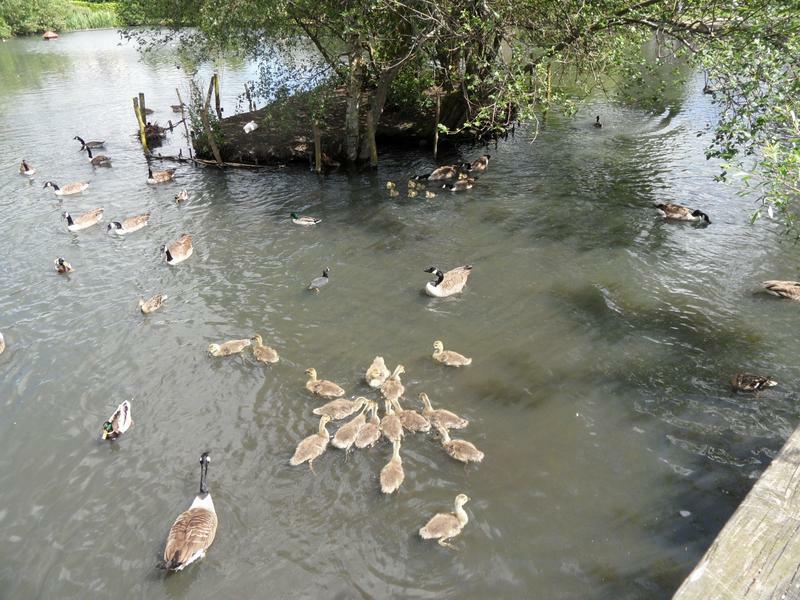 The Tufted Duck family in the distance, the ducklings keep diving, not easy to photograph. 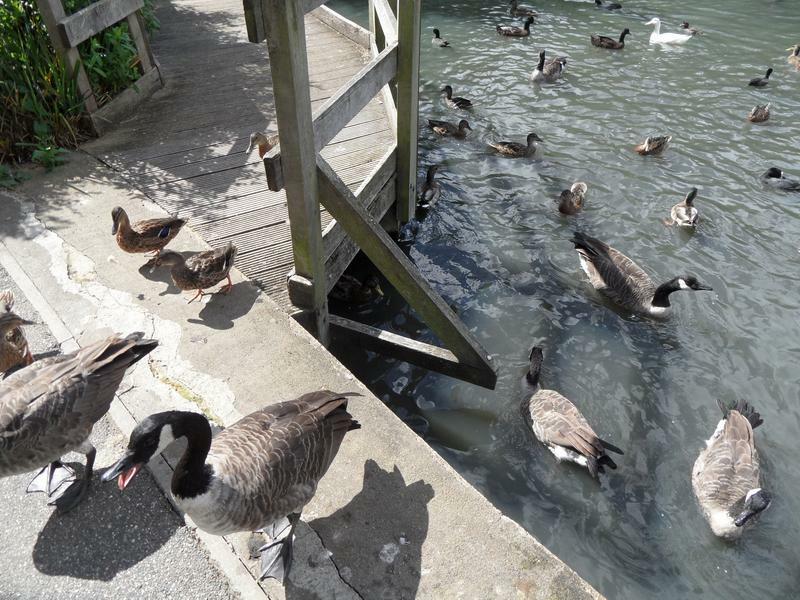 16th August 2014, the Tufted Duck family is still here, but a goose seems very aggressive. 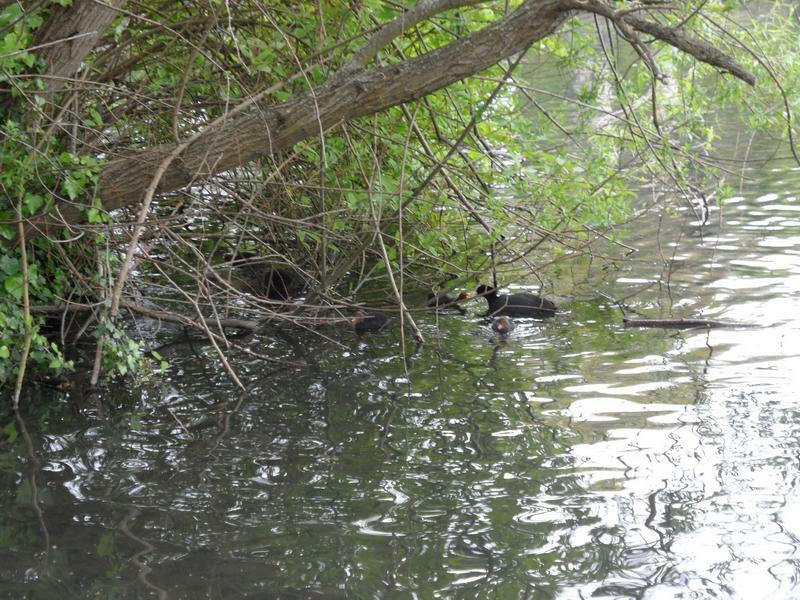 The Tufted duckling still keep diving. 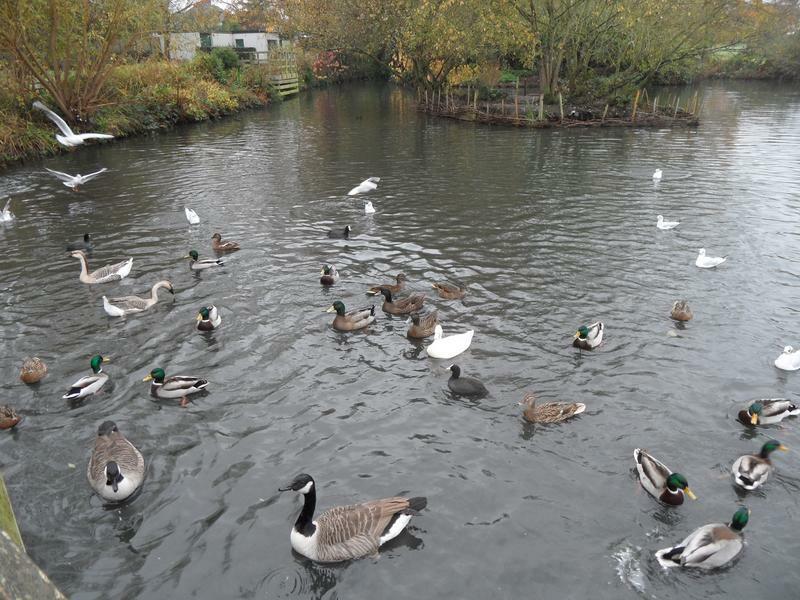 Good mix of Canada Geese, Mallard and Tufted Ducks and Coots today. 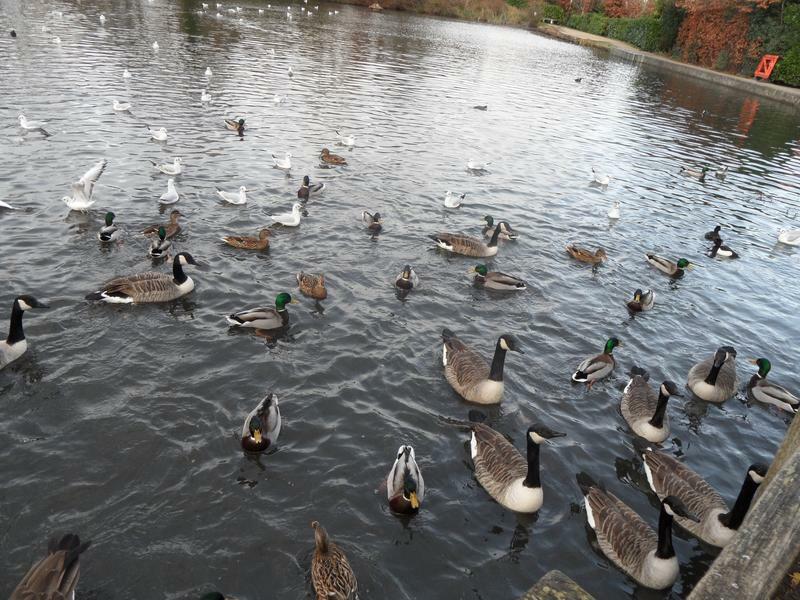 All very hungry as well. 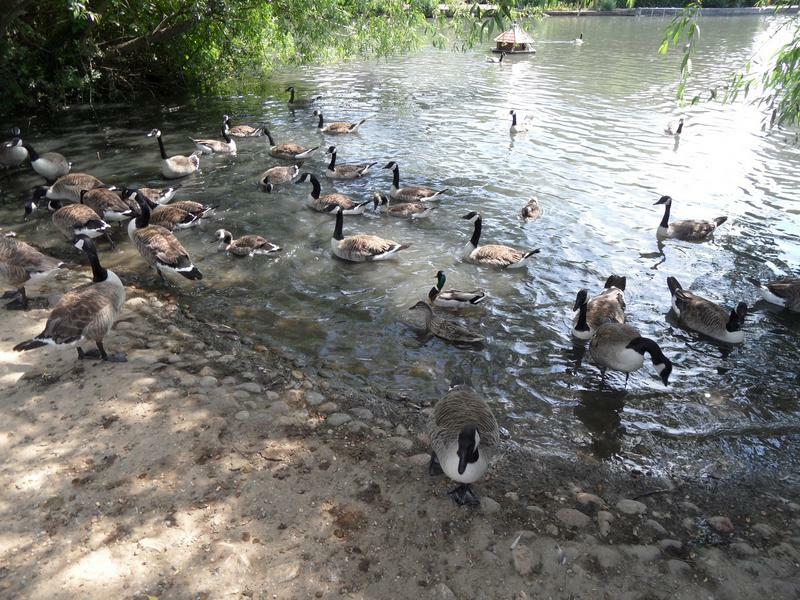 The geese at the beach. 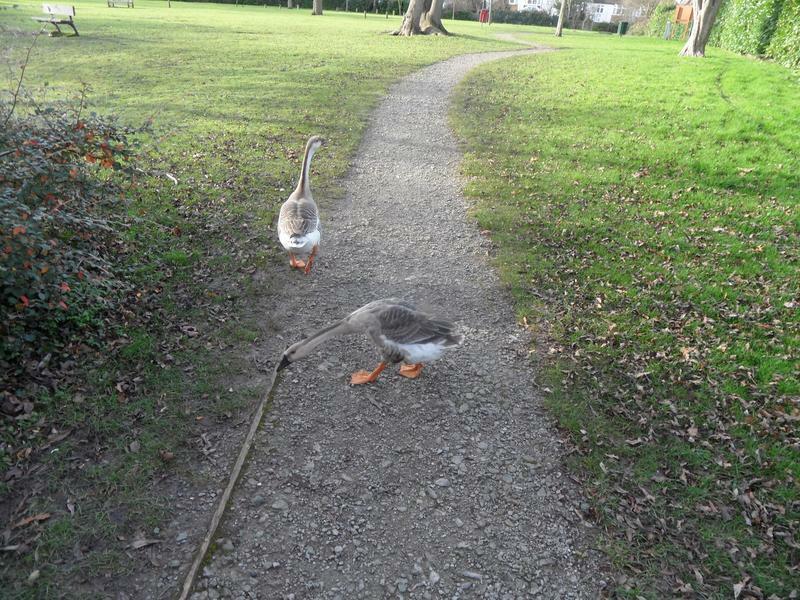 And they've now followed us up onto the grass. 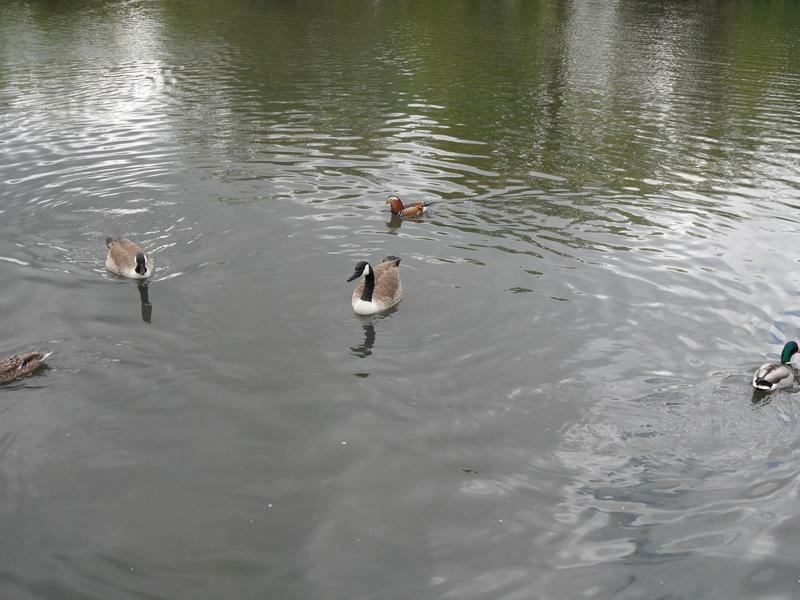 Still following us as we walk around the pond. 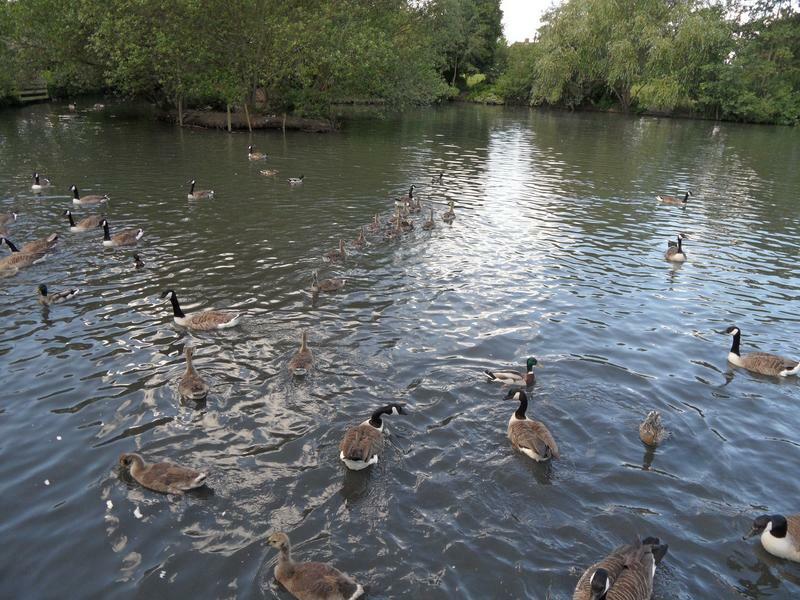 31st August 2014, still lots of hungry geese and ducks. 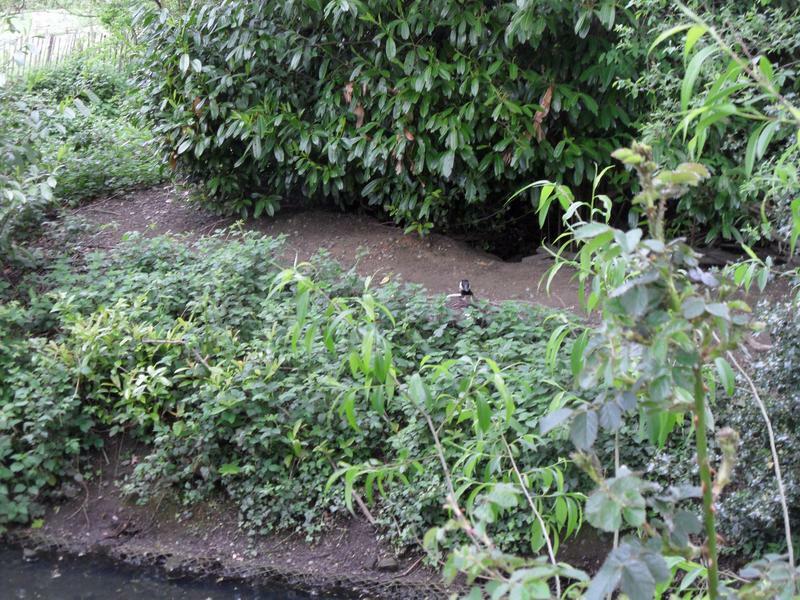 But no Tufted Duck family, perhaps they've flow away. 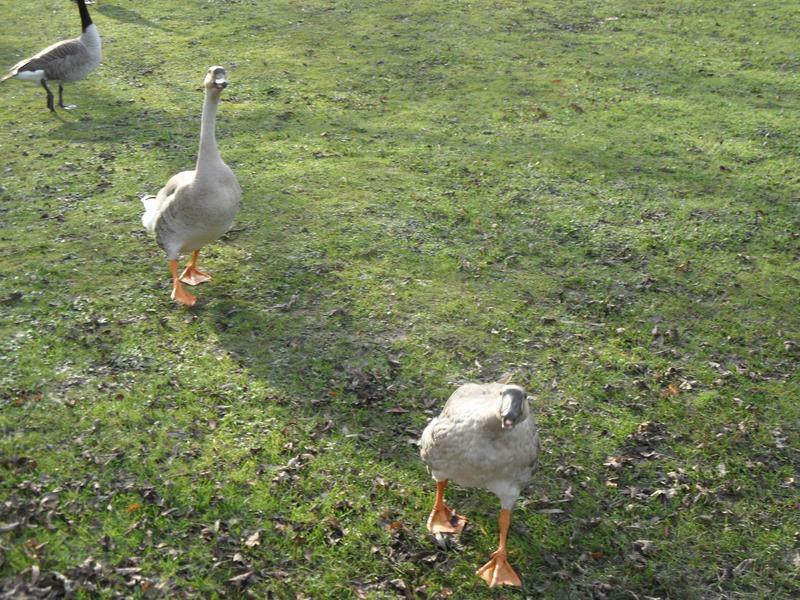 Looking for food on the grass. 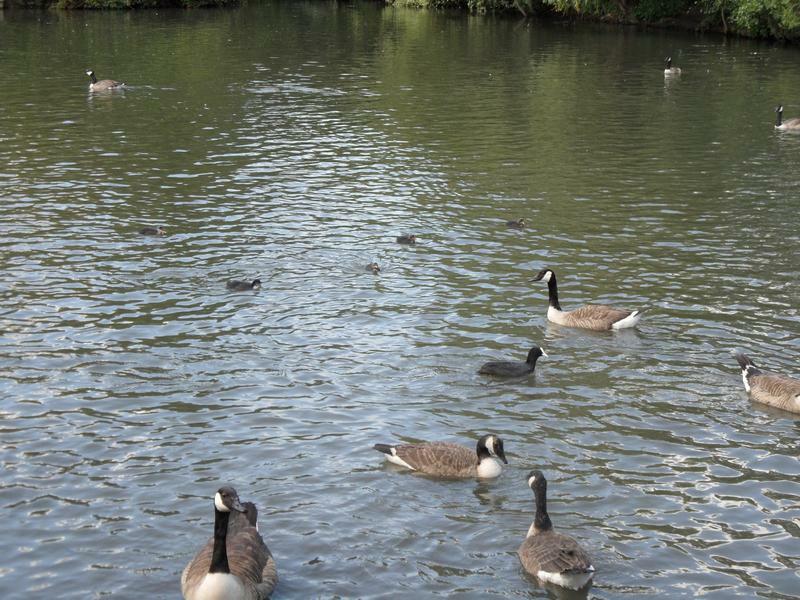 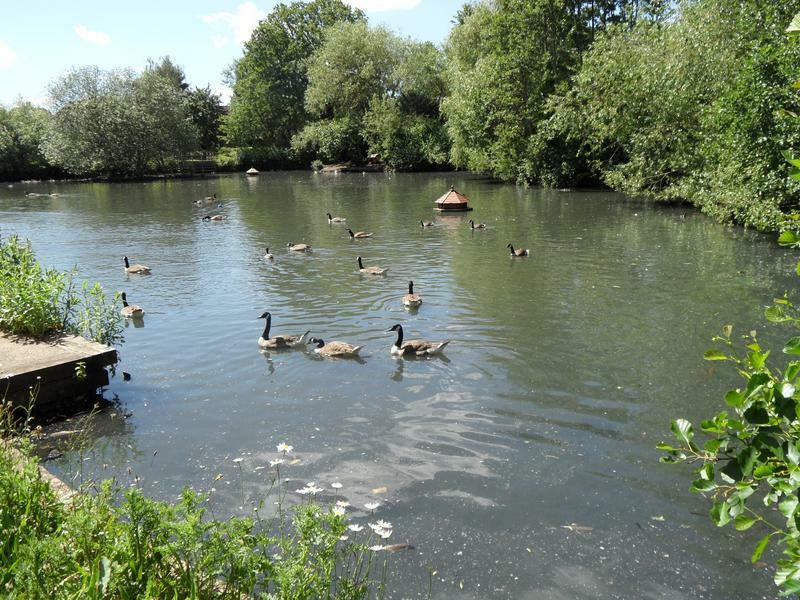 14th September 2014, two weeks later, the pond is much quieter, most of the Canada Geese have left. 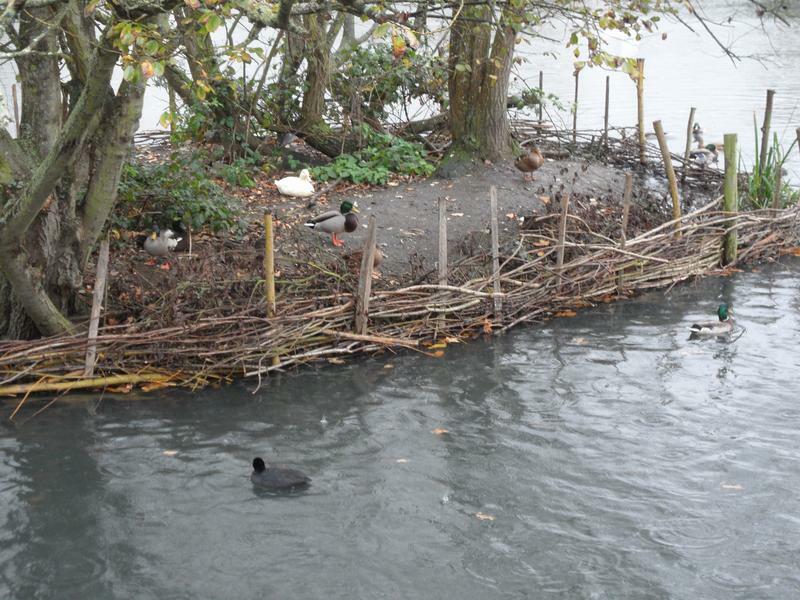 The Coots have incorporated their nest into the new fencing. 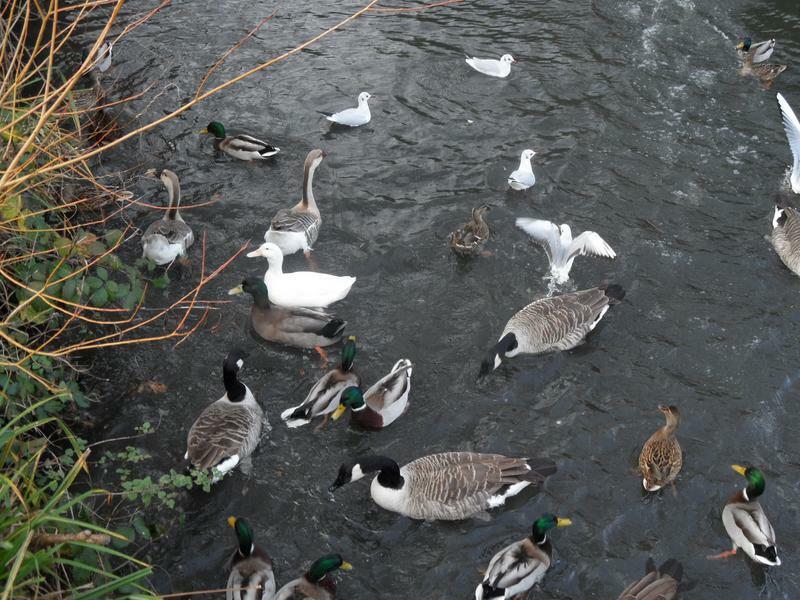 Far fewer birds looking for food this week. 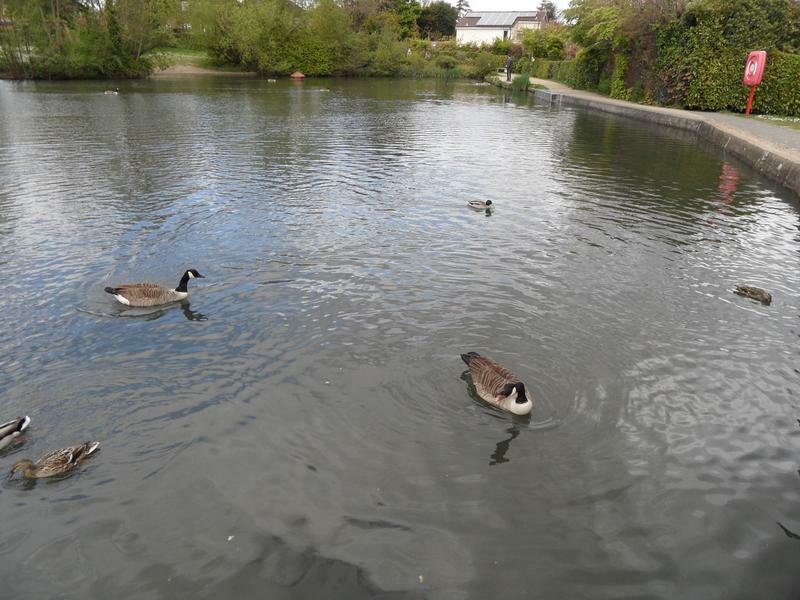 The pond is very tranquil. 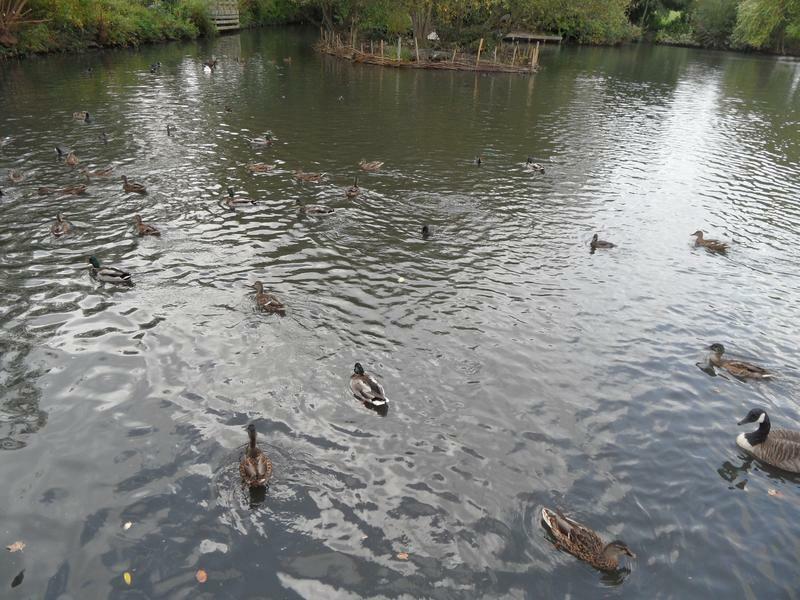 28th September 2014, again it's mostly Mallard Ducks this week, only a couple of geese. 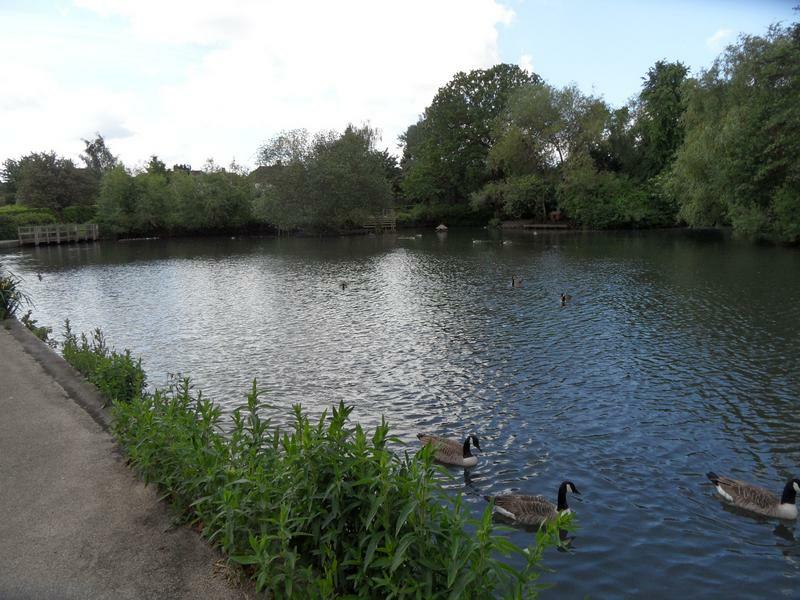 The beach is almost deserted. 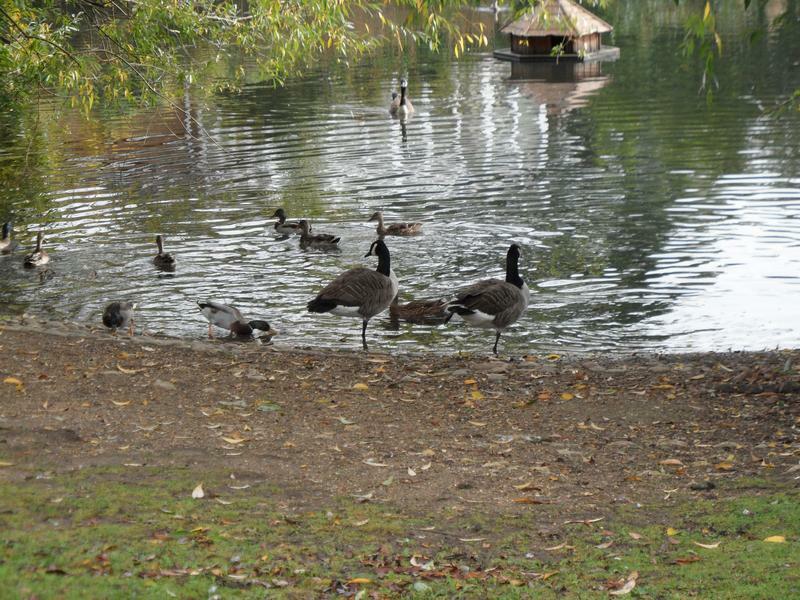 But they are still following us around the pond looking for food. 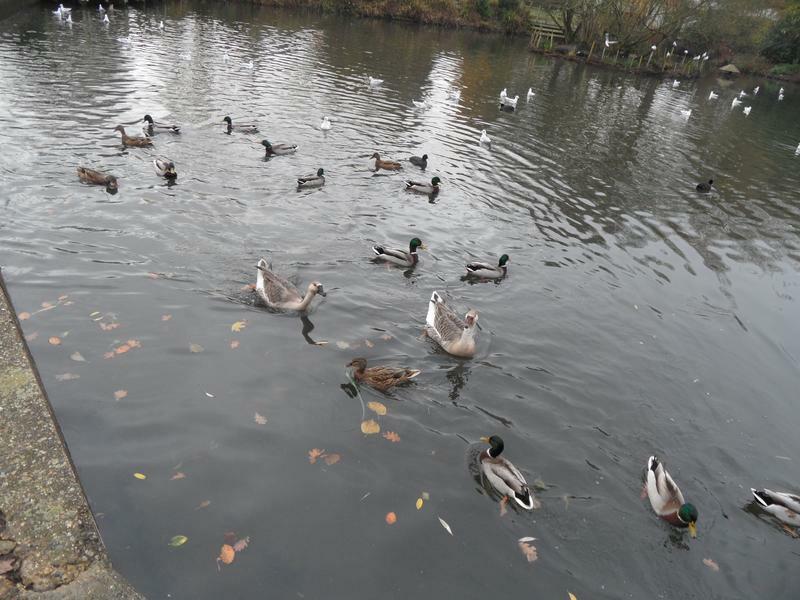 12th October 2014, a very peaceful and quiet pond today, and virtually no interest in food, do not even finish a single loaf. 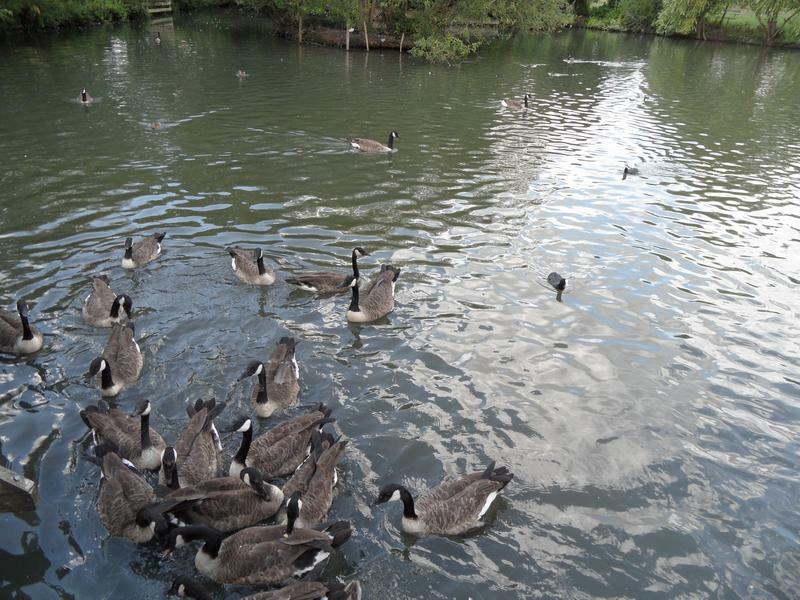 Even the Canada Geese are not hungry. 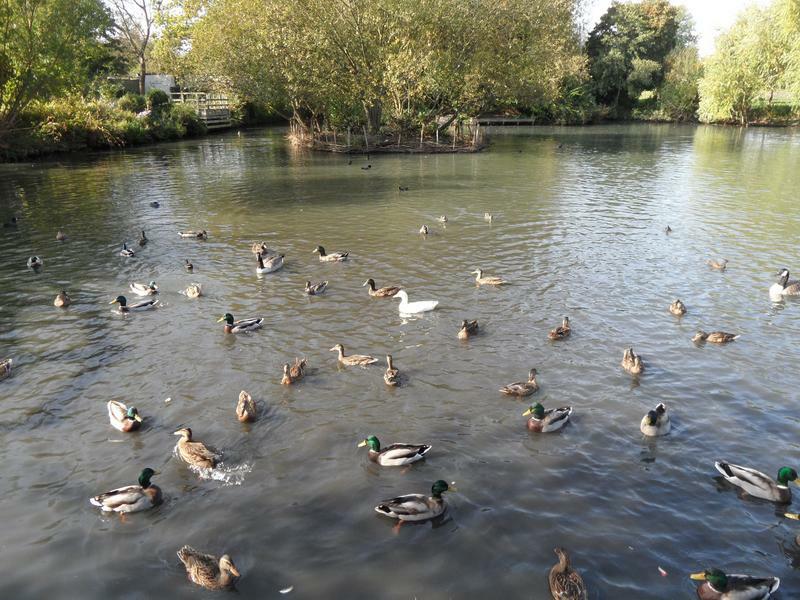 Fewer birds does mean the natural food in the pond goes further. 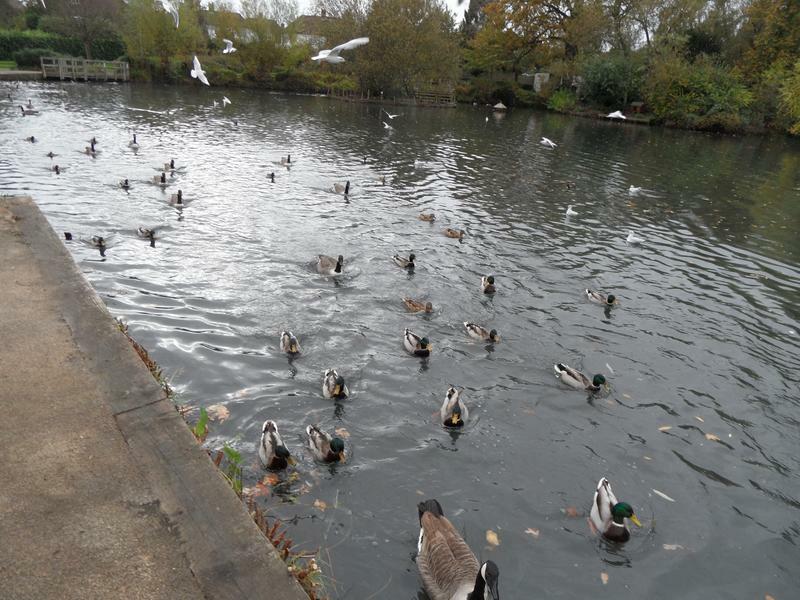 A few lumps of floating bread, not yet eaten. 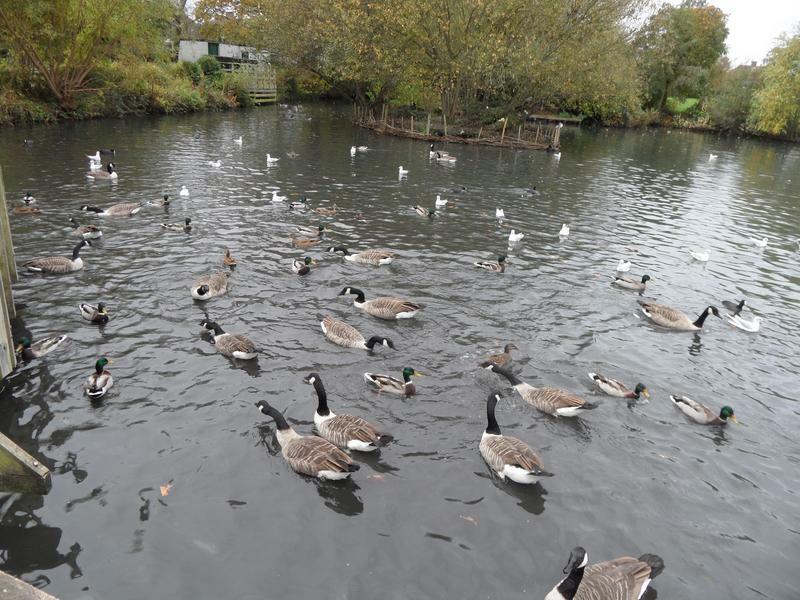 26th October 2014, plenty of Canada Geese here today, a few sea birds. 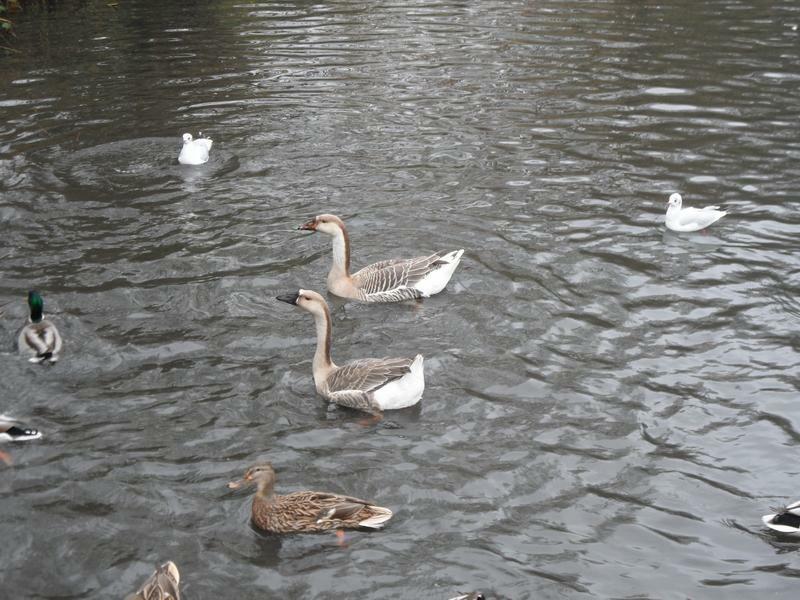 Jumping out of the water looking for food. 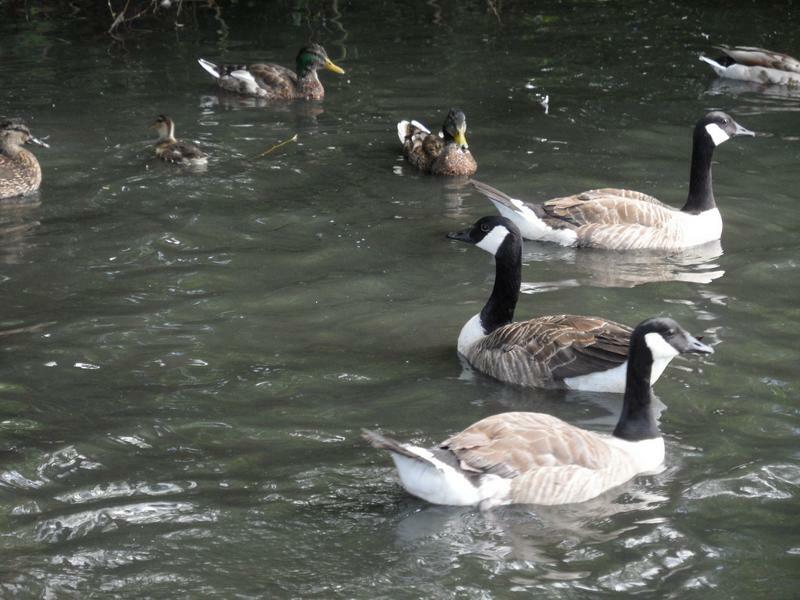 All following us around the pond. 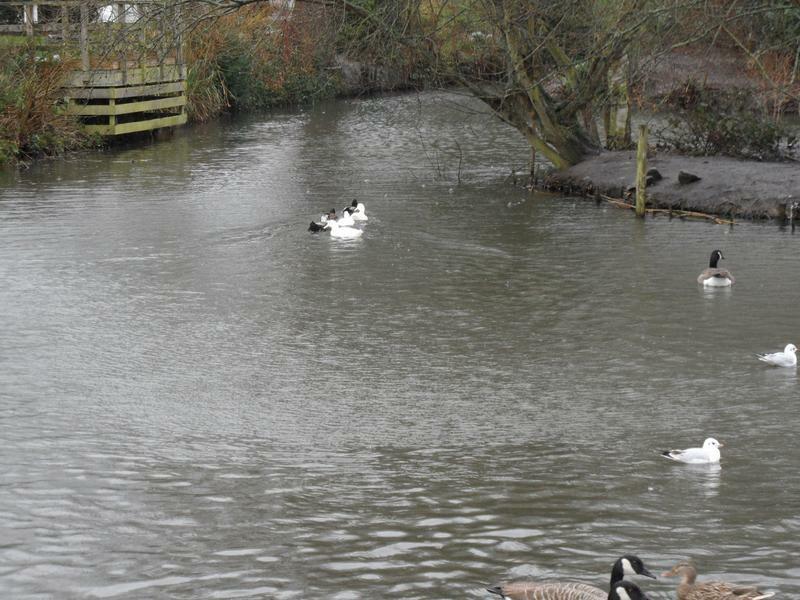 Lucy the dog taking a paddle. 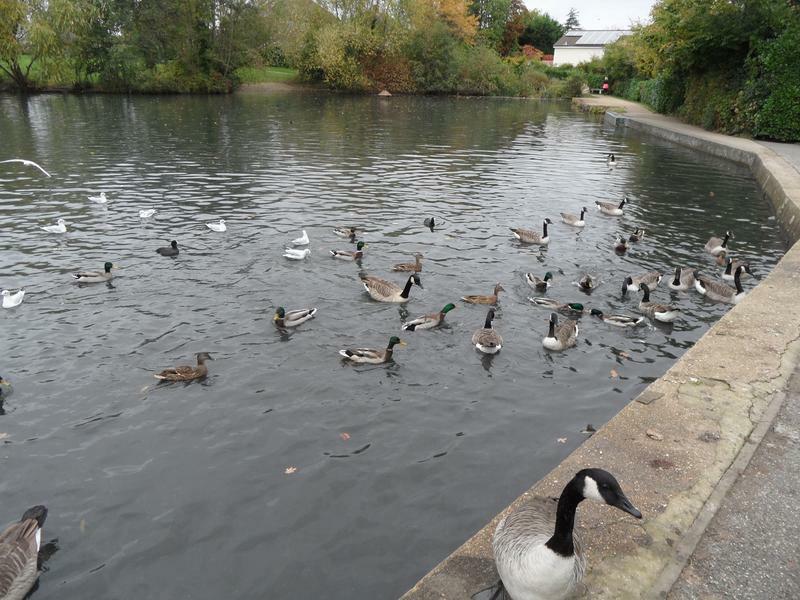 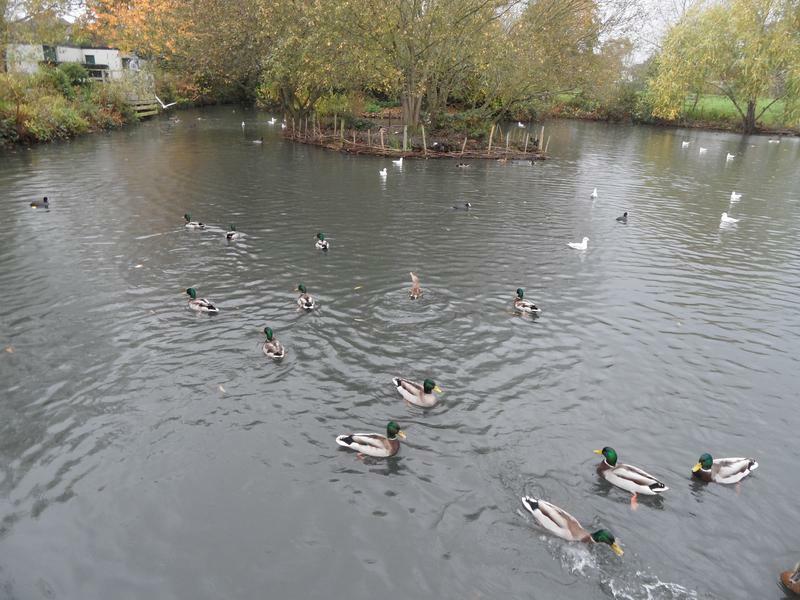 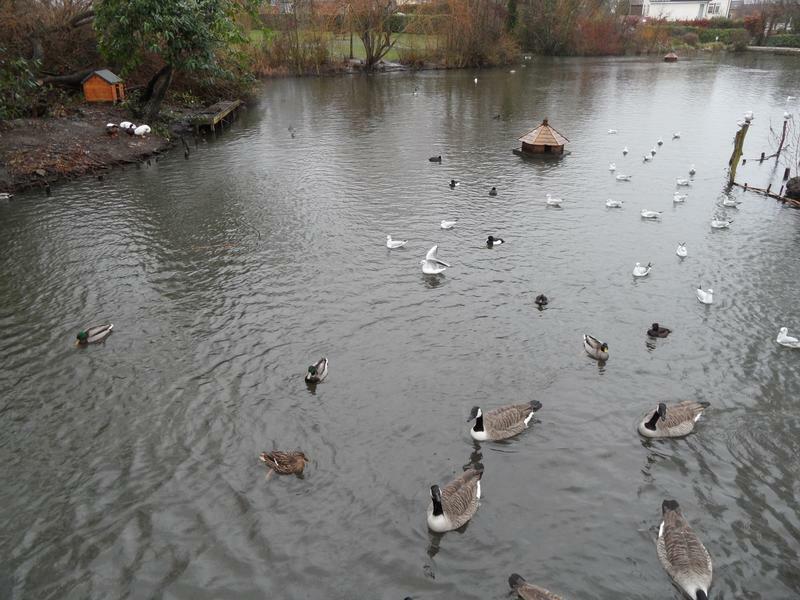 2nd November 2014, a week later and it's all gone quiet again, almost no geese, no-one is very hungry. 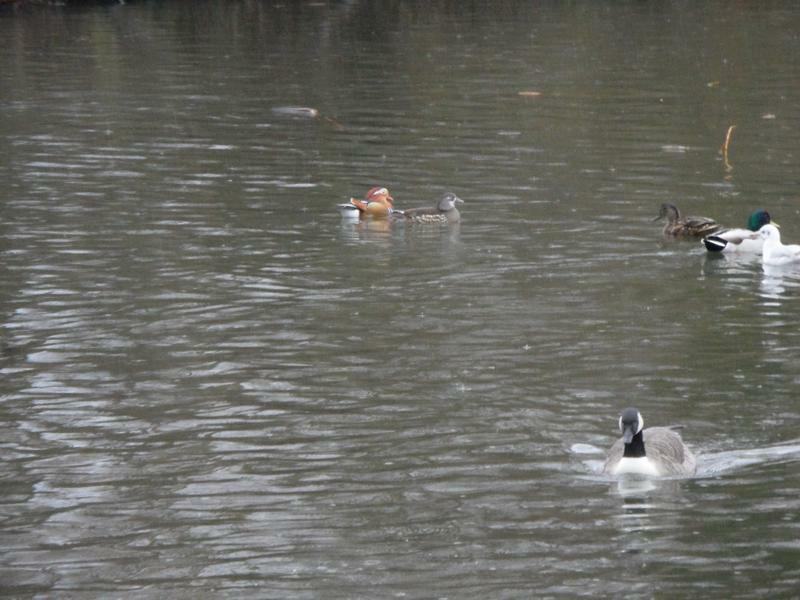 It is raining though. 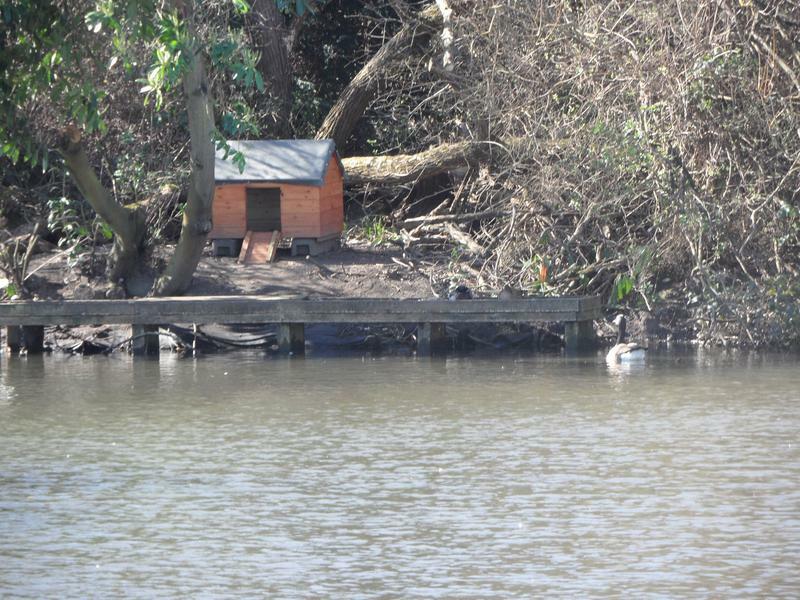 A few residents on the small island, which seems to still be getting smaller due to erosion. 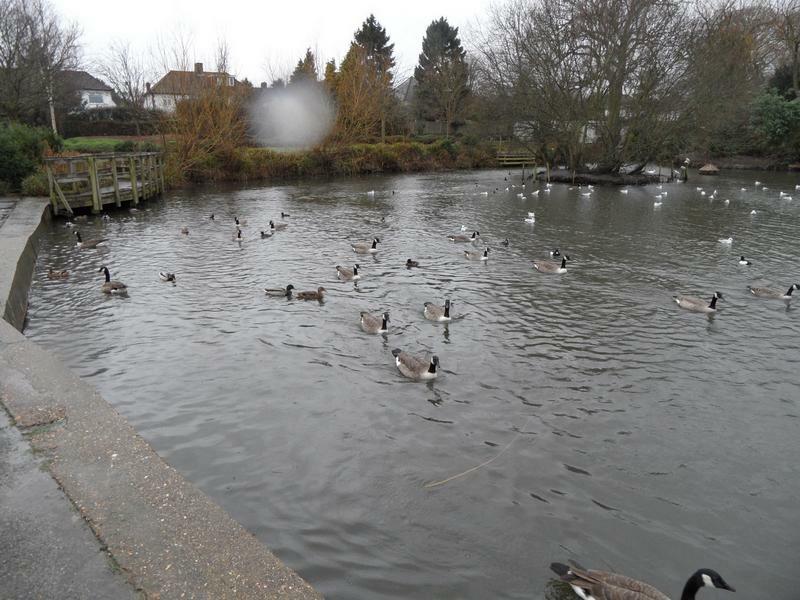 16th November 2014, two weeks later some geese are back and everyone is hungry. 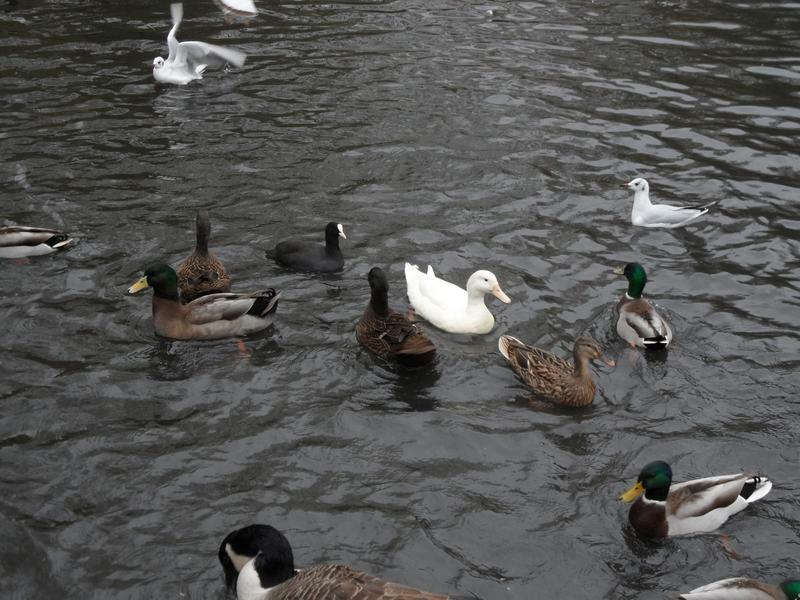 The remains of the white duck family. 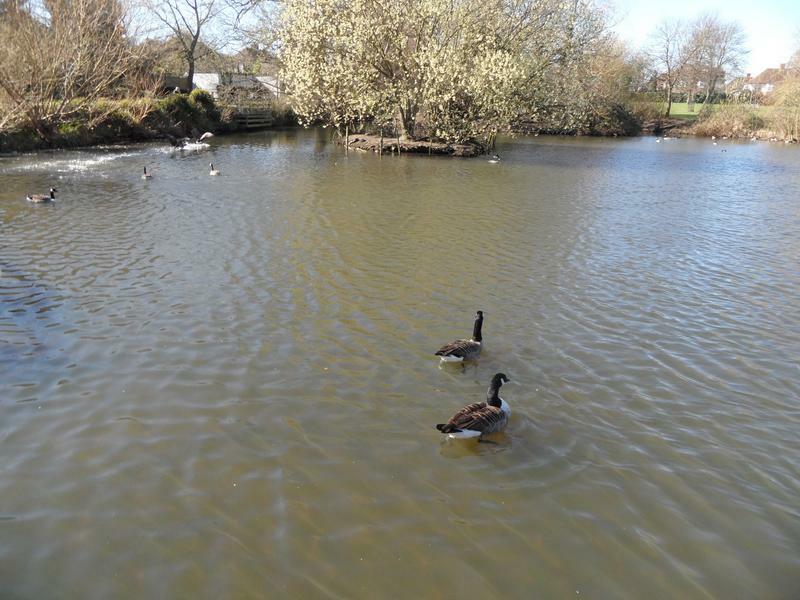 Two new residents to the pond, a pair of Beck Geese, winter visitors from North Europe. 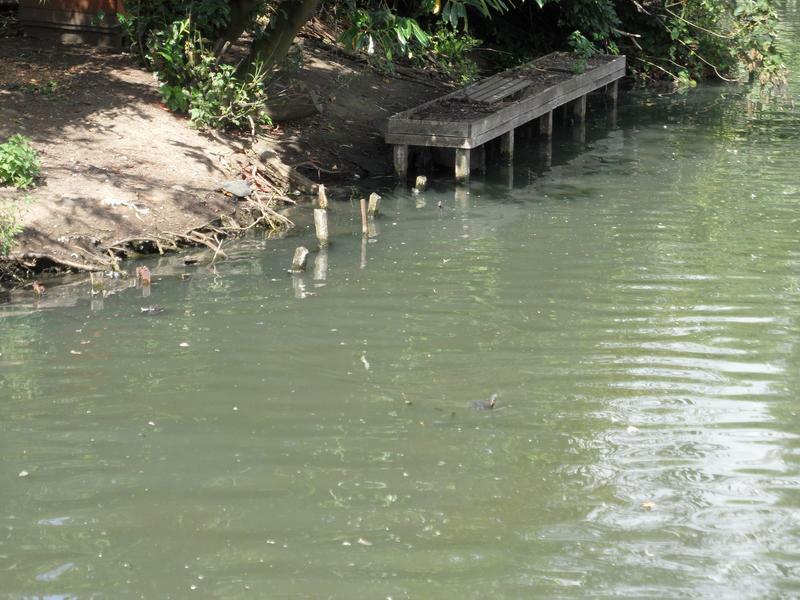 The channel near the large island. 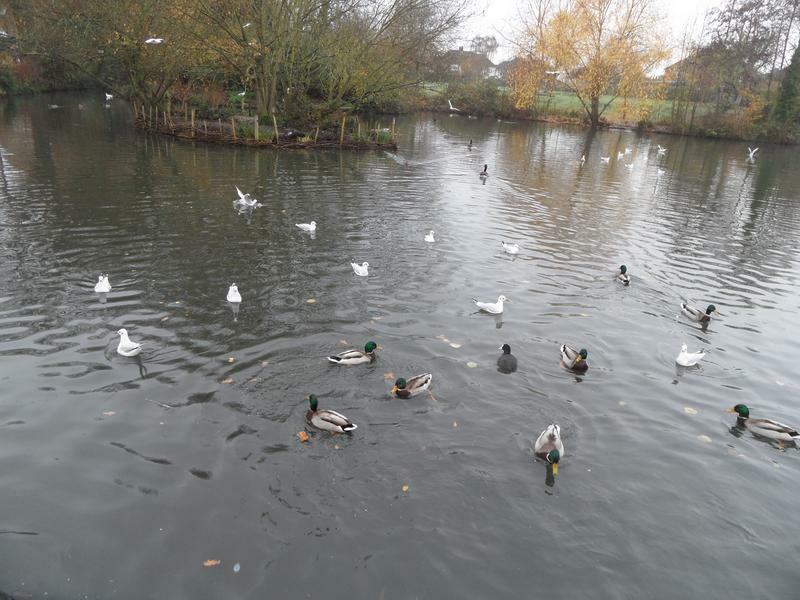 30th November 2014, a lot of sea birds swooping around but quiet again, no-one seems hungry. 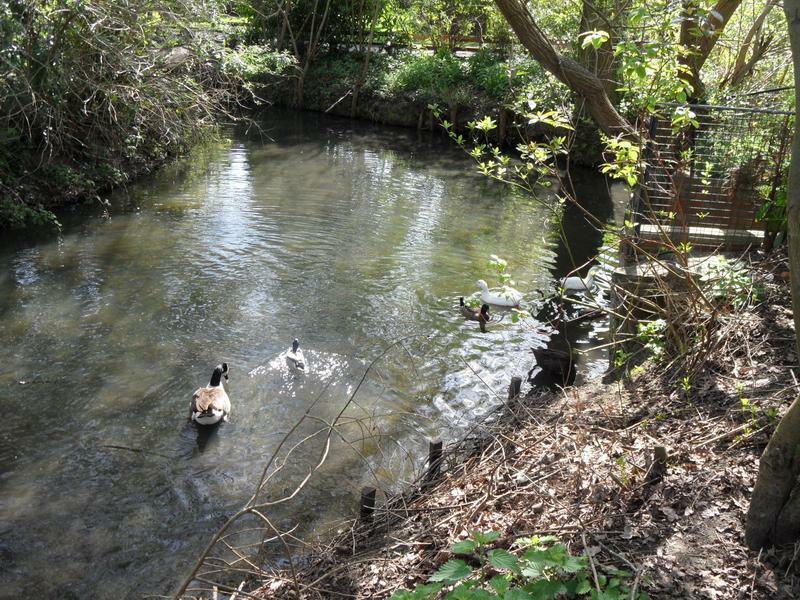 Apart from the new Beck Geese. 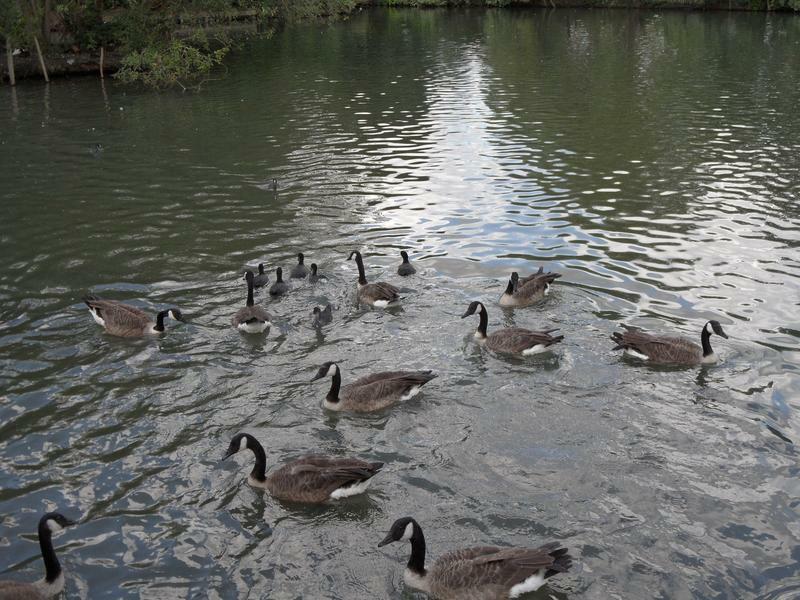 Who follow us around the pond. 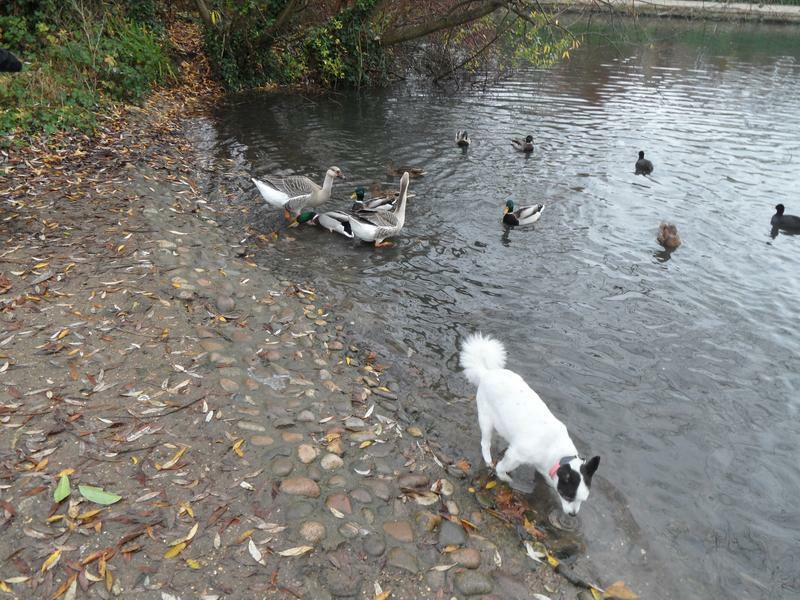 And come to say hello to Lucy. 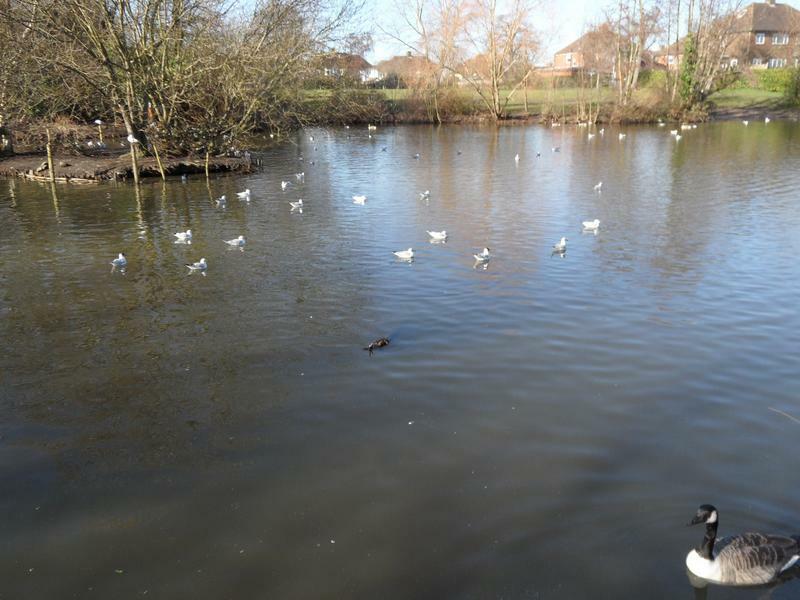 Trying to feed the Moorhens on the large island, which is a very long throw, sometimes successful. 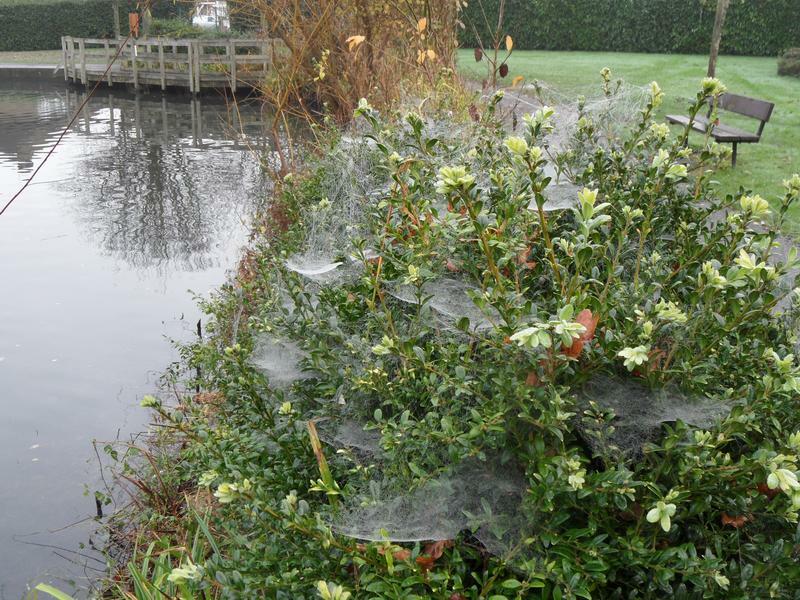 Some wonderful cobwebs highlighted by dew. 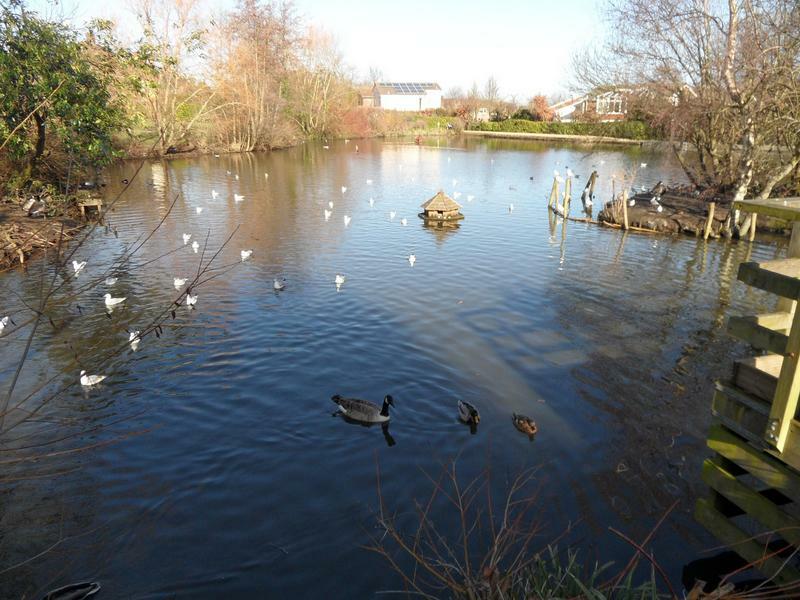 7th December 2014, a week later and the pond is busier again. 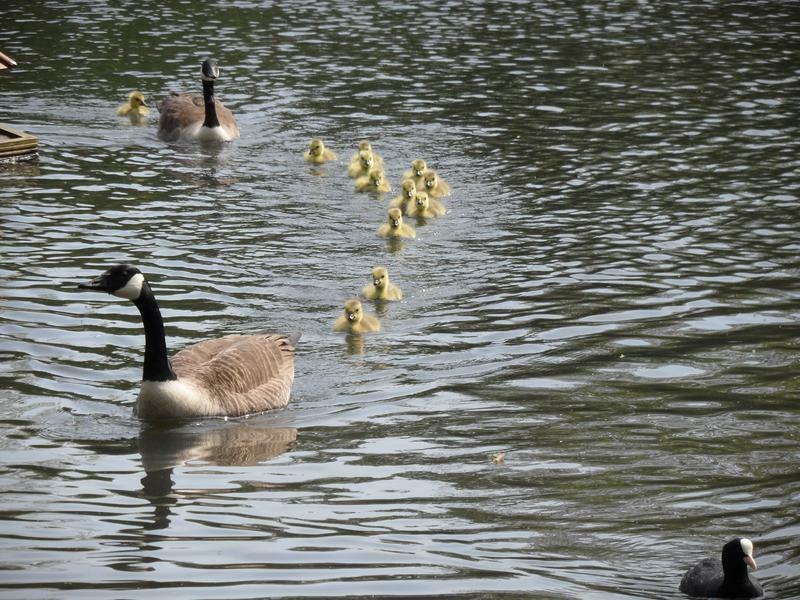 Following us the other way around the pond. 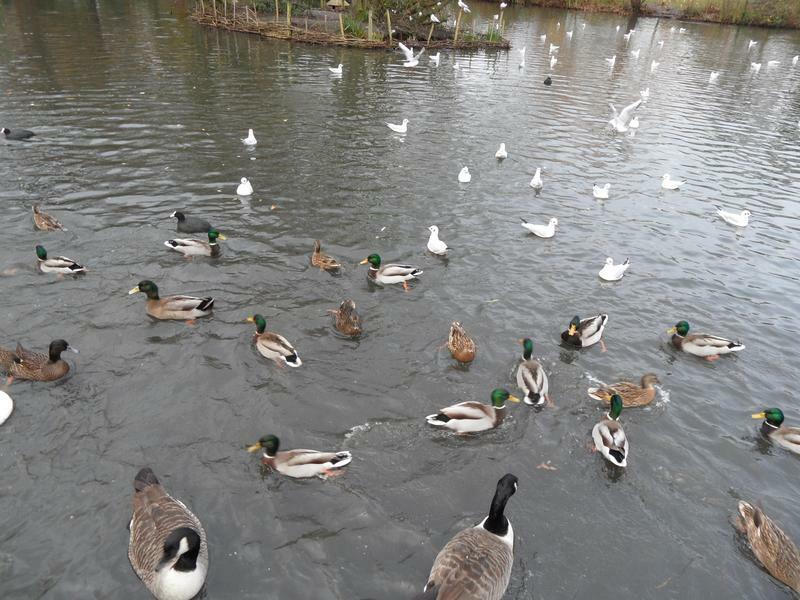 The sea birds have caught on to my throwing bread to the island for the Moorhens and fight them for it. 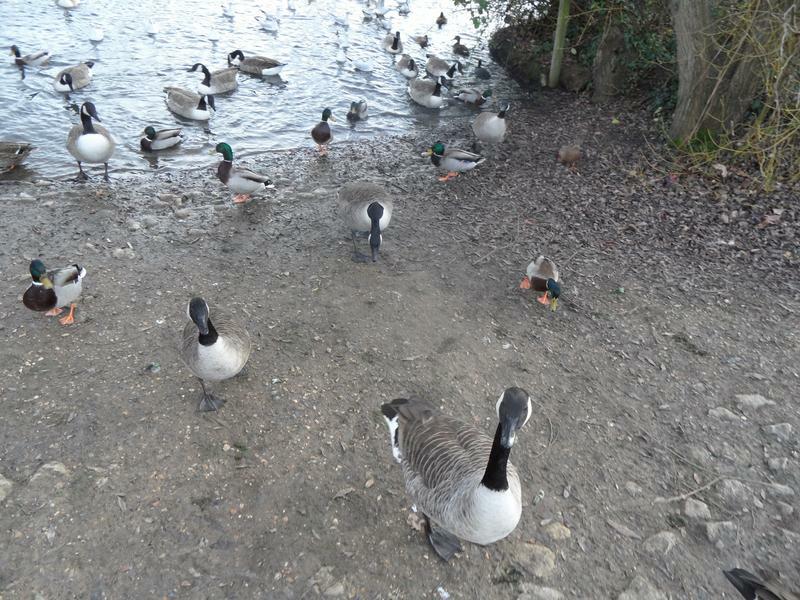 21st December 2014, busy this week, they eat three loaves of bread, and more if we'd brought it. 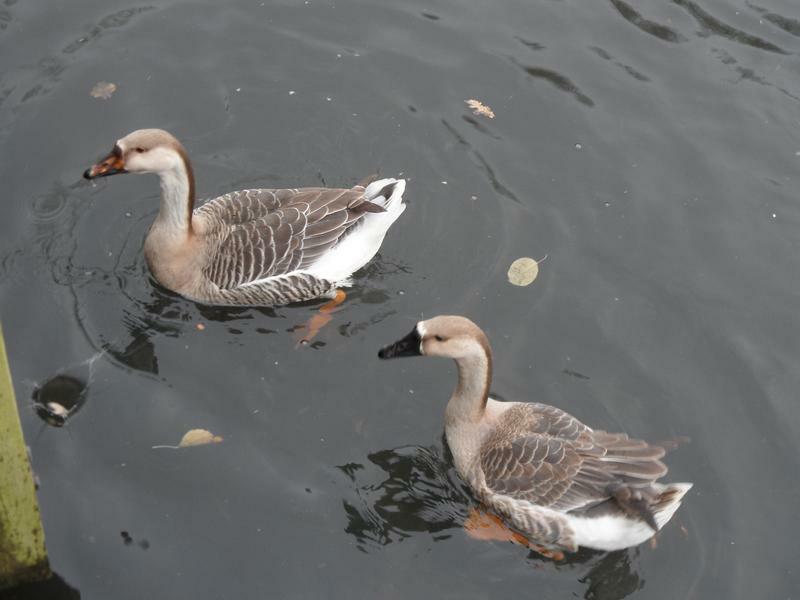 The two new Beck Geese are still here after several weeks. 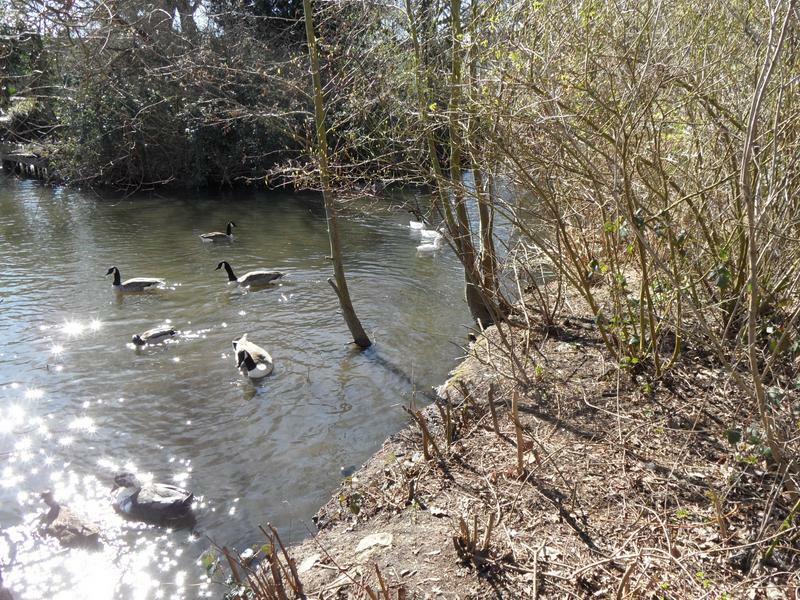 A goose climbing the bank look for bread that never reached the water. 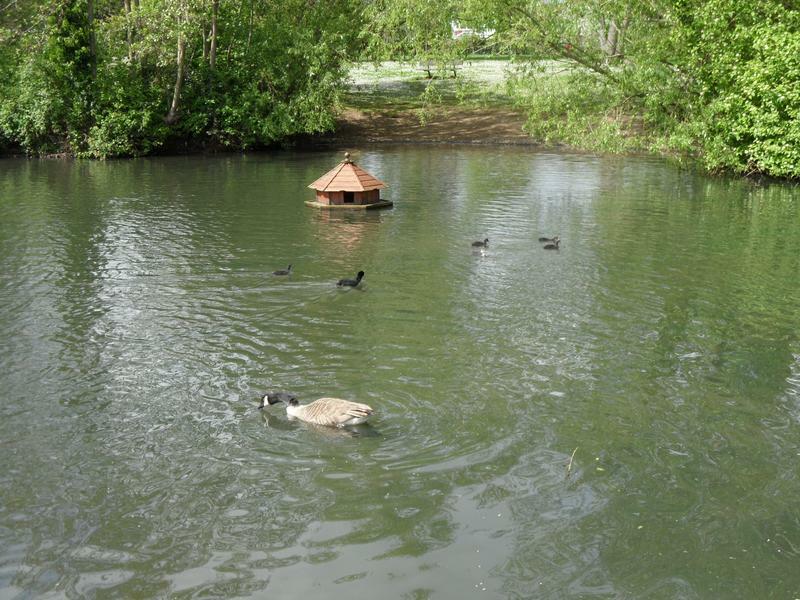 The new Beck Geese are following us around the pond. 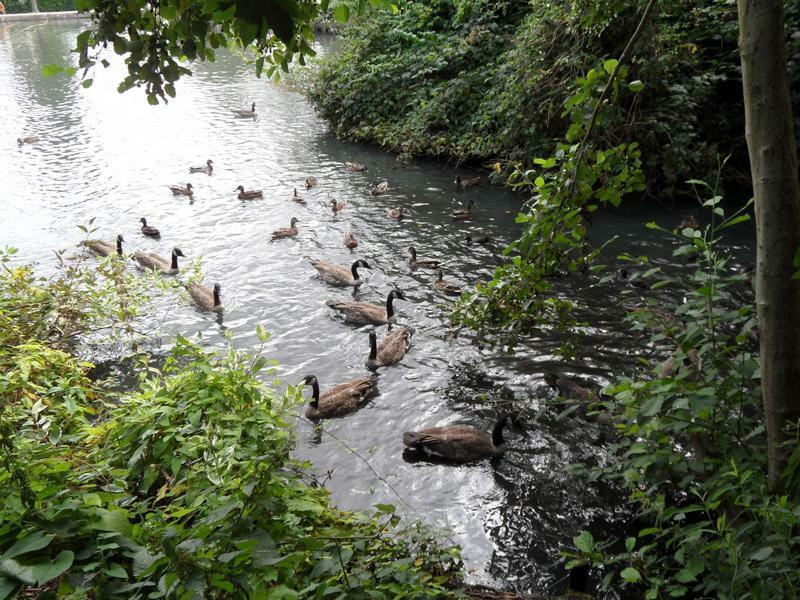 Several geese and ducks come out of the water still hungry. 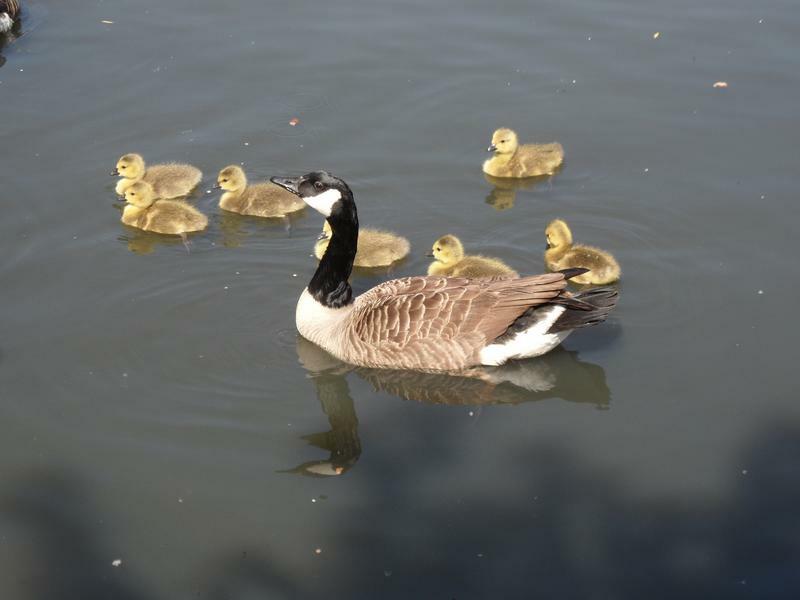 Including the new Beck Geese. 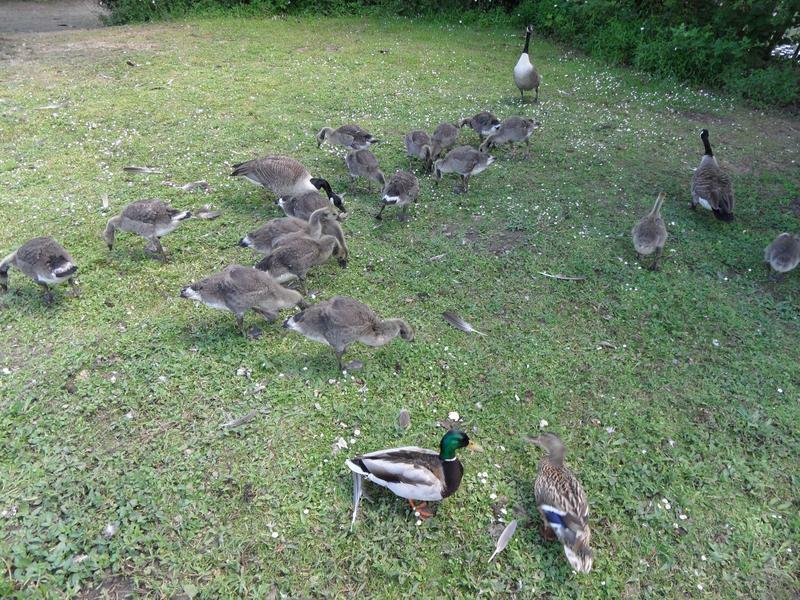 feeds them each day and they follow back to his house.